Hey, pitchers and catchers report in just about 10 days. Excellent! But its been a slow month for baseball. So slow, in fact, that I recently saw an article “reporting” that Derek Jeter was hitting in a batting cage with his team’s hitting coach. Wow, that’s shocking “news”! For some reason, I was recently thinking about the Australian flag, which of course features six stars. Before long, I figured I should replace those stars with the Houston Astros’ star logo in honor of C&S Hall of Famer and new Astro, Ryan Rowland-Smith. 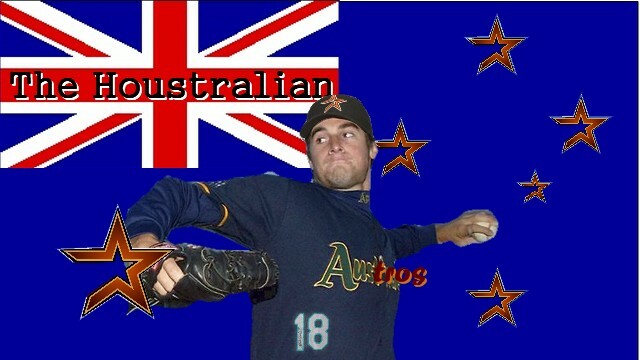 After combining the Australian flag and the Astros’ logo, it was only logical to go the extra step and create a nickname for RRS with another Australia-Houston Astros smash up. So, I came up with “The Houstralian.” Of course, “Australia” also blends nicely with “Astros” — so I modified RRS’s jersey to read “Austros.” (I also modified it by adding the “18” from my RRS Mariners jersey). So there you go MLB play-by-play announcers and color commentators, feel free to start tossing around “Ryan ‘The Houstralian’ Rowland-Smith” or the more formal “Ryan ‘The Houstralian Austro’ Rowland-Smith” while commentating. Is its baseball season yet? 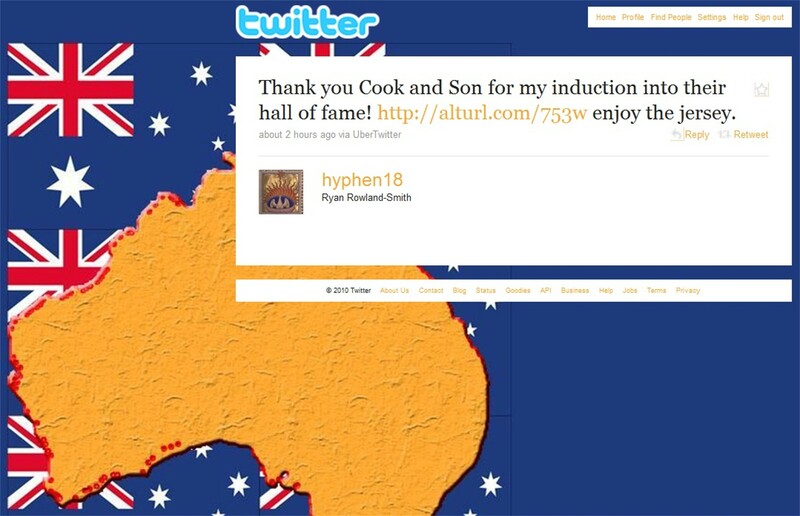 The Cook & Son Hall of Fame was established in 2009 as a way of honoring and thanking certain individuals who, for a variety of baseball-related reasons, are particularly important to Cook & Son. The Cook & Son Hall of Fame is open to players, coaches, broadcasters, stadium attendants, fans or anyone else who, in the sole and unfettered discretion of Cook & Son, are deemed worthy of enshrinement. 2010 was a long and fun season. 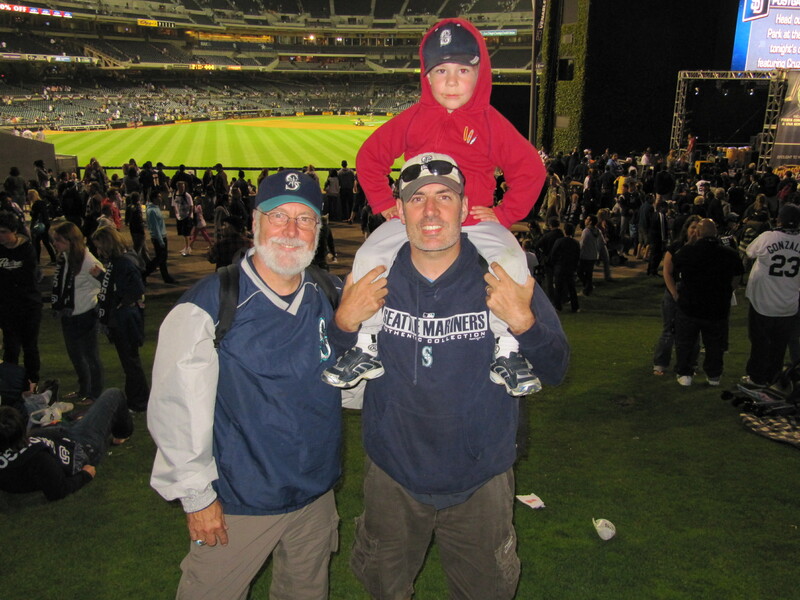 And, on October 3, 2010, we headed down to Safeco Field for the final game of our and the Mariners 2010 season. The line-up was Tim, Kellan, Colleen, my folks, my buddy Paul, and me. 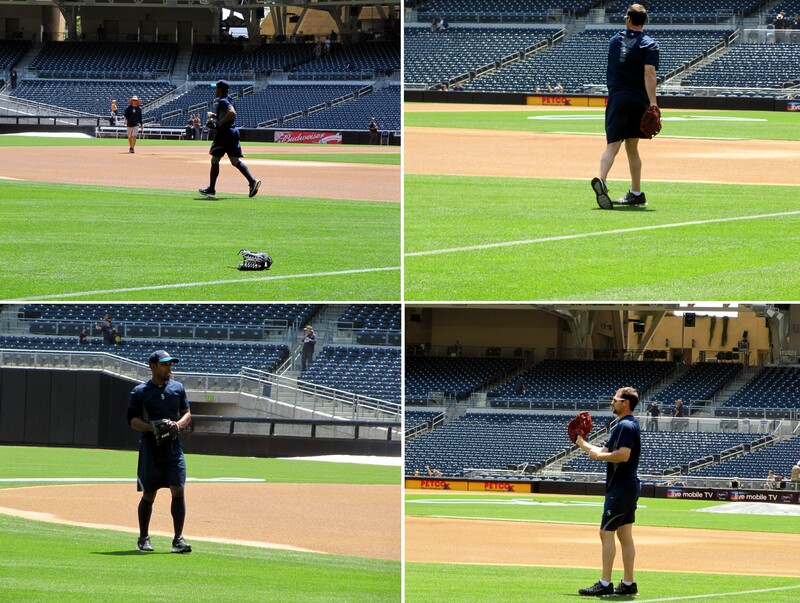 Although Paul joined us late, the rest of us headed down for non-existent batting practice. …and finale starting pitcher, Ryan Rowland-Smith, to the right. 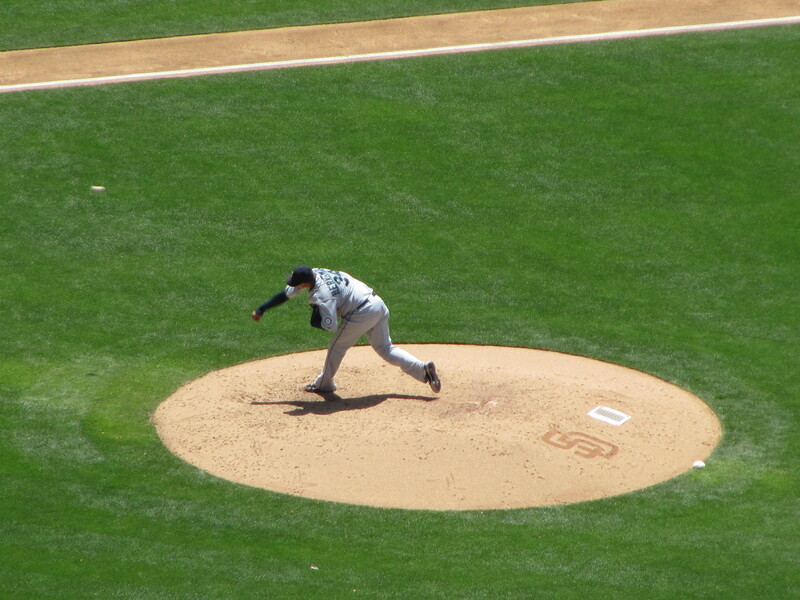 After a tough season where we never got to see him pitch live, I was excited for the opportunity to watch Ryan close out the 2010 season with a strong final outing. …was kissing Kellan like a campaigning politician. Despite the terribly disappointing season, I believe in Jack. I think he has a good vision for the team. 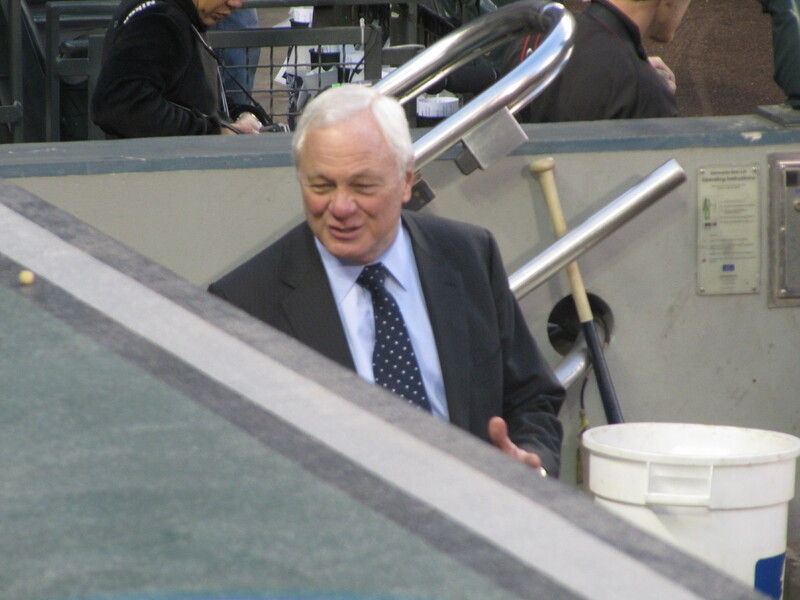 And as GM’s go, Jack is the most visible the Mariners have ever had. In two seasons, we’ve met him several times — like last season on the streets of Boston. 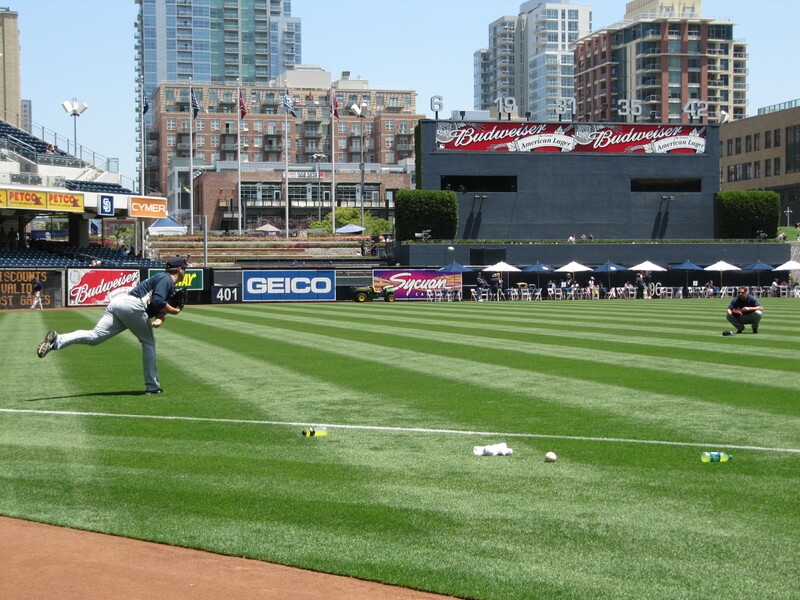 Across the field from RRS, opposing starter Dallas Braden warmed up for the A’s. …while Bill Kruger and Brad Adam interviewed Jack Z. (who you can see sitting below the bright light). …but we never found him. So instead, we just had another fan take our picture. 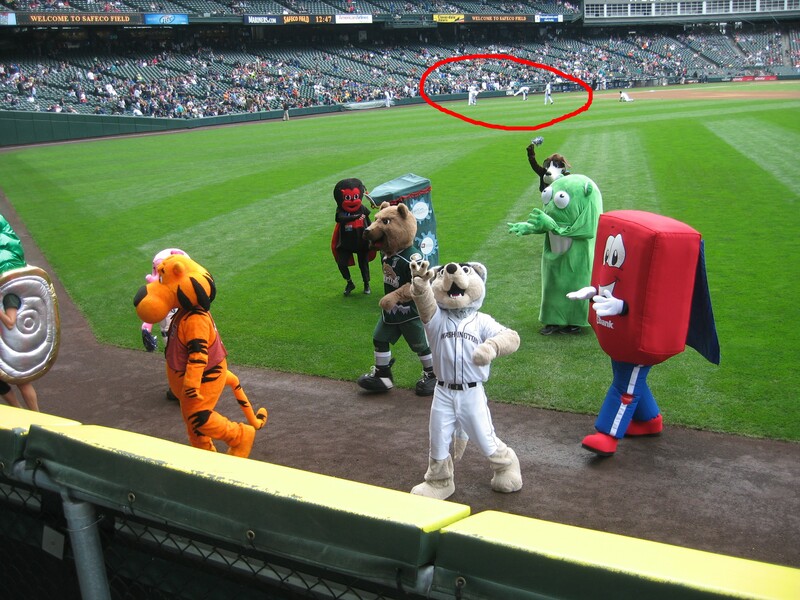 ….you can see them in the background of this picture my parents took of some of the mascots. When some of the Mariners started playing catch, I gave up on finding Luke French and we headed over by the guys who were playing catch. 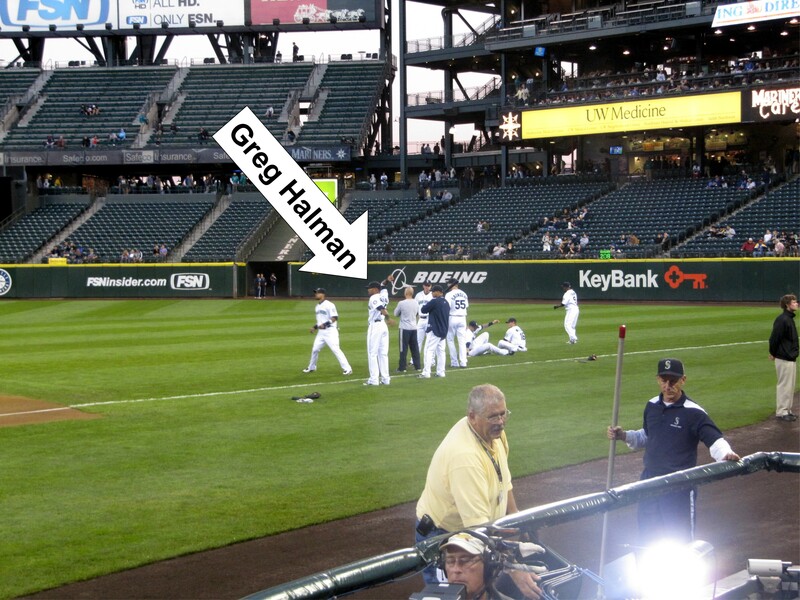 Two games ago, Greg Halman had tossed Tim and me his pregame warmup baseball. 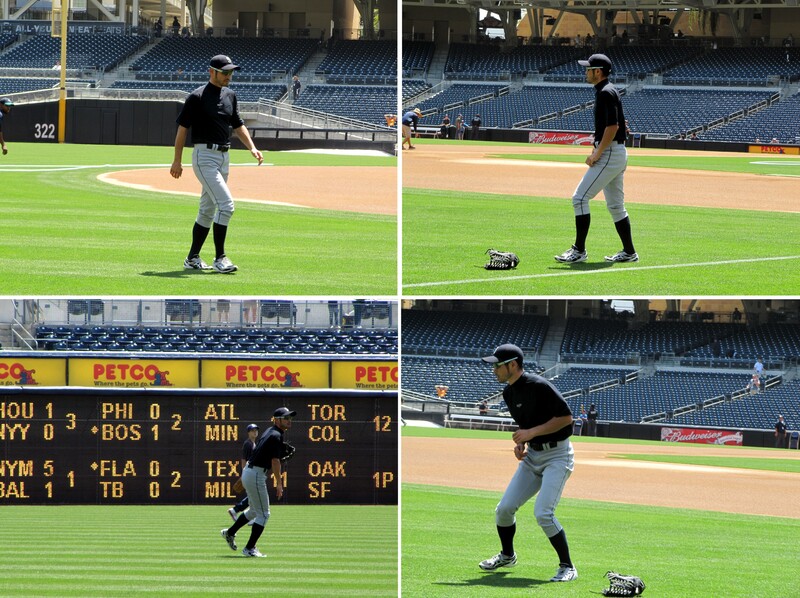 That day, we were practically the only people watching the players playing catch. But on this day, the seats were crowded. We were about six rows back and the first three rows were packed. I was hoping we could get one more baseball this season and this was our chance, but there was a lot of competition and the odds weren’t looking good. As the players started heading back to the dugout a ball or two got tossed to fans in the first row. Finally, Halman and his partner finished playing catch and Halman ended up with the baseball. He looked over to the crowd and I yelled, “Hey, Greg!!! !” I was the only one to call out to him by name and he appreciated it. He scanned around and found me and then tossed his baseball high over everyone else so they couldn’t intercept it on its way to me and Kellan. The baseball was just a bit over my head level. As I reached up to make the easy grab, Colleen yelled “No! NO!!! !” She was scared I would miss the ball and it would hit Kellan. It was pretty funny, really. 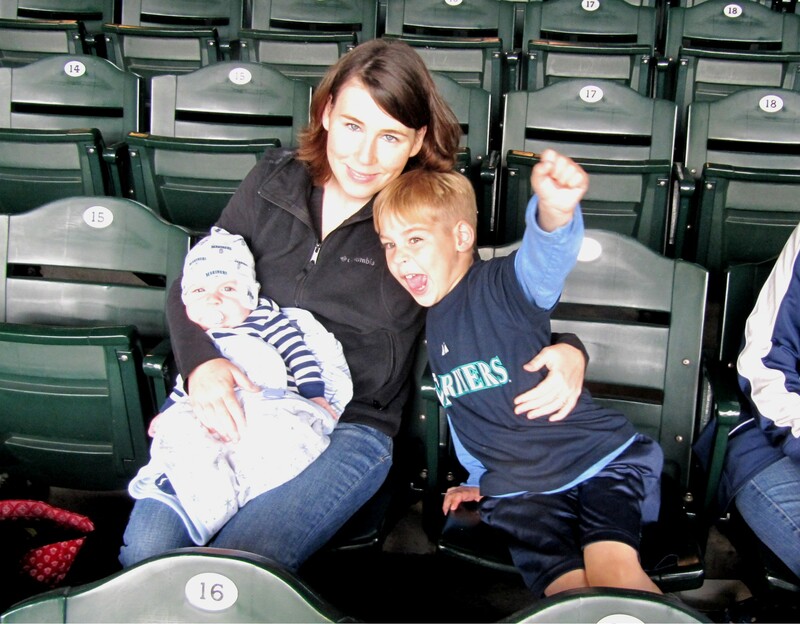 Her maternal instincts to protect our baby overrode her common sense about my abilities to catch a baseball lobbed to me. Yep, it was pretty routine. (That’s a yawn, by the way). 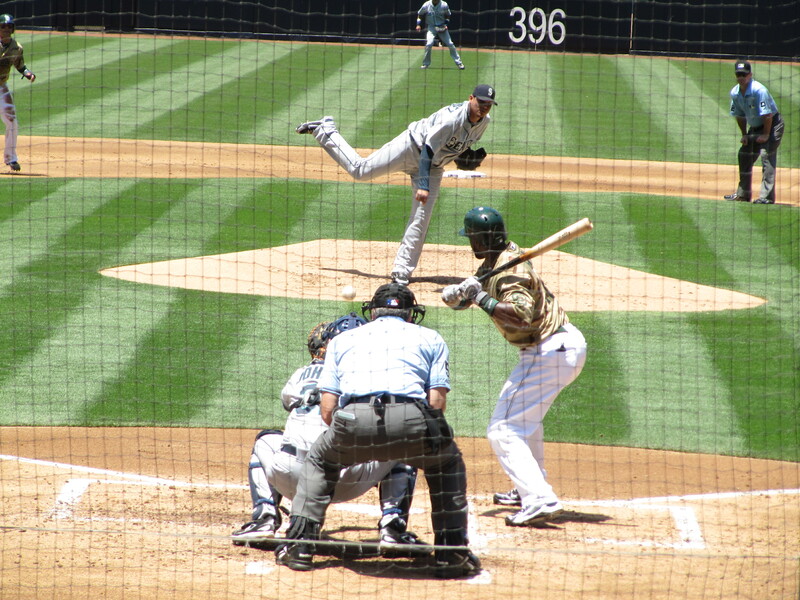 In that last picture, Rajai Davis is the guy bending down and reaching toward the ground. 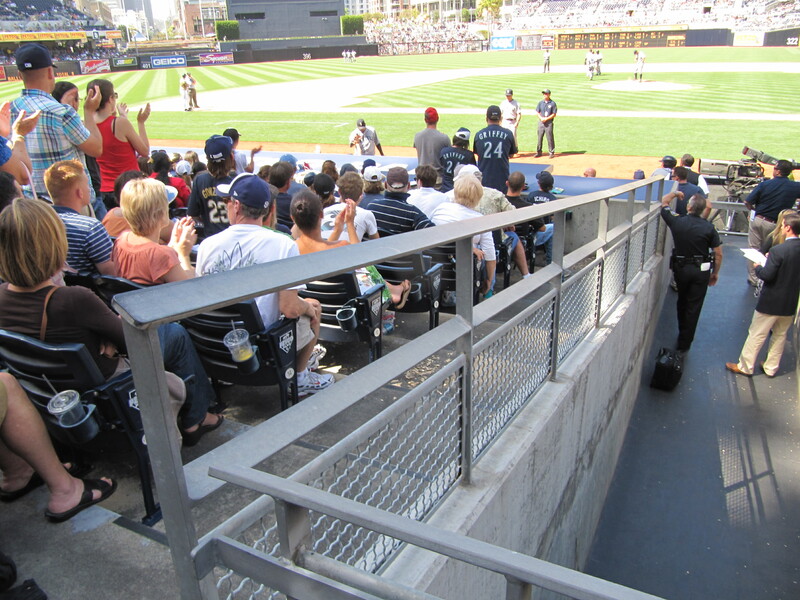 …walk down the fence and explain to everyone in the front row that they will be kicked out of the game if they interfere with a live ball in play. His message was simple, “Foul grounders are fair game, but catching a fair grounder will get you ejected. When Davis finished streching, he jogged straight into the A’s dugout. No first batter autograph for Kellan on this day. But don’t fret. We’ll track down Rajai Davis some day. You can mark my words on that. Rajai Davis wasn’t the only A’s player walking straight lines, but not all of them were heading to the dugout. After warming up in the bullpen, Dallas Braden exited the bullpen gate and walked in a laser straight line directly to us. As I watched him approach, he displayed an odd expressionless face with his harms hanging unnaturally still as he walked…as I said…directly to us. Confused, I looked at him standing two feet in front of me. What’s going on here, I thought to myself. 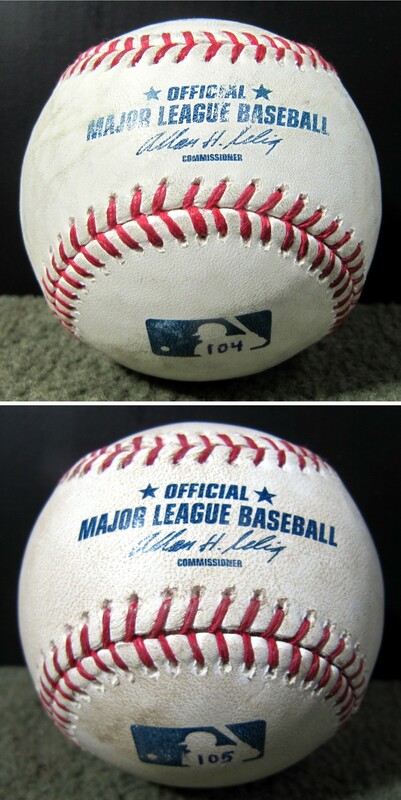 …this baseball from the pocket of his glove. Although it took me hundreds of games, it took Kellan only two games to get a baseball from a pitcher with a perfect game on his resume. 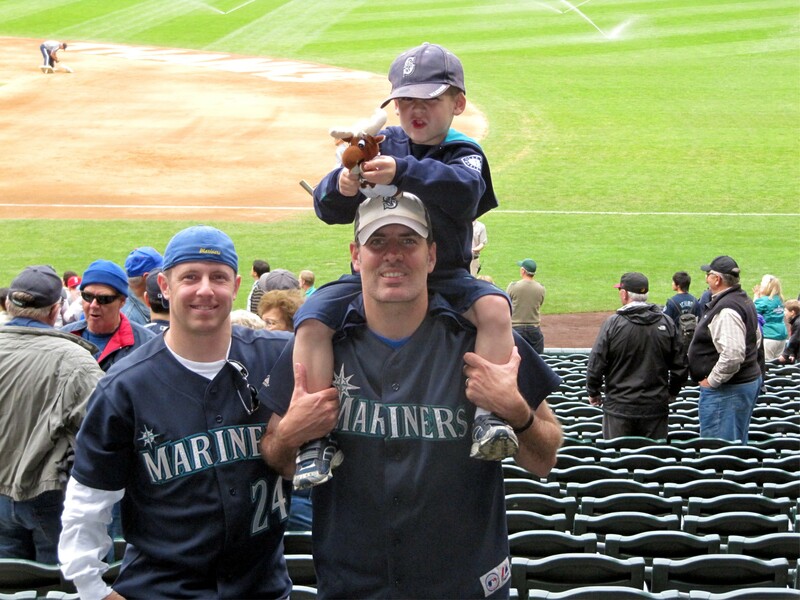 We were ready for some Mariners baseball! …after a 9-0 shut out loss in his MLB debut game. Despite the early frustrated body language, it seemed like RRS started believing in himself. And he should have because he had a good day. After RRS induced a fly out to CF for the first out of the game, Josh Bard threw out Davis trying to steal second. 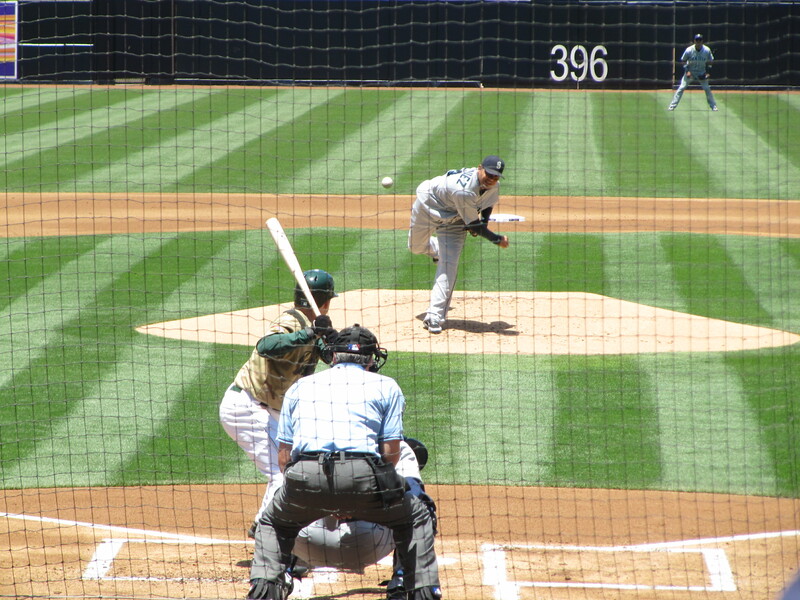 Then RRS struck out Jack Cust to end the first. …and he had one scoreless inning in the book. 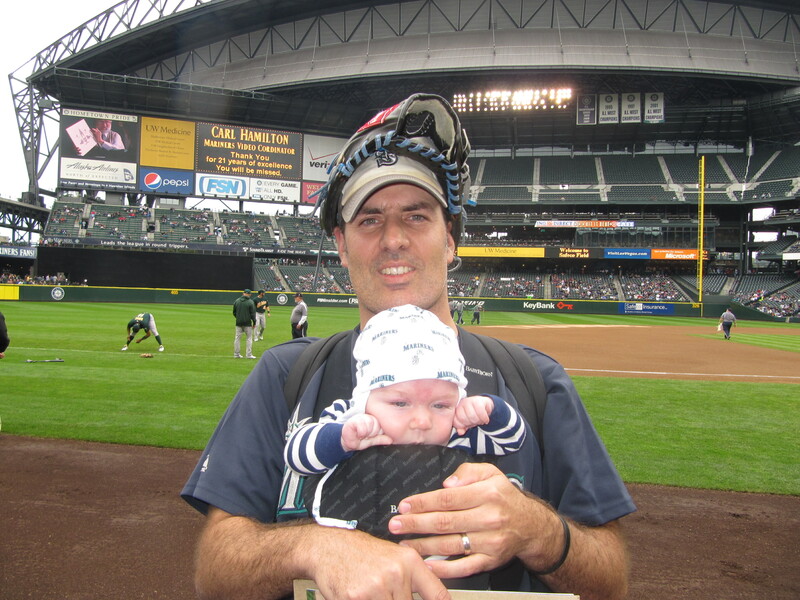 …but both he and the Mariners came up empty handed. Hey, guess who showed up? It was Paulie! Paulie, Tim and I had big plans for this game. 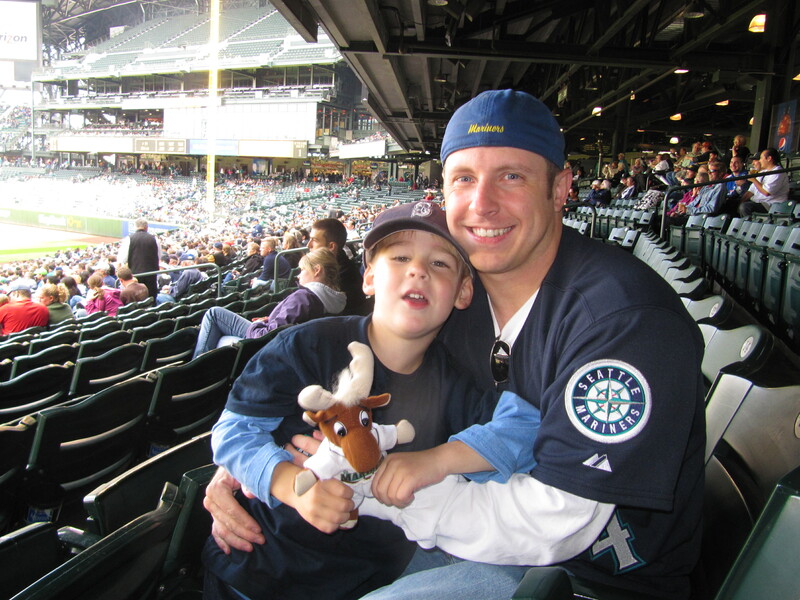 We bought tickets to this game at the very beginning of the season figuring that it would probably be Griffey’s final game. 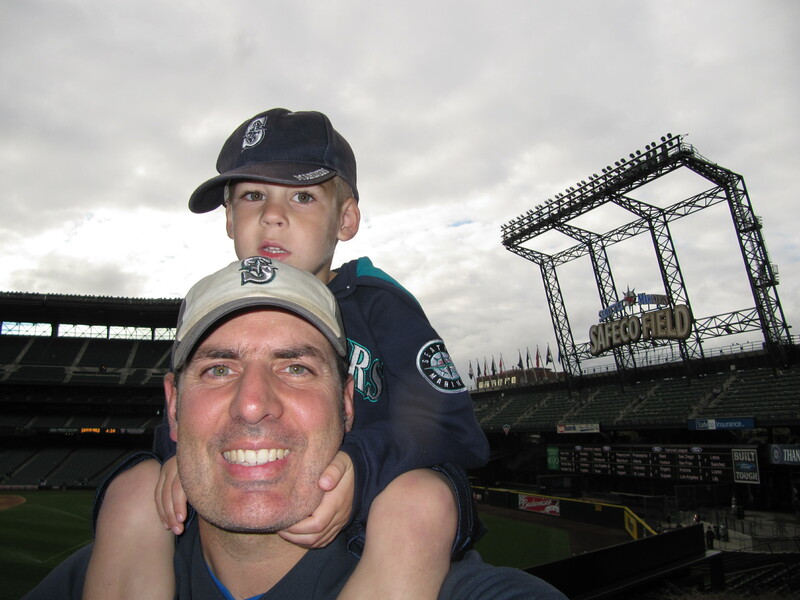 We were hoping to see Griffey’s final homerun and Griff getting carried off the field and into retirement. Sadly, we were Griffeyless on this day. 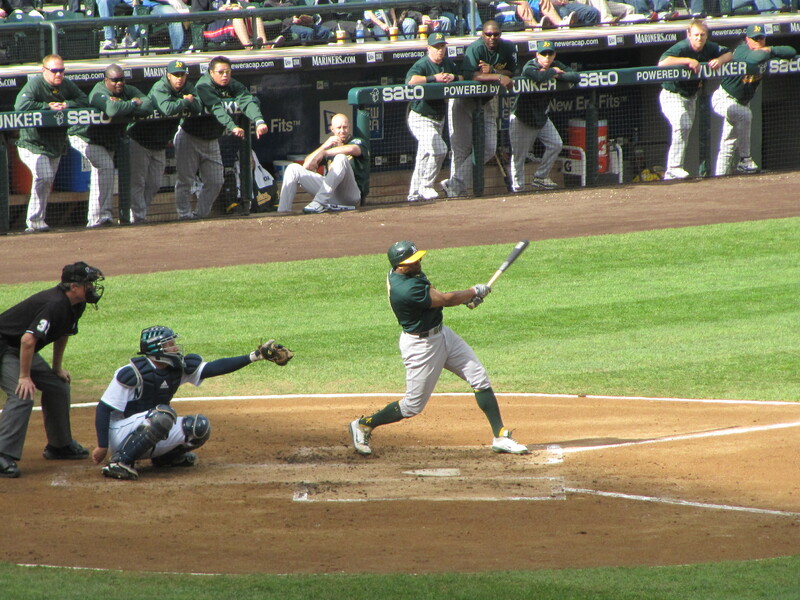 The A’s ended up scoring two runs off of RRS. They got one run in the third when Mark Ellis doubled to score Rajai Davis. 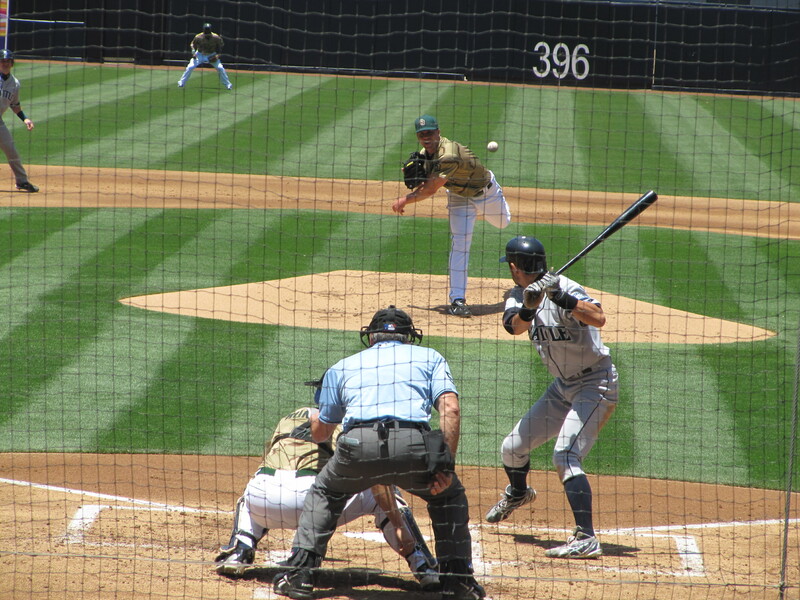 In the fourth, Kurt Suzuki hit a lead off homerun to make it 2-0 A’s. 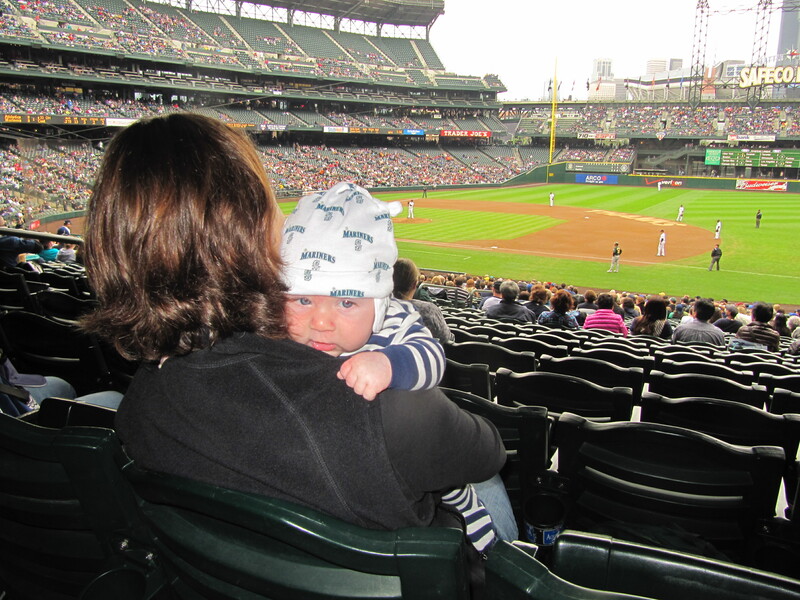 To this point, the A’s had scored 11 runs to the Mariners zero runs so far in Kellan’s first two games. 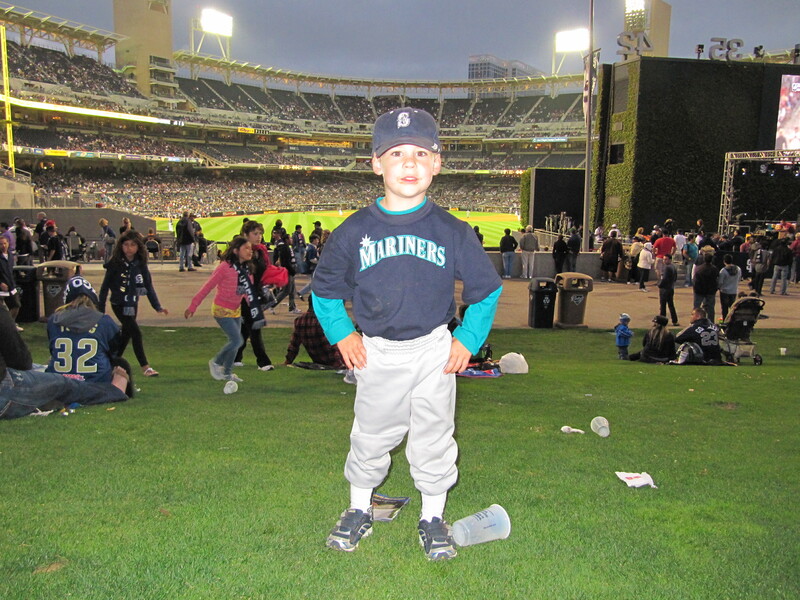 It was high time for the Mariners to get on the board for Kellan. 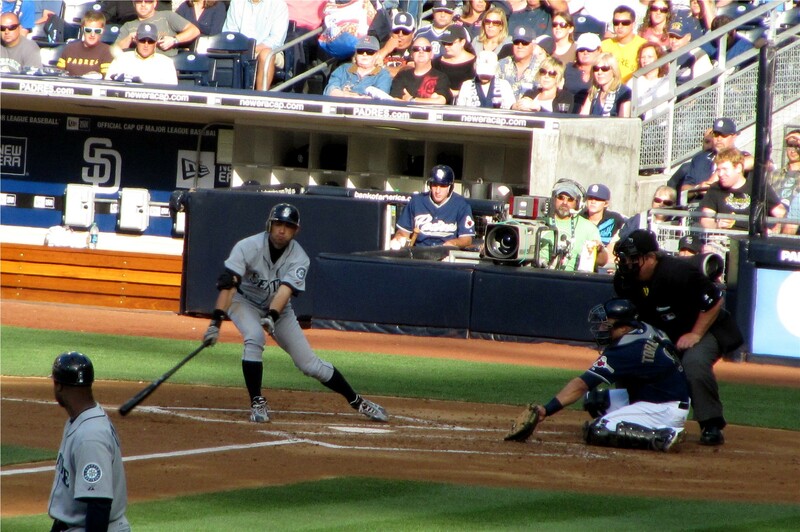 …followed Saunders with a single of his own on this swing. 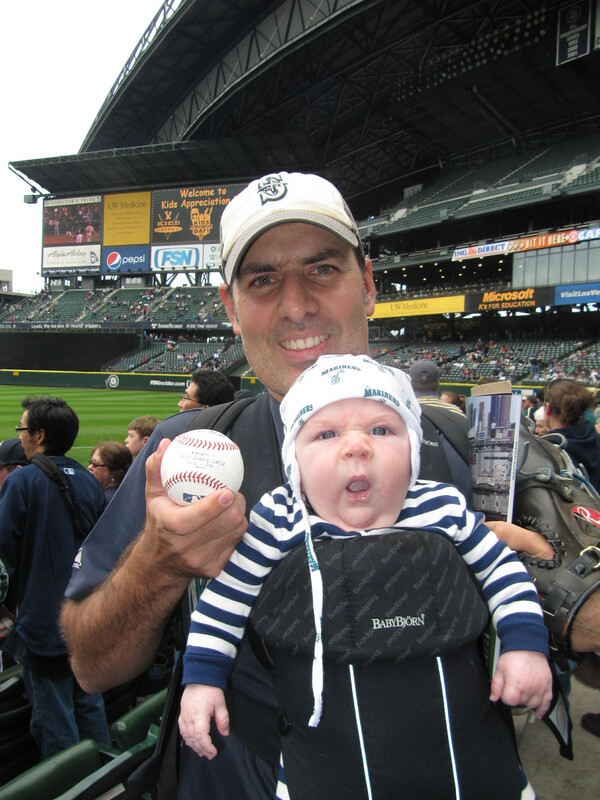 …and Halman and Mangini scored Kellan’s first two Mariners runs ever. We were all on our feet screaming and cheering. It was a great moment. So the score was all knotted up at 2-2. 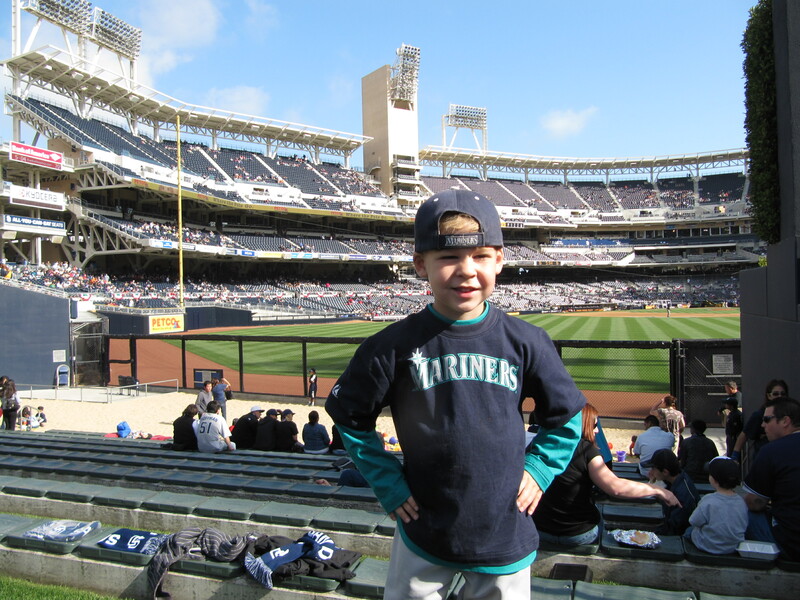 I was excited for the possibility of Kellan witnessing his first Mariners win and RRS finishing off the season with a long-awaited second win of the season. 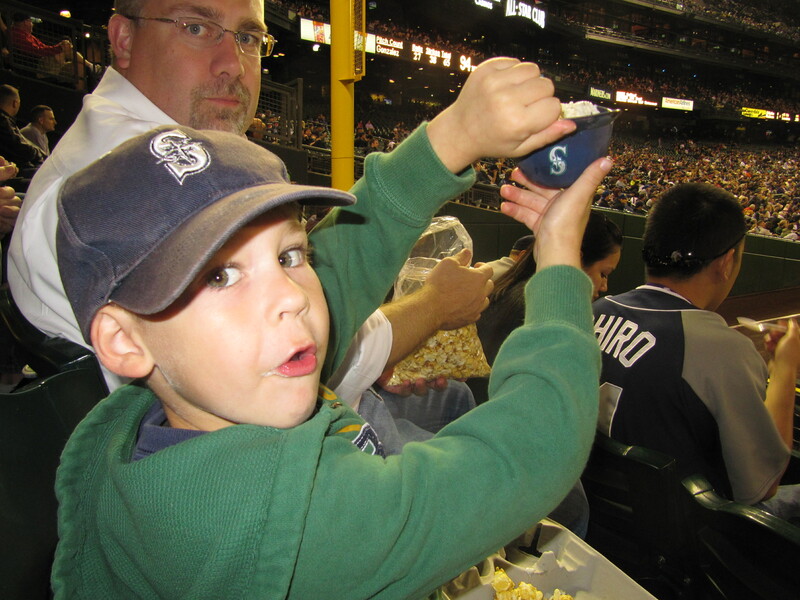 He was ready for the possibility of a personally historical moment — his first ever Mariners lead?? 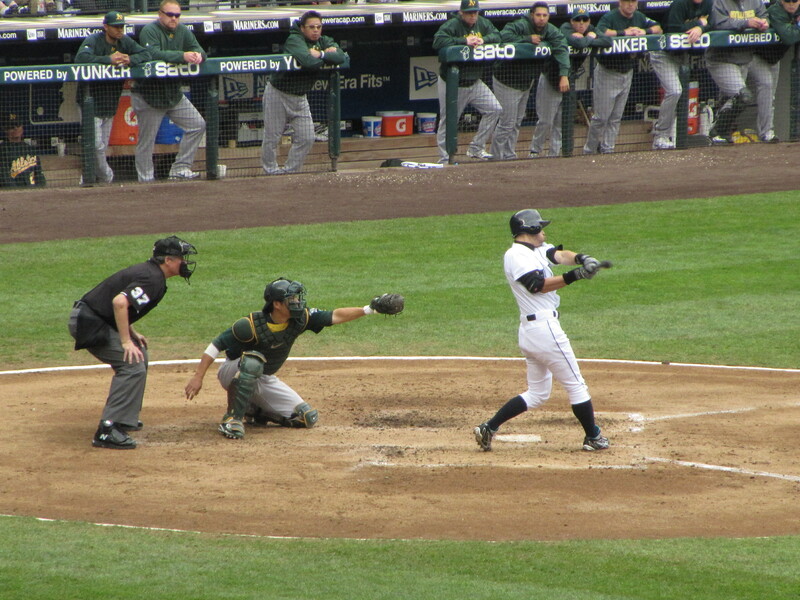 Unfortunately, after Ichiro’s double, the rally ceased. And after five innings, both teams went to their bullpens. It should be noted that RRS actually had a slightly better line than Dallas Braden. Both pitched 5 innings and gave up 2 earned runs. But RRS gave up only 4 hits to Braden’s 5 hits, and he struck out 3 to Braden’s 2. They both walked 1 batter. 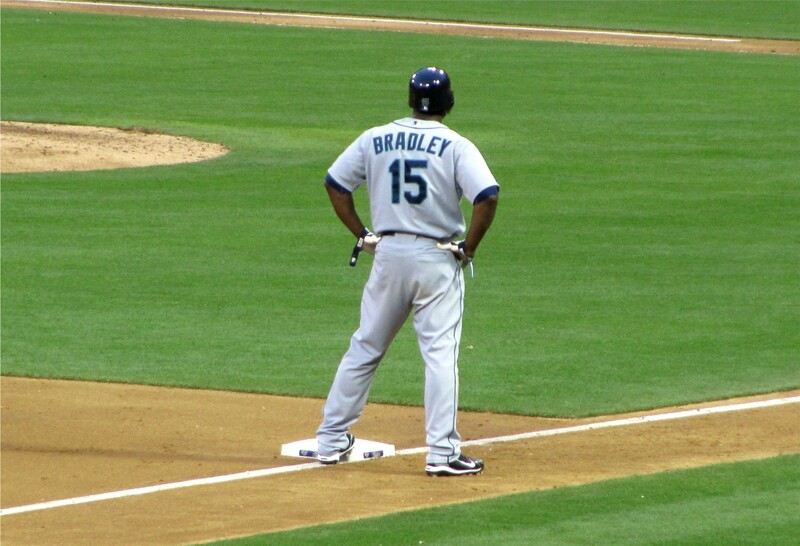 Sadly, the Mariners bullpen turned Braden into a winner-in-absentia. After Braden left the game knotted 2-2, Mariners reliever Anthony Varvaro promptly gave up a run on two hits in the top of the sixth. He would pitch only one-third of an inning. In the 8th inning, Garrett Olson gave up a homerun to Kevin Kouzmanoff. That made the score 4-2 A’s. He then stole his 42nd and final base of the season. He wound up on third base on a Jose Lopez groundout. 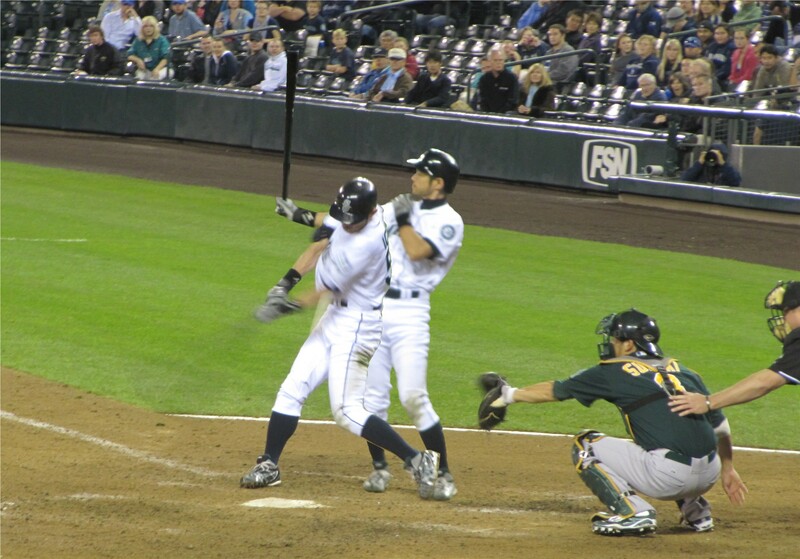 Finally, Ichiro scored his 74th and final run of the season on a Justin Smoak line drive single to left field. 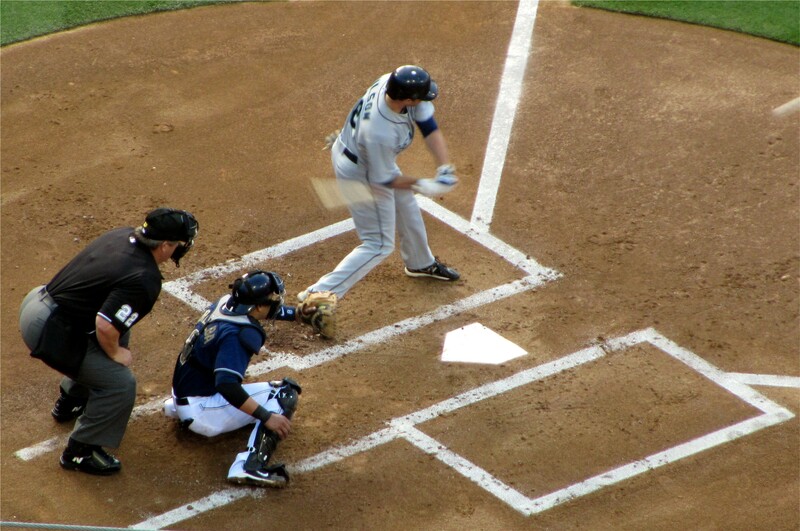 Sadly, Ichiro’s run would be the final Mariners run to be pushed across the plate in 2010. We lost our 101st game of the season, and 2nd of Kellan’s life, by a final score of 4-3. Jim was closing out the final game of his career…although I recently read that he is only “semi-retired” so maybe we’ll still see him on mlb.com from time-to-time. 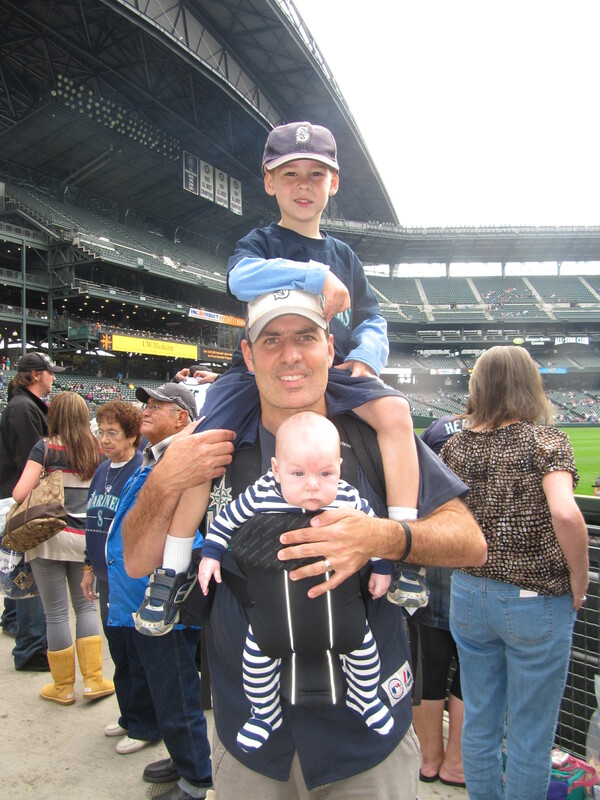 It was so sad that our season was over so soon and that, as we exited the gates at Safeco Field, we would be entering a period of six months without (regular season) Mariners baseball. That was comforting to see. He failed to smile in any of them. But how could I blame him? It was now officially the off-season. 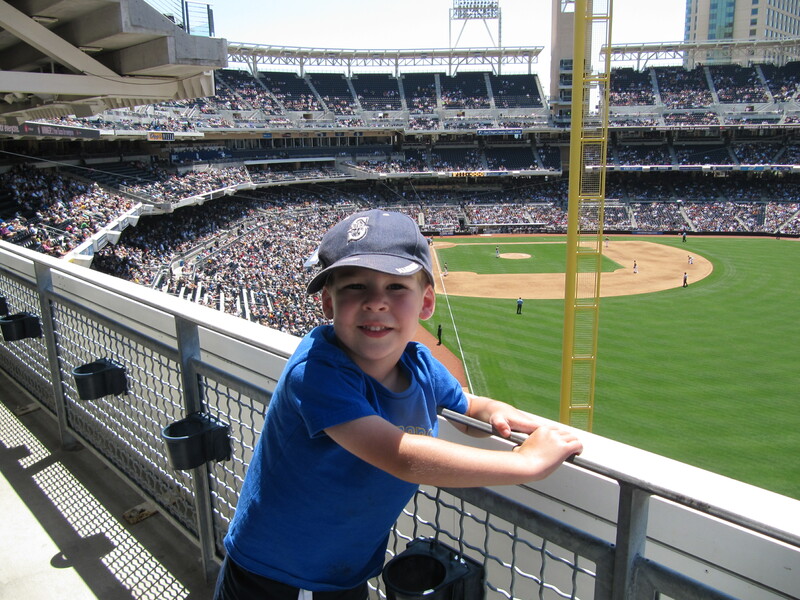 On June 13, 2010, two factors [incredibly awesome seats + extremely relaxed stadium staff during Kids Run The Bases] combined to result in one of the longest, more picture laden game reports that we have ever produced. Here it goes. 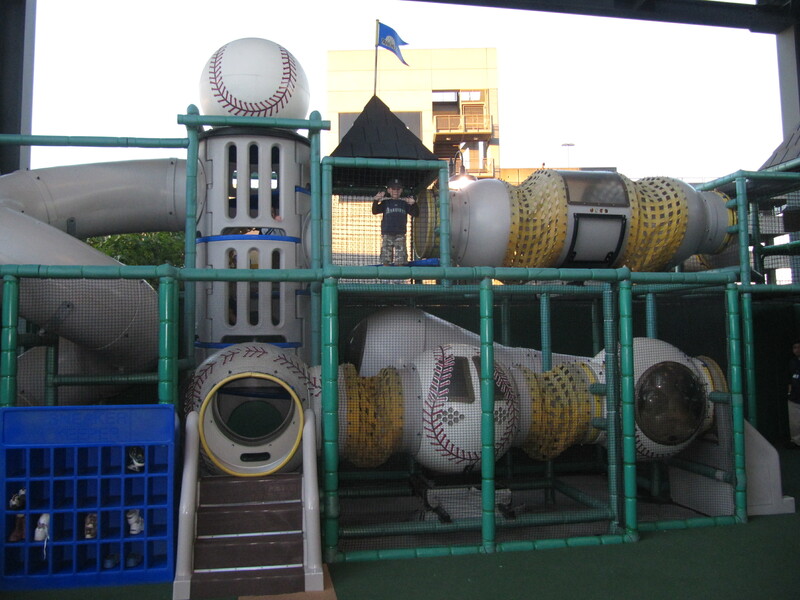 It was an afternoon game, so it was still morning when we got to the park. I know an extremely cool guy named Al who lived most of his life in our area in PA, but now lives in San Diego. 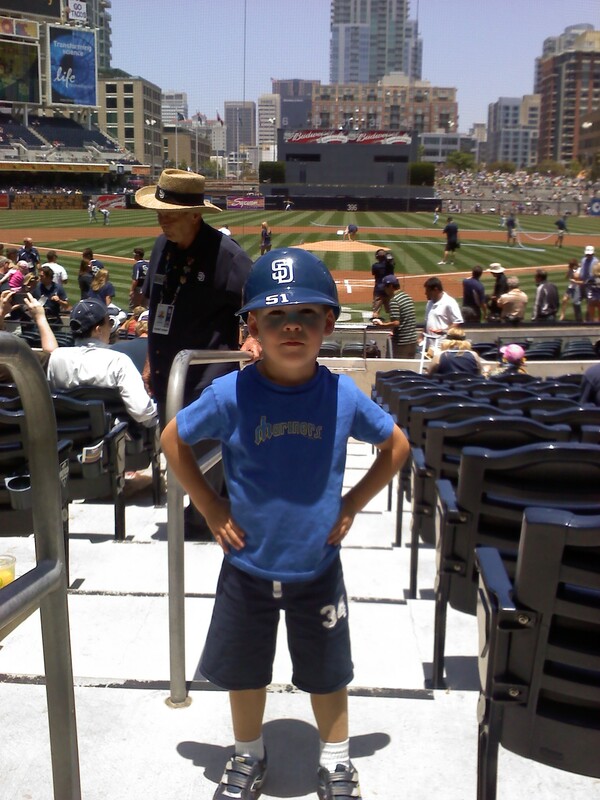 Back in November 2009, he mentioned that he has the ability to get incredibly awesome seats at Padres games and offered to get them for us for this game. I was unsure if it would actually happen so I bought cheap outfield tickets before the season started to be sure we had tickets. Al was planning to join us for at least part of the game so we arranged to meet him at the stadium. But we arrived about 45 minutes before him. So we used the cheap outfield tickets to head inside for BP. 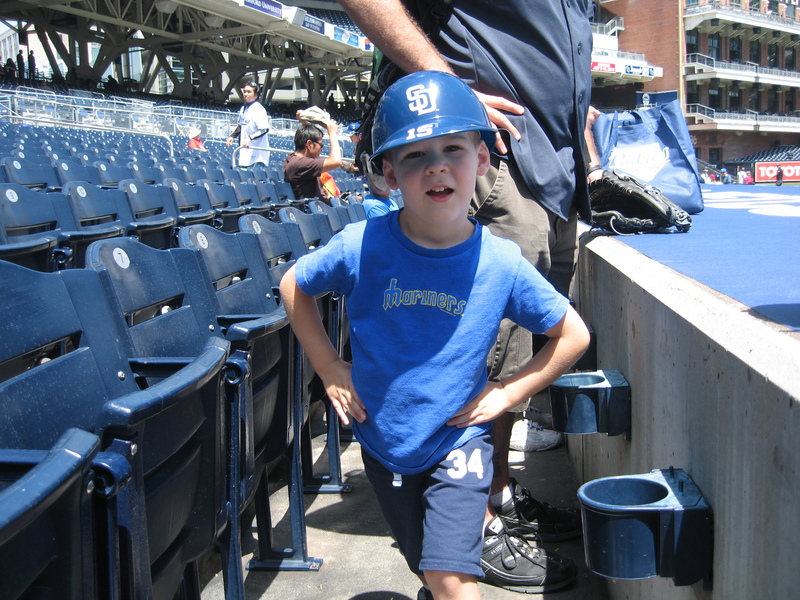 After Tim collected his Padres batting helmet giveaway, we headed in and found there was no BP today. Even worse was the fact that Tim couldn’t play in the Beach because it was closed. 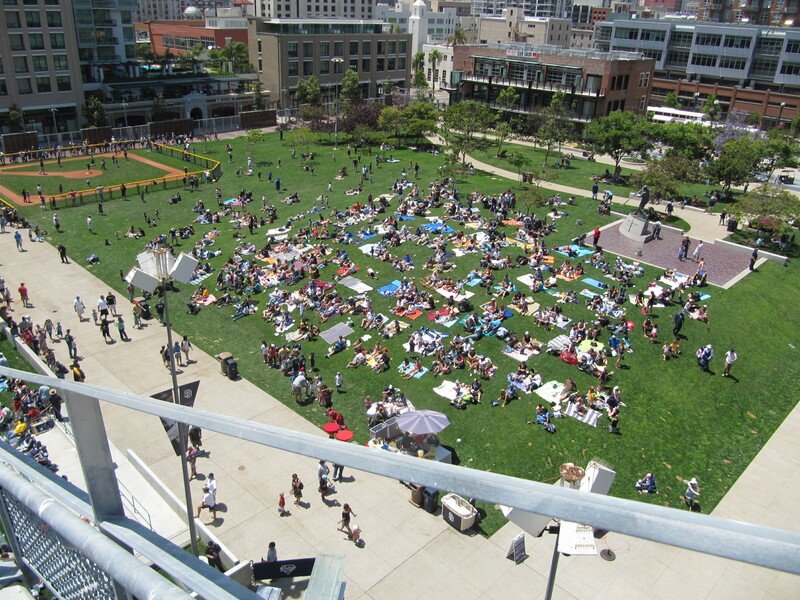 There was a “breakfast in the park” event on the warning track and I guess they didn’t want loud kids right next to the people who were literally eating breakfast at tables on the warning track. 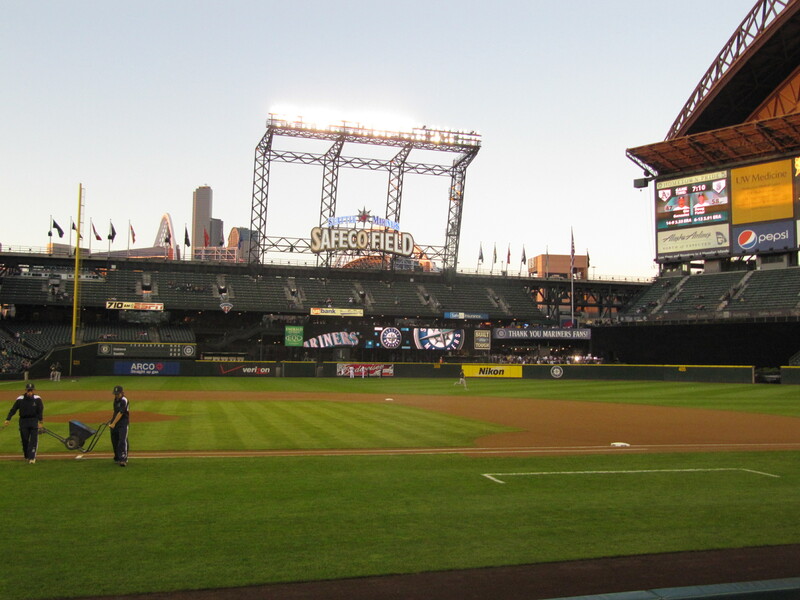 Only two Mariners were on the field when we arrived. 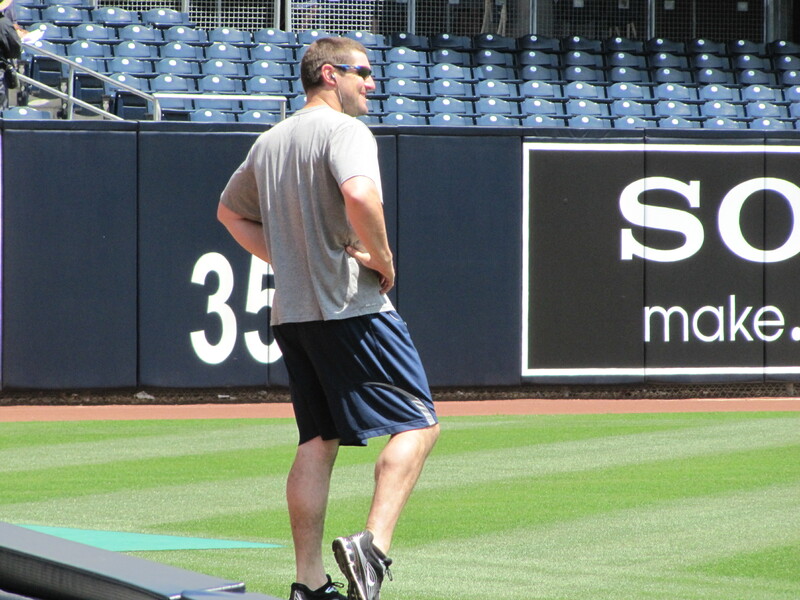 …Kotchman walked back to the dugout. 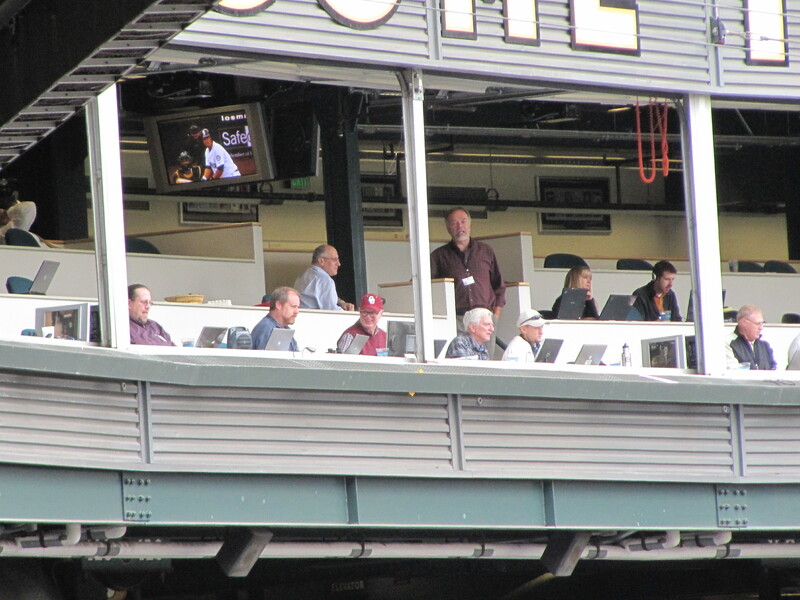 As I watched him approach the dugout, I saw that my Dad was the only person standing directly above the dugout — and he was wearing a Mariners shirt. 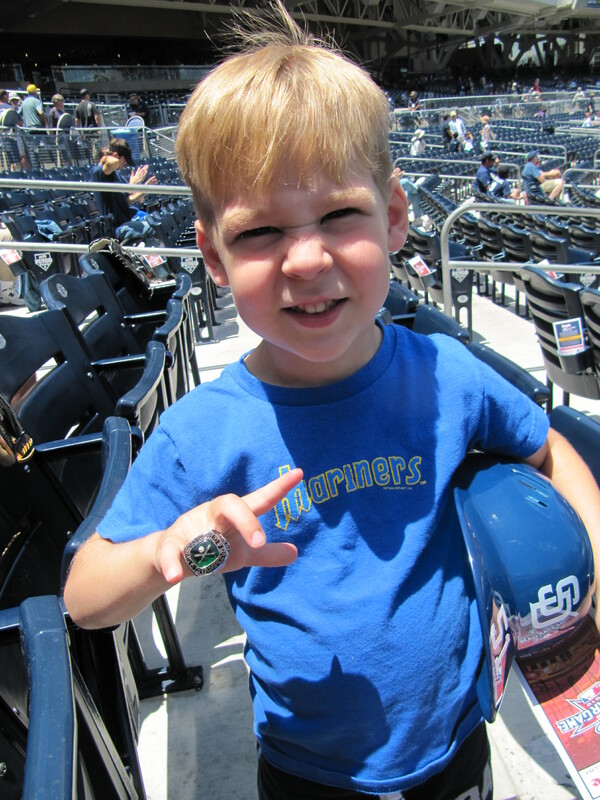 Kotchman rewarded him with the his and Figgins’ warm up baseball. 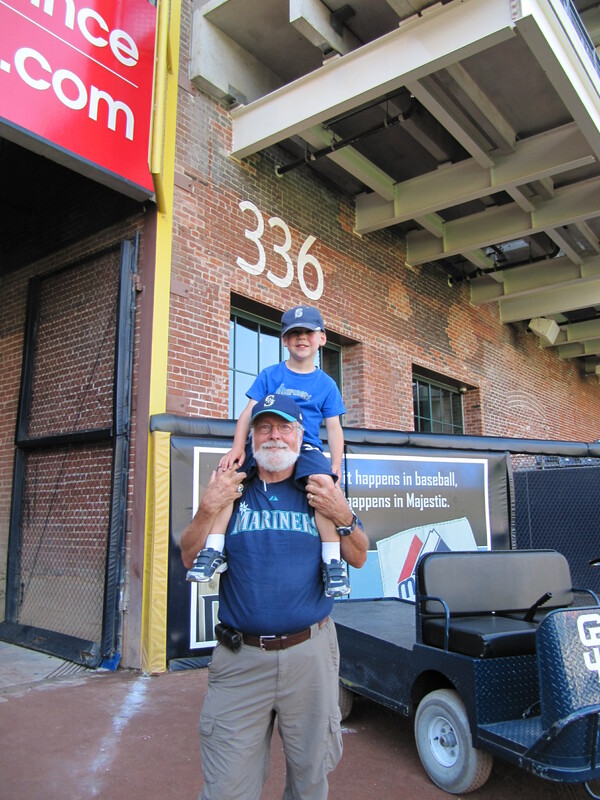 …and then Tim said, “5-1 just like Ichiro!” He was a little bummed out when I told him that we’d really done “15” — Milton Bradley — not Ichiro’s “51.” A second later, Al called us and we left the stadium and met him out front. 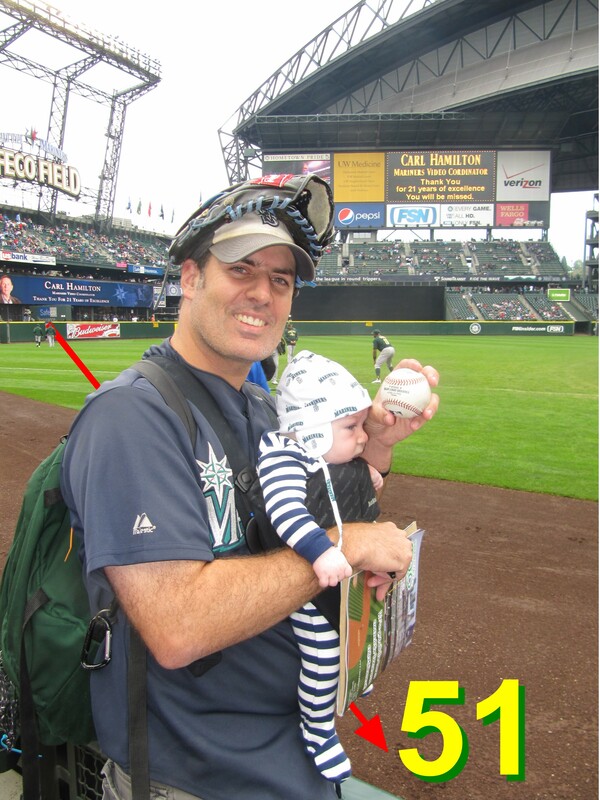 Because we’d be entering the stadium again on new tickets, I told Tim he would get another helmet and we could put Ichiro’s “51” on it. 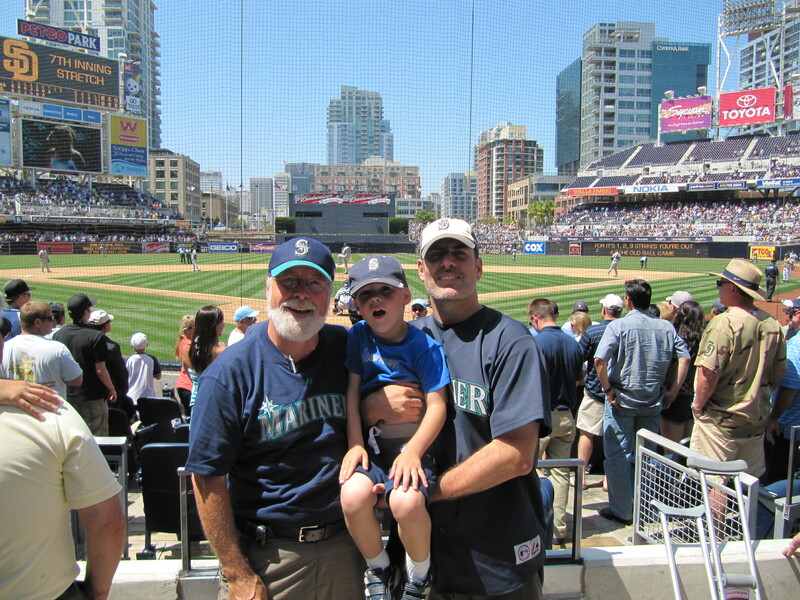 My Dad, Tim, Al and I headed to our seats, which were in the 18th row directly behind home plate. They were amazing seats. 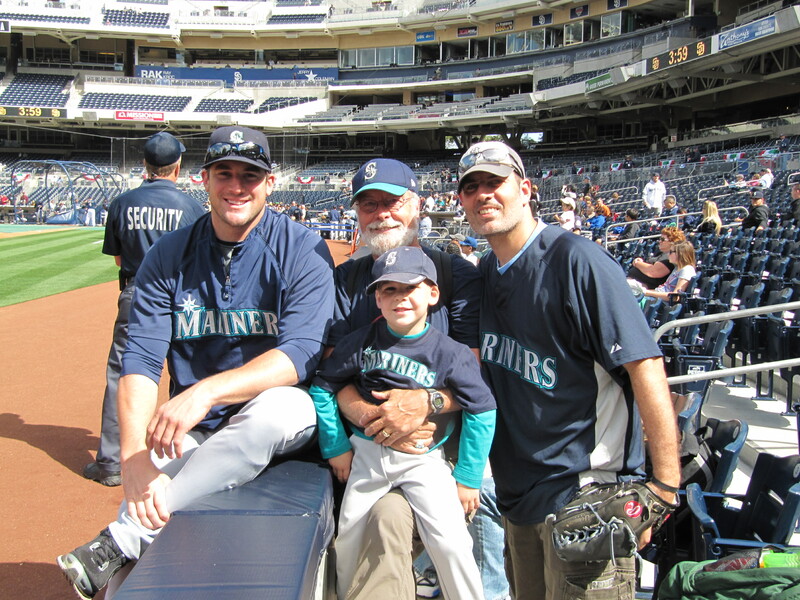 A bunch of Mariners pitchers were playing catch down the 3B line, so Tim and I headed over there while my Dad and Al hung out chatting in our seats. …it trickled right by Vargas and into my glove. I immediately scooped it up and tossed it back to Vargas — he needed the ball and I couldn’t stand in the way of my team’s pitchers getting their work in. When I tossed the ball back to Vargas, I asked if we could get the ball back when they were finished. He said, “Maybe.” Unfortunately, the maybe turned into a “no” because Vargas and French got into a deep discussion about grips on the ball (see inset picture) and they kept handing the ball back and forth as they walked back to the dugout. Tim was working on another All-Star ballot while we watched the pitchers warming up. League was still pitching to Aardsma. Eventually, Tim asked me if I would pick him up. For the first time, I took off my glove (set it on the wall) and bent down to pick up Tim. The hard tossing Brandon League uncorked a wild and blazing fast ball past Aardsma. From the corner of my eye, I saw it skip off the outer edge of the warning track. As I lifted Tim up, the ball violently hit the very top of the padded wall…at literally the top inch of the wall. People shreaked as they thought the ball was going to smash me and Tim. Had the wall been an inch shorter, it would have slammed into my side. And it would have really hurt, I could tell. An usher came to ask us if we were alright. Luckily, the wall was just high enough and the ball bounced back onto the grass on the 3B side of Aardsma. Soon, League and Aardsma switched positions and League was crouched on the foul line catching the D.A. …RRS worked with (and learned from) Lee. Eventually, Aardsma snuck a pitch by League and, for the third time, I scooped the ball up off of the warning track and threw the ball back. This time, I asked League if we could get the ball when they were finished. Instead of making us wait to find out the answer, he walked over and grabbed his wild pitch ball that had almost taken me out, and he tossed the baseball to me. 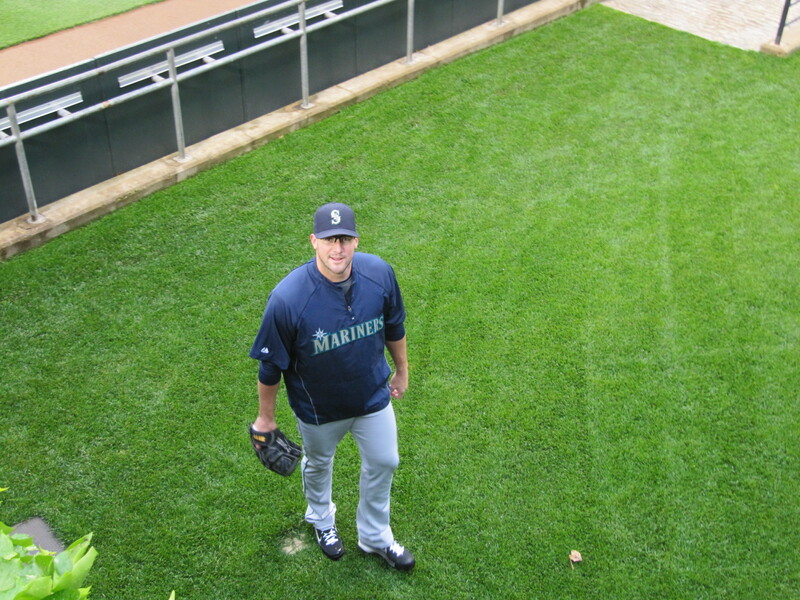 Soon thereafter, Lee and RRS headed over to RF so RRS could do some work off of the mound in the M’s bullpen. We decided to head over there as well. Actually, we didn’t know they’d gone over there. 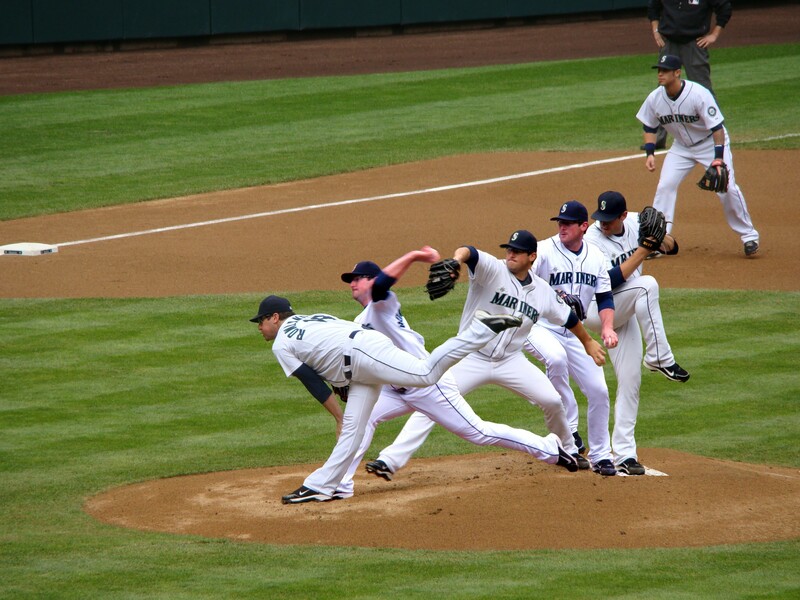 We just saw action in the M’s bullpen and figured we should see what was happening. Between pitches, Phillips saw us and said hi. After RRS finished his work, Jason came over to the fence and chatted with us a bit. It was nice to chat with him. As we were splitting up, I asked if I could get his picture with RRS and he asked if we wanted a baseball. So, after he hooked us up with a ball — our ninth overall from Phillips and our 7th stadium getting a ball from him — he went to grab Ryan. But Ryan was busy talking to Rick Adair. When RRS was finished, he said hi to us and I asked if I could get his picture with Phillips. So, he grabbed Jason and they posed for the picture above. Ryan knows that Jason is a Cook & Son Hall of Famer because he saw it on our blog, so he understood why I wanted their picture together. But I have no clue if Jason knows about the C&S Hall of Fame. I guess I should ask him later this season. After the picture, Tim and I started heading back to our seats and Tim tapped me on the leg and quietly asked, “Can I ask Jason Phillips something?” (FYI, Tim pretty regularly asks me extremely quietly if he can ask people questions). 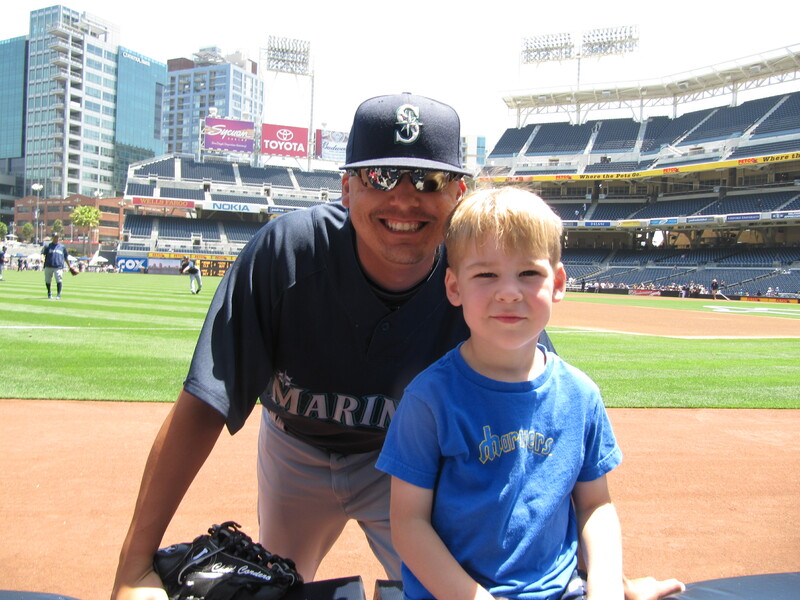 We headed back over to the bullpen and I got Jason’s attention and said, “The little guy has something he wants to tell you.” Tim yelled out, “My favorite baseball players are the MARINERS!” That gave Jason a big smile. 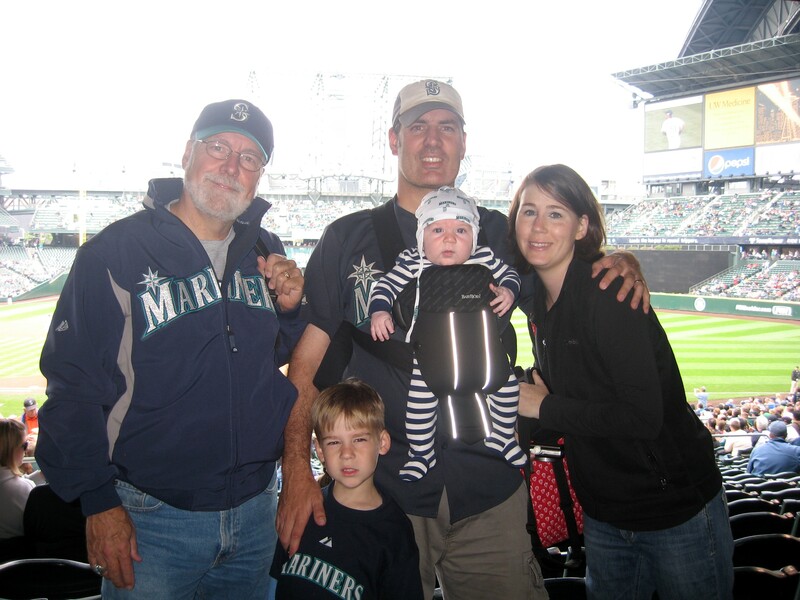 In that picture, I am sitting in my seat (Section 101, Row 18, Seat 1) and Tim is standing next to the row in front of us (wearing his new helmet with Ichiro’s “51” on the front and side). So you want to hear something crazy? We literally just left the bullpen where we were talking to Jason Phillips and we arrived at our seats where we discovered we were sitting right next to Jason’s family. 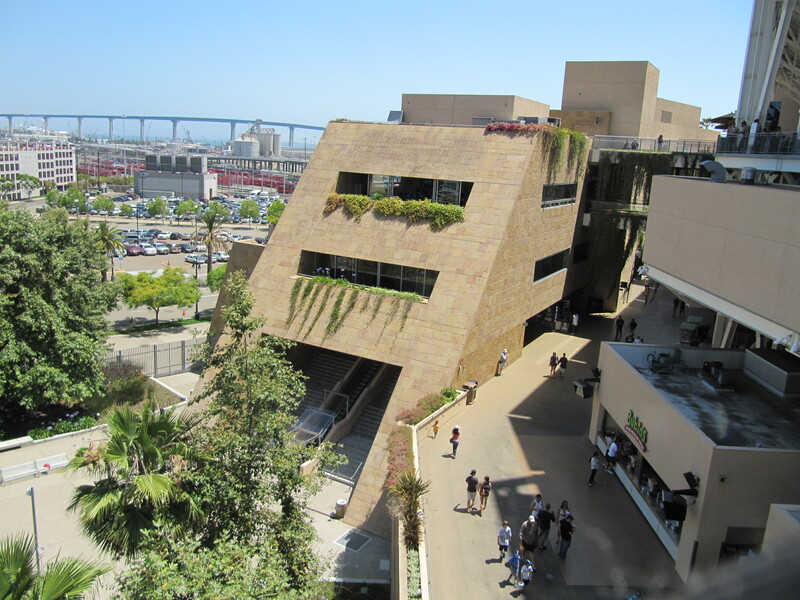 Prodded by a very nice and talkative federal employee, we all started chatting. I ended going over and sitting right in front of Mr. Phillips for a bit and discussing our many run-ins with his son. He told us an interesting piece of trivia that I did not know: Jason Phillips hit the 5,000th homerun in Mets franchise history off of Randy Wolf of the Phillies. 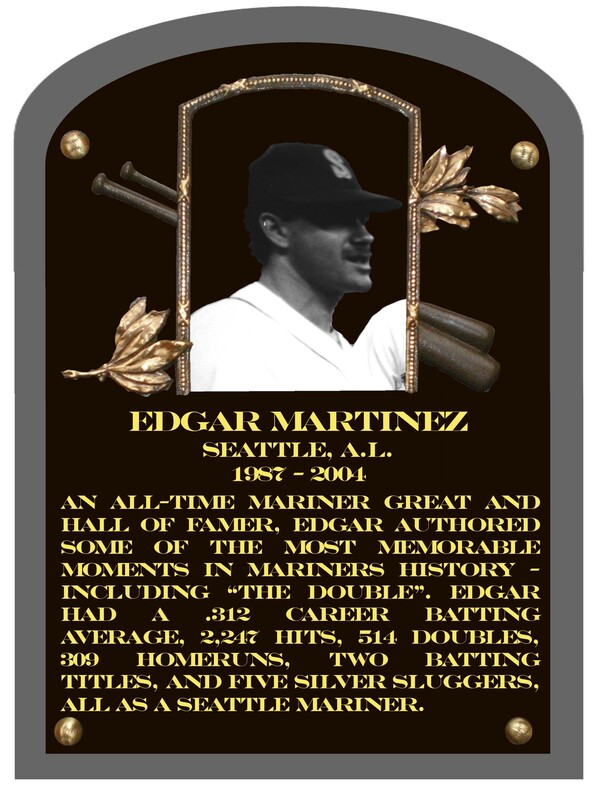 (FYI, Ken Griffey, Jr. achieved the same accomplishment for the Mariners in 2009). Jason’s dad is on a softball team that has won the world championship twice in the last couple years. And these were some huge and legit looking rings. 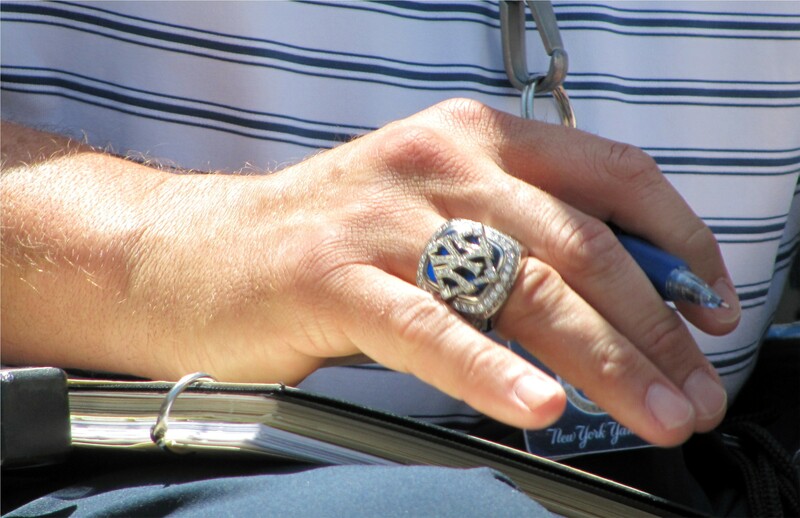 Two seconds after this picture, Tim asked Jason’s dad if he could have this ring. …and it belonged to a Yankees scout (whose work failed to prevent the Mariners from soon taking 2 of 3 against the Yankees in the Bronx). 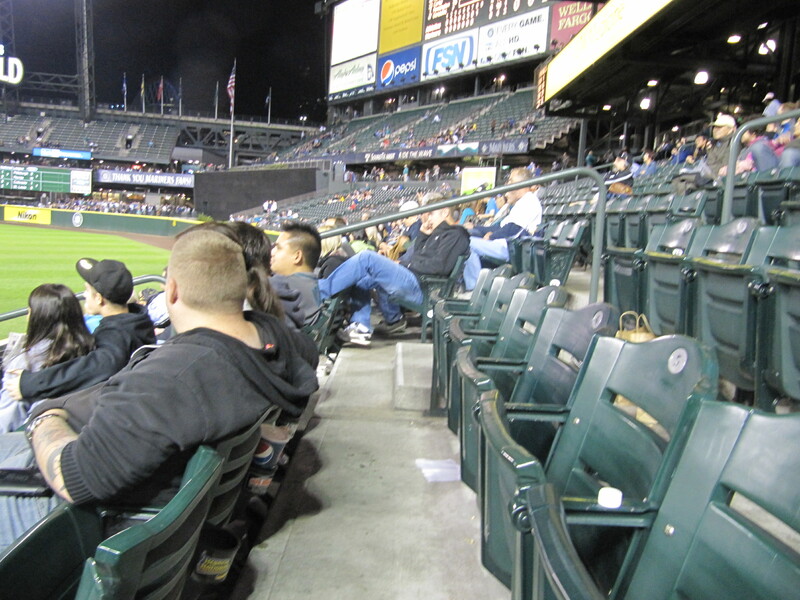 …and a whole bunch more sitting in the upper deck down the 1B line. 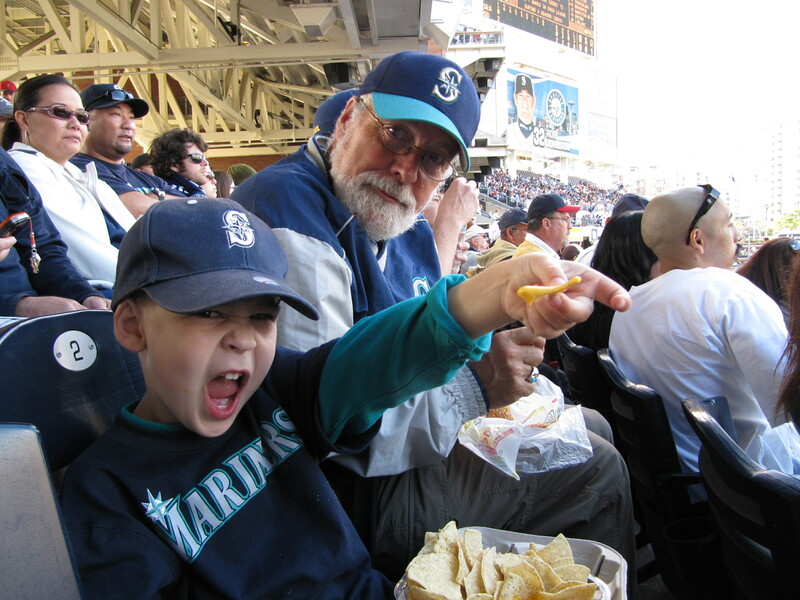 …which I am showing off in this picture because I think the contrast in the first kid’s face and Heath Bell’s face is hilarious. 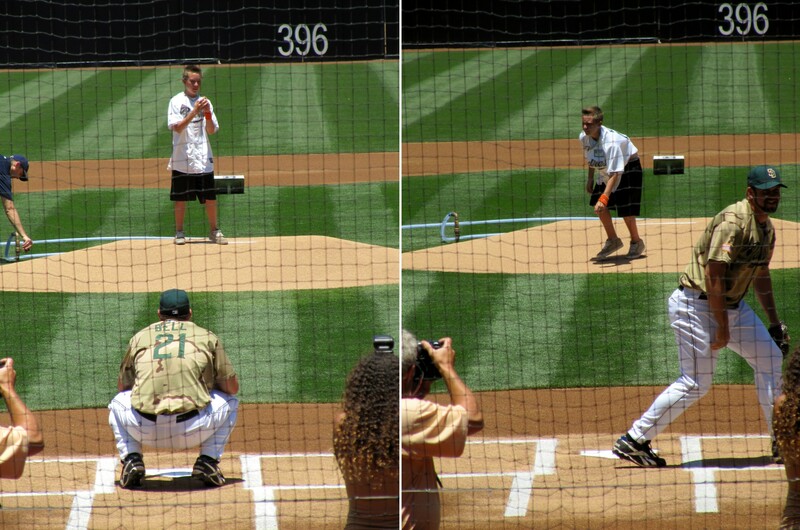 That kid gunned the ceremonial first pitch to the backstop…and the throw would have been behind a left handed batter. 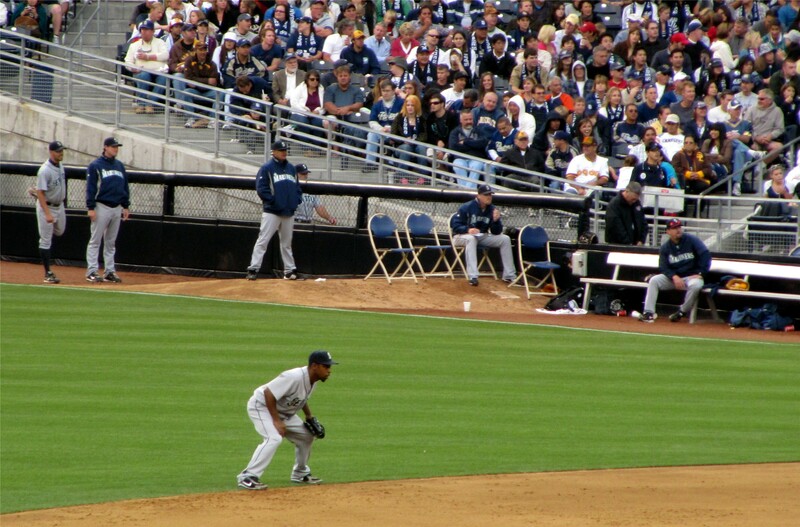 …by grounding into a double play. 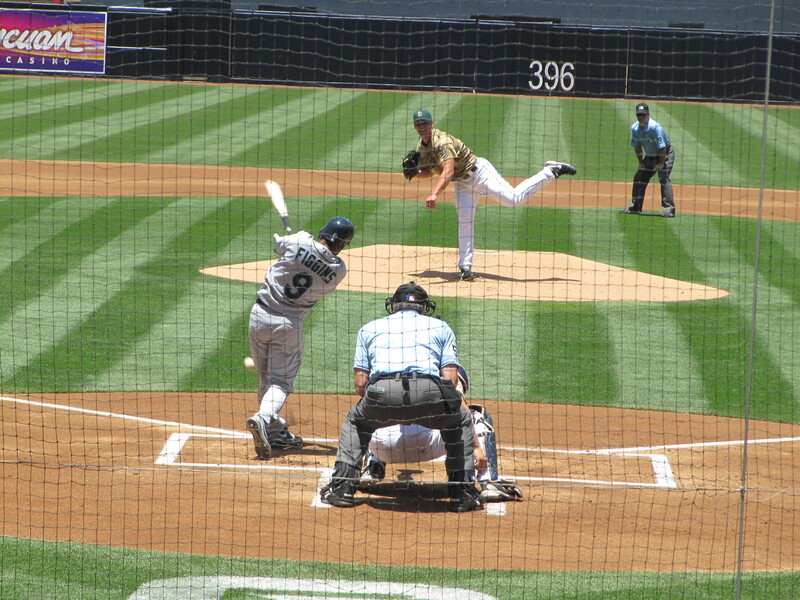 This view of home plate was so great, I could hardly stop myself from taking pictures of every at bat. By the way, that is David Eckstein about to pop out to lead off the bottom of the first. 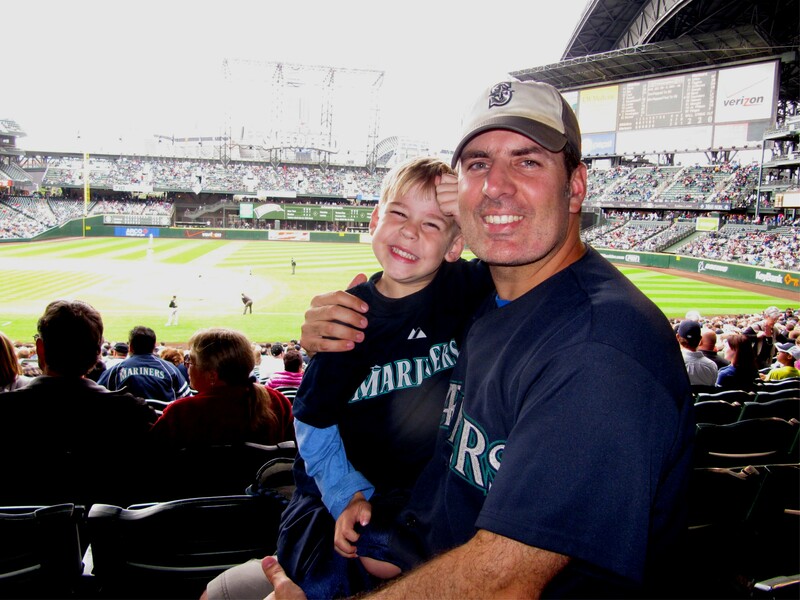 He would go 0-4 with 2 Ks against King Felix. …early in the game. By the way, that is Jason Phillips dad three down from Tim wearing the royal blue hat and about to pop some seeds in his mouth. He was decked out in Blue Jays gear to support his other son, Kyle Phillips. And that is Al sitting right next to Tim. 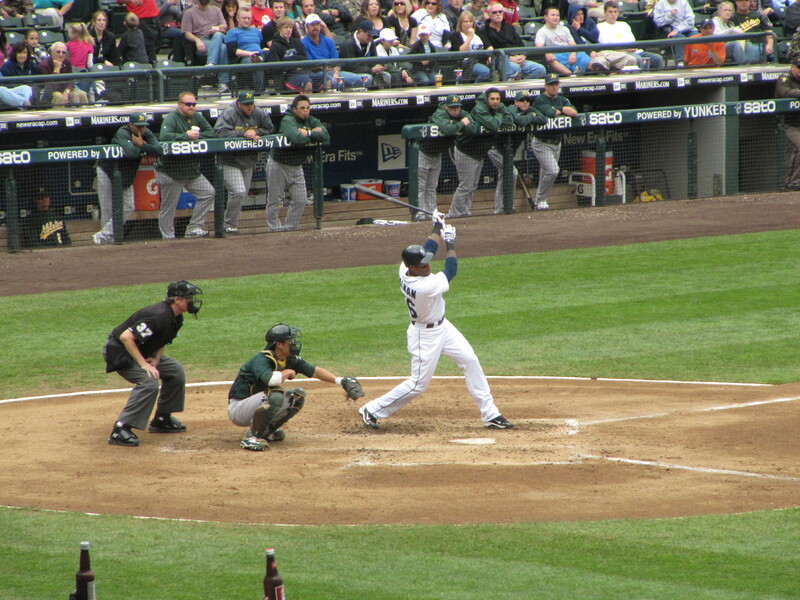 …followed with a groundout for the final out of the top of the third inning. Leading off the bottom of the third, Scott Hairston got the first Padres hit of the day off of King Felix, and then something crazy and horrible followed. 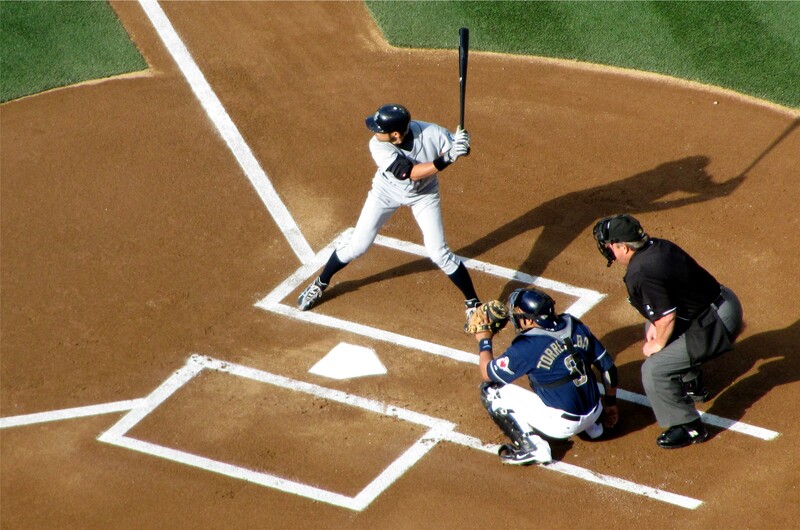 I don’t think that I have ever witnessed a professional “inside the park homerun” before, Tim definitely had not. After witnessing this one, I think they should be called “quadruples” because they are a whole lot more like triples than they are homeruns. 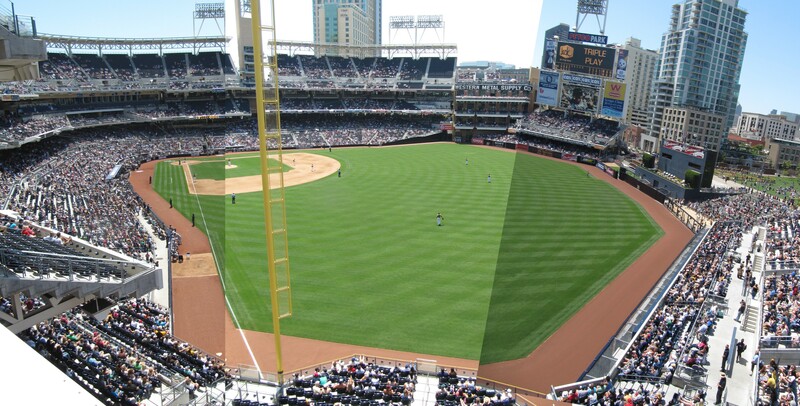 They’re fundamentally different than homeruns. Pretty exicting. I just wish the Mariners could have had a “do over” because Gutierrez catches everything and given a second chance, I know he would have caught this one too. …in the form of a traditional 2-run homerun in the top of the fourth. The score was now tied 2-2, much better. 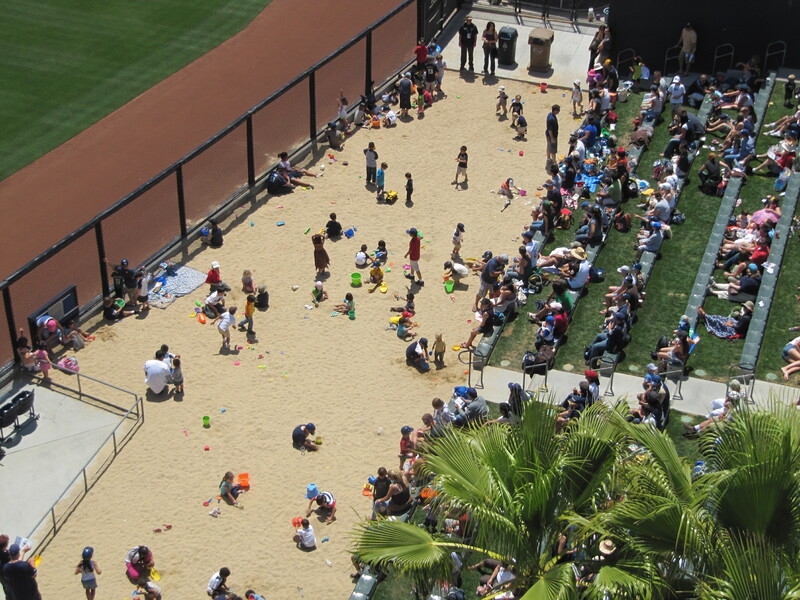 By the way, check out the kids sitting digging in the sand with their backs turned to the field. Not a bright idea. 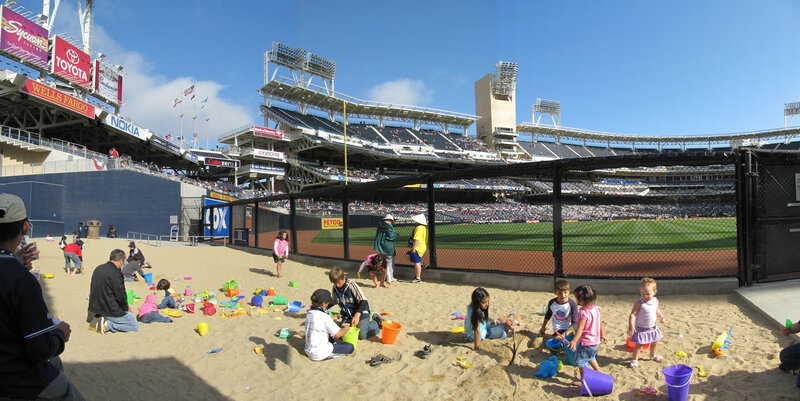 Hopefully no kid ever gets (or has already gotten) tagged by a homerun into the Beach. …I describe it as “weird” because from most places in the stadium these flags range from very hard to see to impossible to see. In fact, I never noticed them until walking by them…for the second time. Sometimes Tim is a little shy. 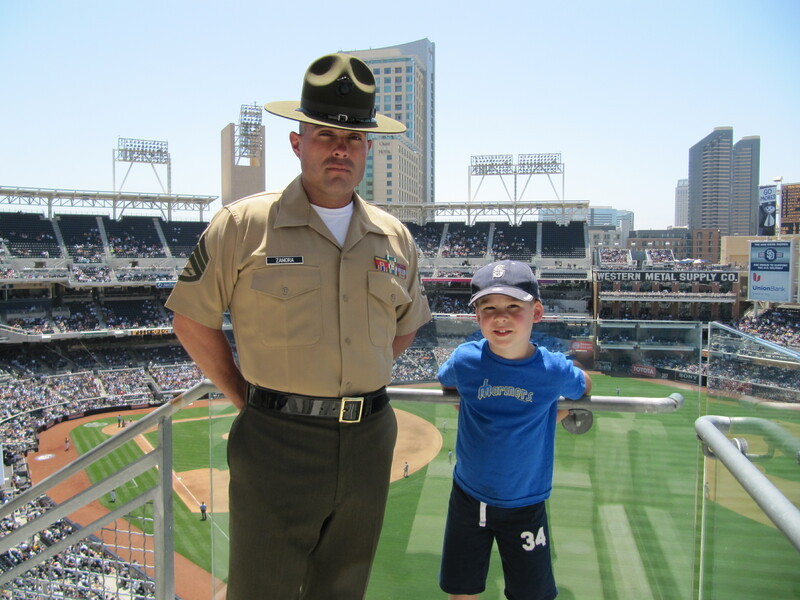 Just before these pictures, he walked down the stairs whispering “thank you” to the Marines. I am positive that none of them heard him. …with the score tied 2-2 in the bottom of the seventh. …and exploded a bunch of peanut shells. See that funny straw hat on the lady sitting in front of Tim in the top right picture? That old lady was unintentionally hilarious. 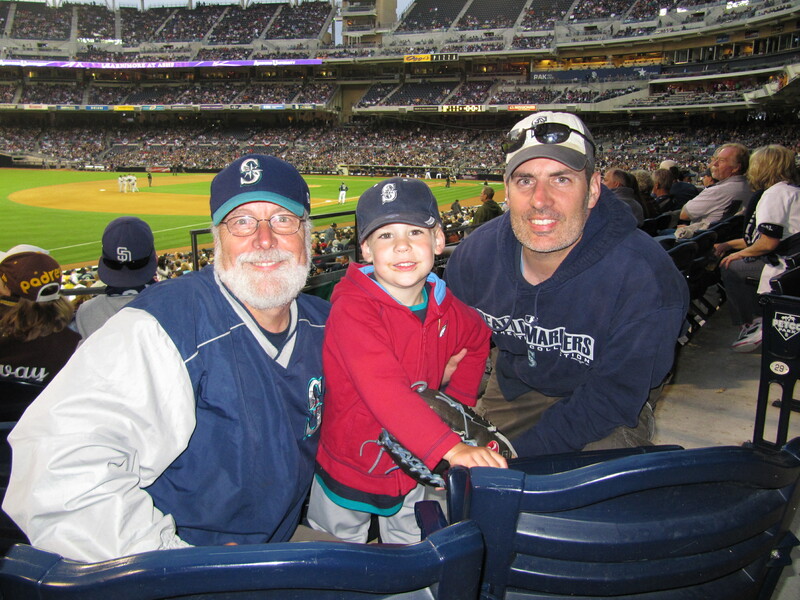 She was a Padres fan and her husband was a Mariners fan who used to live in Seattle. At random times throughout the day, she would aggressively mutter “hit it over the fence! 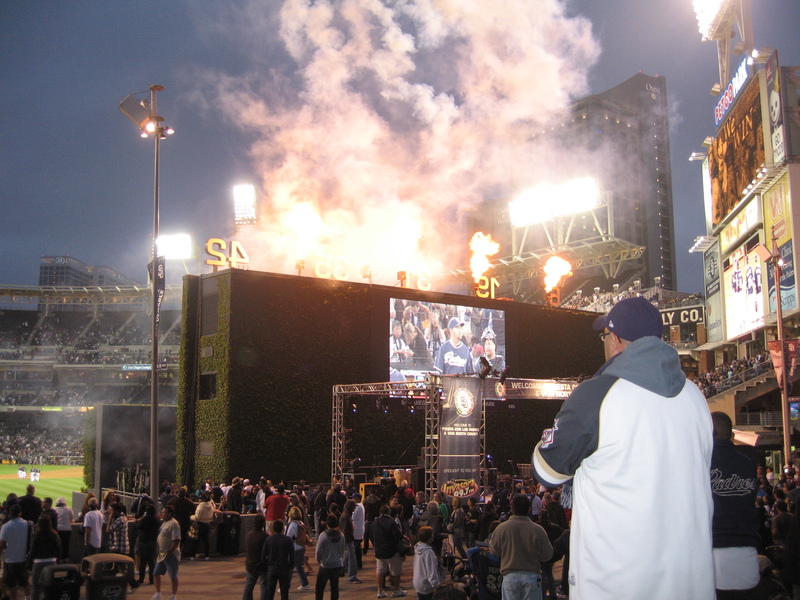 hit it over the fence!” at her Padres batters and she would sound disgusted if the Mariners did anything good. Luckily, the Mariners gave her a few more opportunities to sound disgusted. Going into the top of the 8th inning, the score was still 2-2. The Padres starter, Clayton Richard, had gone 7 innings giving up only 5 hits and 2 runs, but they lifted him for Luke Gregerson in the 8th. 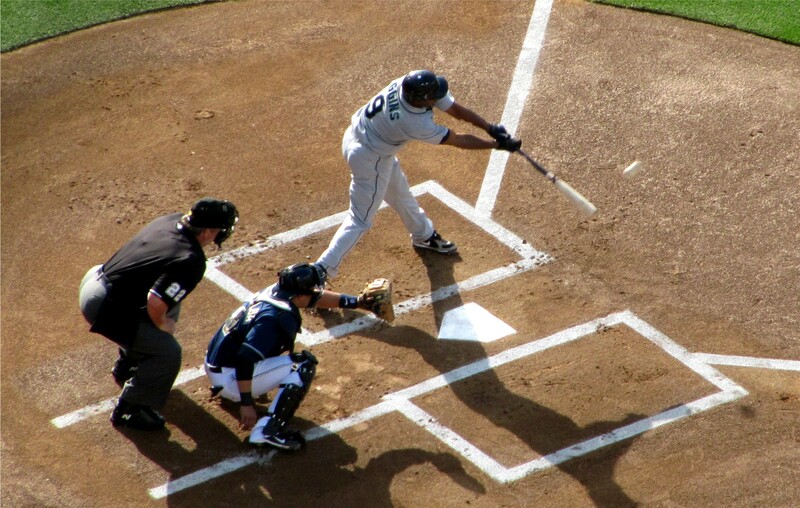 …for a line drive double down the 3B line. 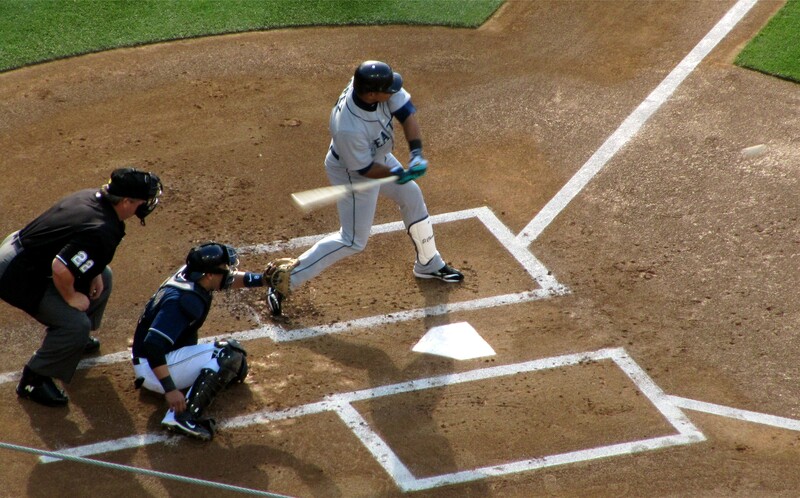 Chone touched home to grab a 3-2 lead for the Mariners. 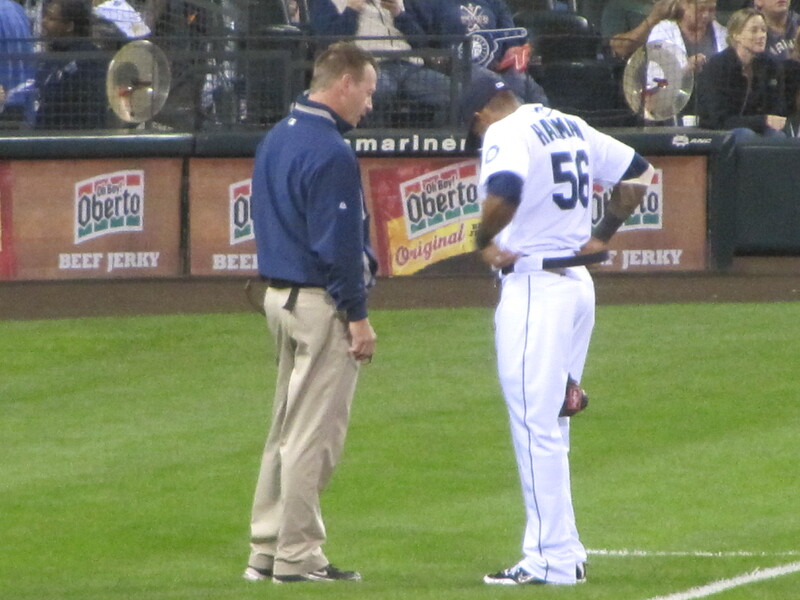 …the Padres weren’t too happy with the call, but Hernandez wasn’t persuaded to reconsider his call. In the top of the 9th, the Mariners were still leading 3-2 when Joe Thatcher took the hill for the Padres. 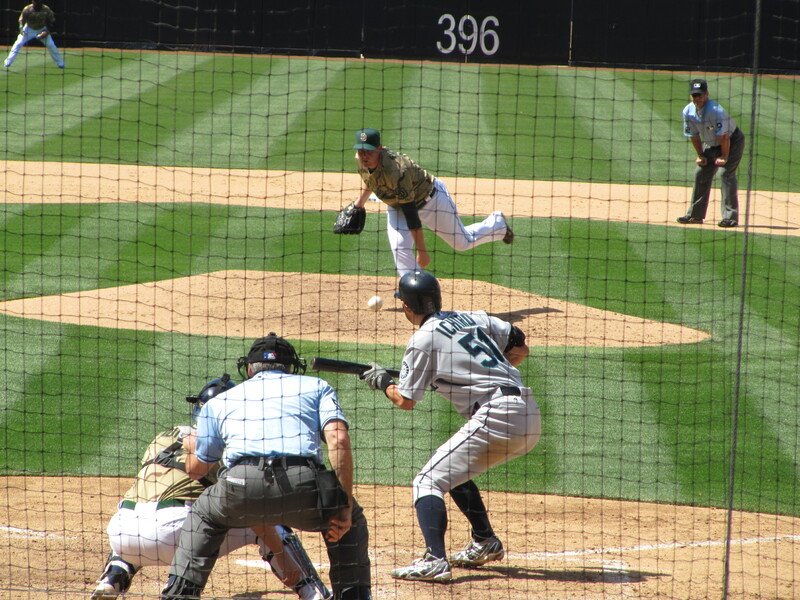 Thatcher promptly surrendered a single to Mariners catcher Rob Johnson. It was Rob’s third hit of the day and I later learned that it was only the second 3-hit day of his career. Interestingly, we were also present for his only other 3-hit game last season. 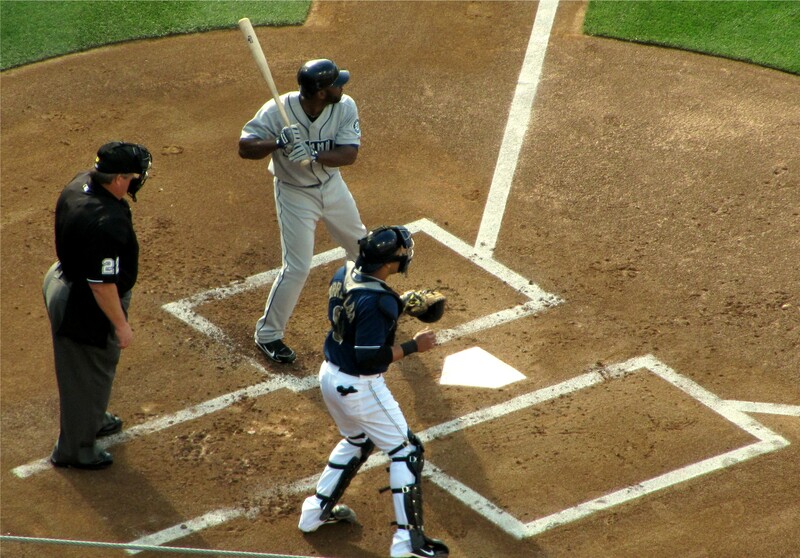 Felix Herandez came to the plate next and sacrificed his favorite catcher over to second base. 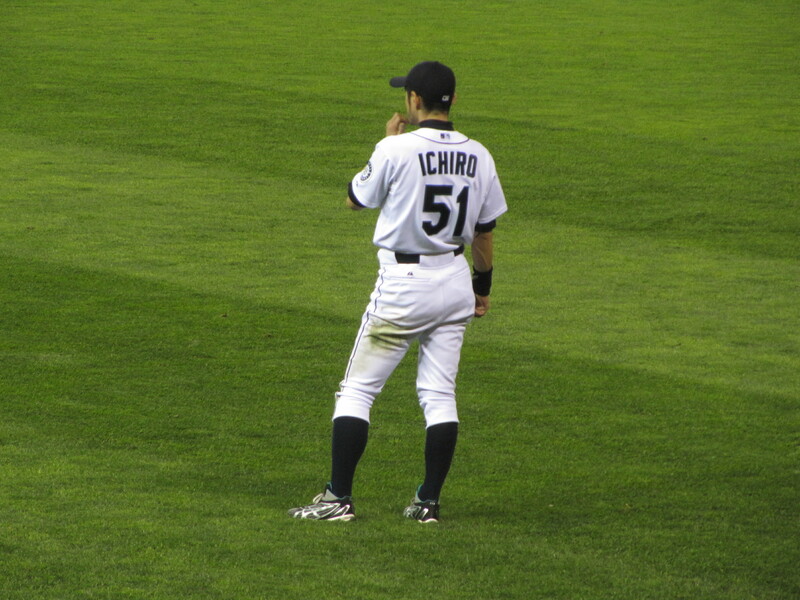 …Ichiro took Rob’s spot at second and Rob took Ichiro’s at home. And just like that the Mariners had a 4-2 lead. Tim and I like to try to get a ball from the umpire after a game. But in the first four games of the roadtrip we hadn’t even tried. Since we were already sitting so close to the umpires’ tunnel at this game, we figured we might as well give it a shot. 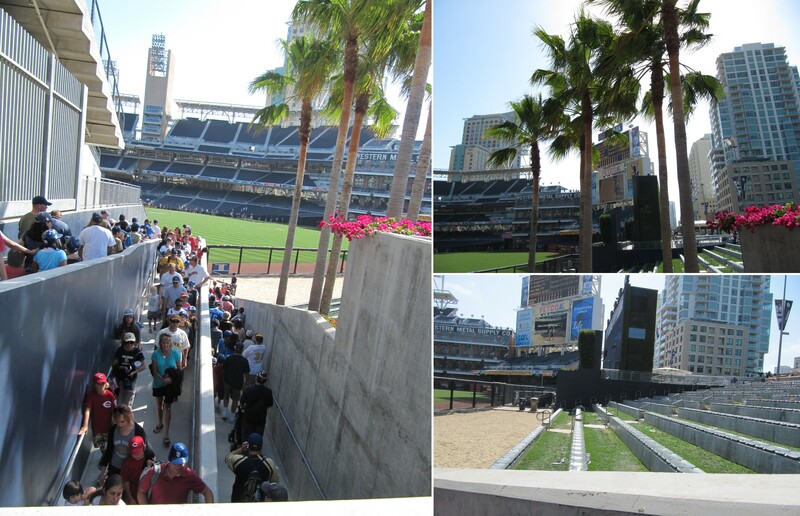 The umpires’ tunnel at Petco Park is at the home plate side of the visitors’ dugout. 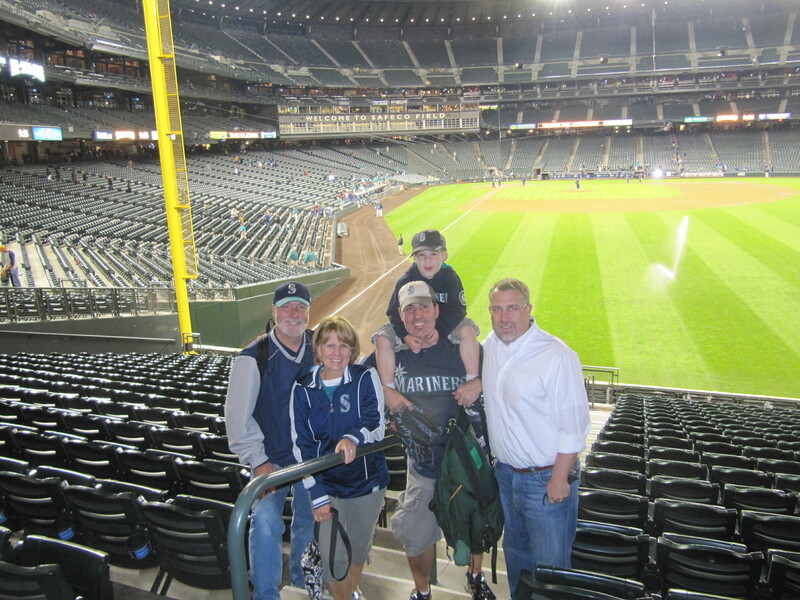 In the bottom of the ninth, with Felix back on the mound gunning for a complete game, we headed over to try to stand in the cross aisle right behind the tunnel. An usher saw us and suggested that we sit in some of the open seats nearby. He pointed out some seats that he had in mind. 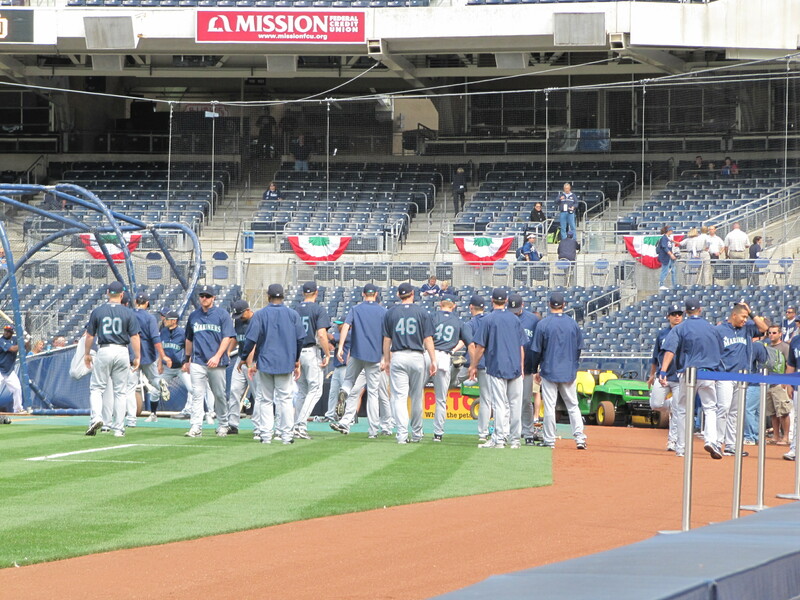 In that picture, Felix Hernandez is about to walk down into the dugout. He got the first batter in the bottom of the ninth, but then surrendered a single to Adrian Gonzalez. When Scott Hairston hit an infield grounder, everyone in the stadium thought it was a game ending double play. 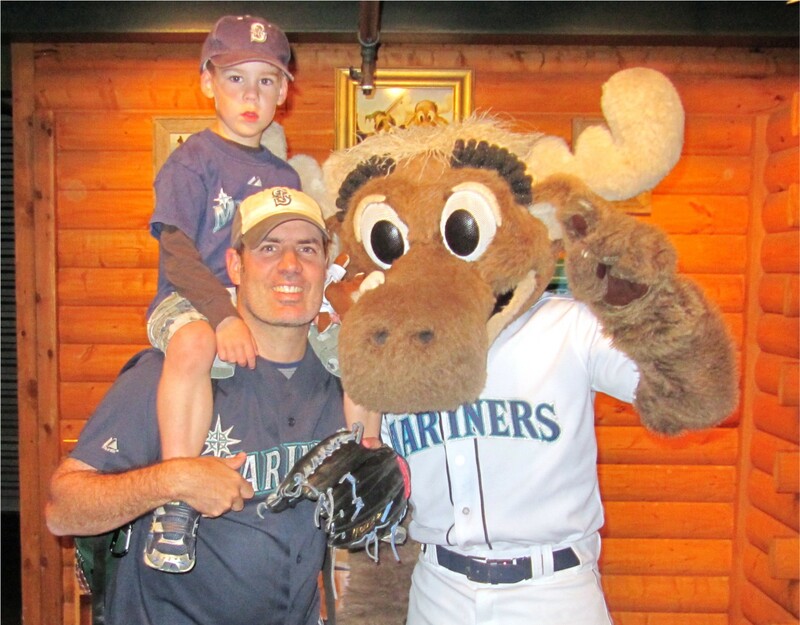 But Hairston beat it out and Mariners manager Don Wakamatsu decided to pull Felix and put in David Aardsma. 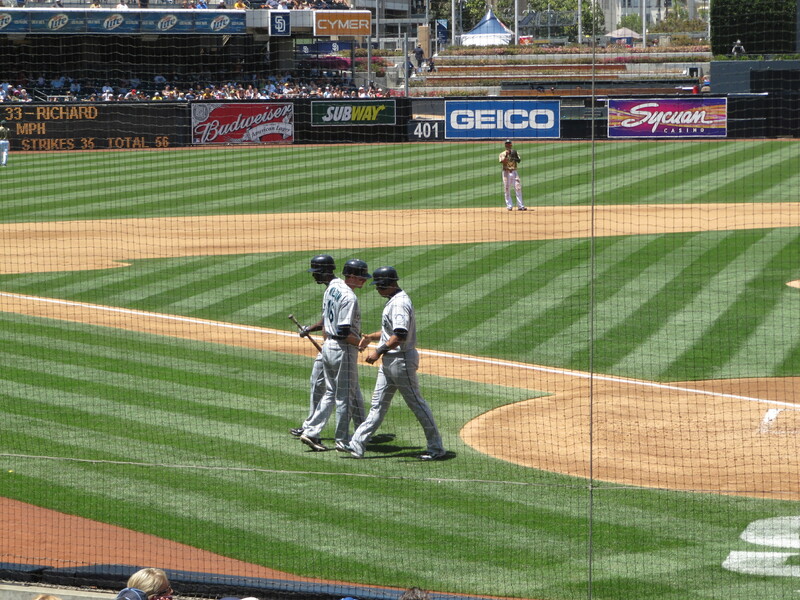 After the almost double play, the usher came by to give us some advice on getting a ball from the umpire. He was very nice. But with the pop fly out, we had plenty of time to get into the corner spot right at the back of the dugout and side of the umpire tunnel. …5 seconds later, 3B umpire “Cowboy” Joe West walked by and grabbed the baseball back from Tim and started walking into the tunnel with the baseball. He then turned back around and brought the ball back to Tim. He was very amused by his little prank. And we used the opportunity to give Joe West some high fives and then get this awesome picture (above left) of Tim and West. I had wanted real bad to get a picture of Tim with an umpire for the mygameballs.com photo scavenger hunt. It seemed to me like it was the hardest picture in the competition to get. The umpires generally don’t linger on the field after games. They take off quick. So the fact that West decided to play a fast one on Tim and take his baseball back was the perfect opportunity. Thank you, Joe West! And thank you, Angel Hernandez, too! 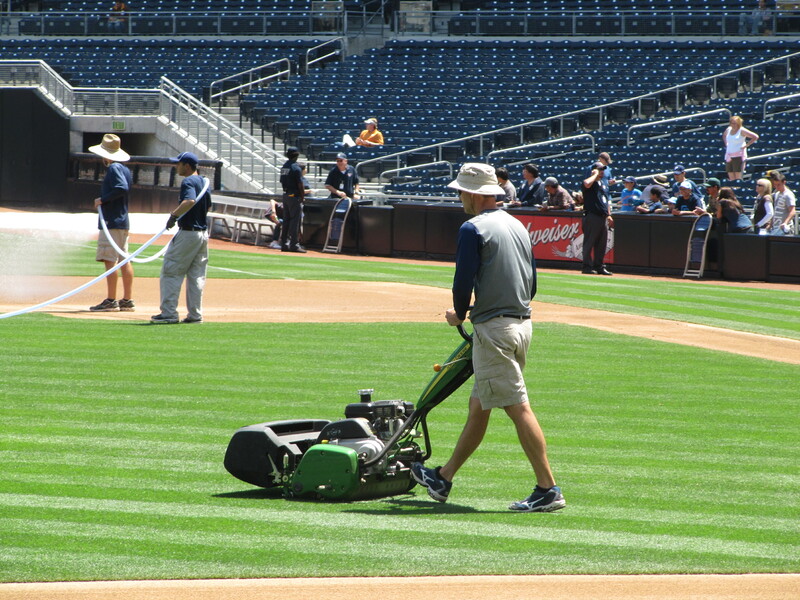 Our day at the ballpark wasn’t finished just yet. 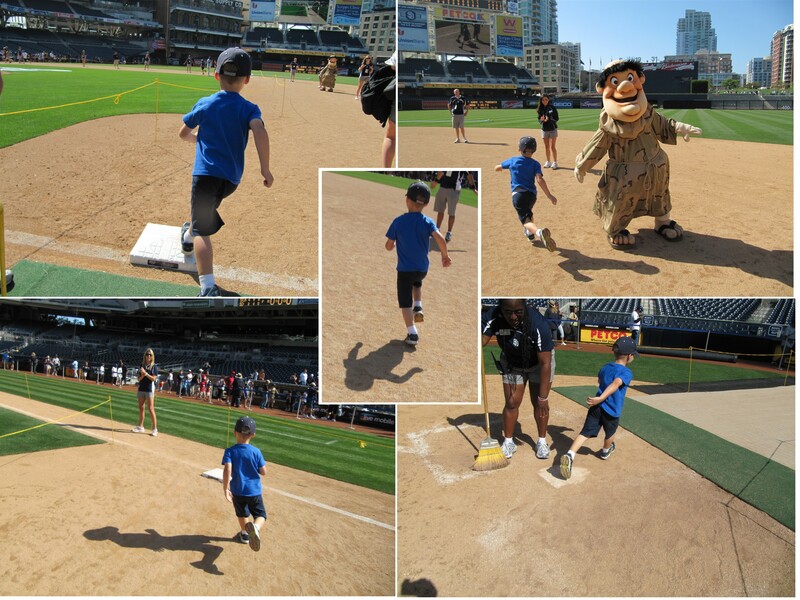 It was Kids Run The Bases time! 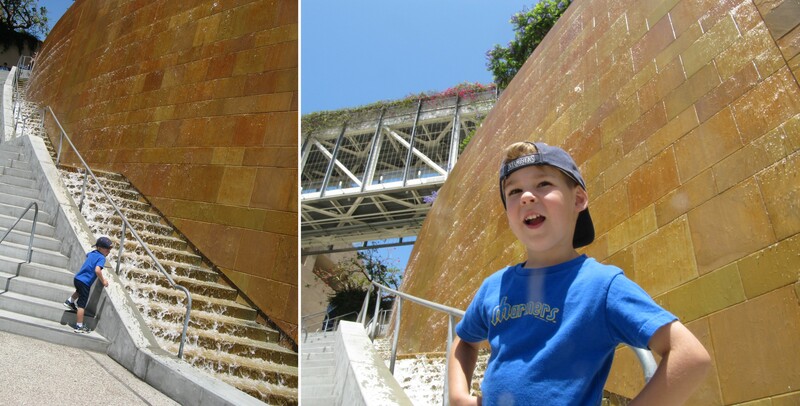 …after I took those pictures, he told me he was standing like an umpire. 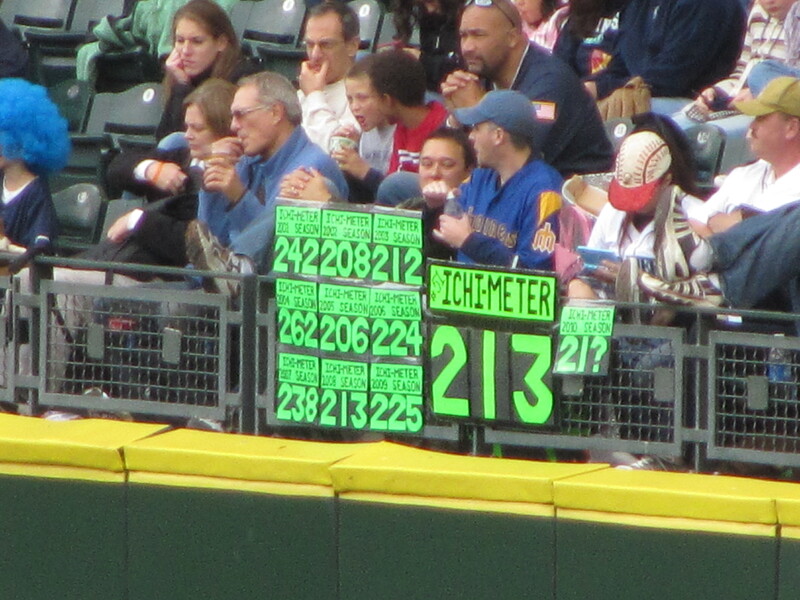 …first I told Tim to stand next to the “322” like he was playing outfield. Then I told him to jump against the wall like he was trying to catch a baseball. I absolutely love that jumping picture. Check that out, he’s hanging in the air! 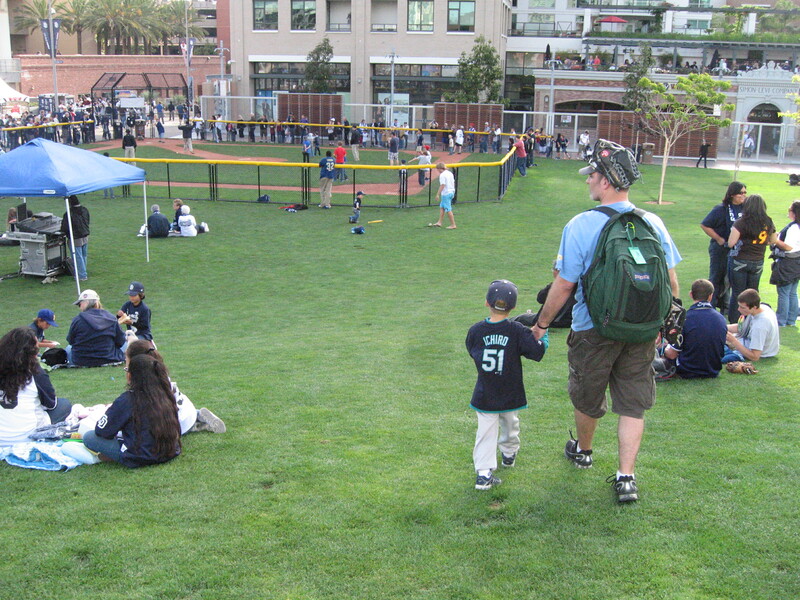 …by the way, we seemed to be the only people running around taking fun pictures on our walk to home plate. Sure, some people were taking pictures with the field behind them. 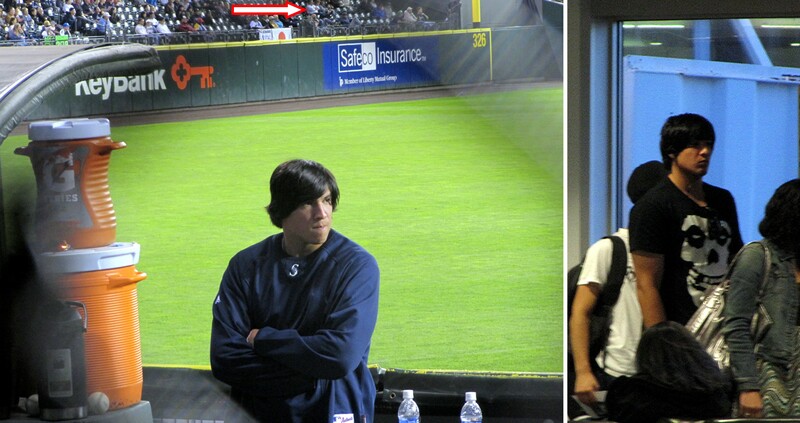 But I didn’t see anyone else snapping pictures by the wall or in the bullpen. They missed out on some great photo opportunities! 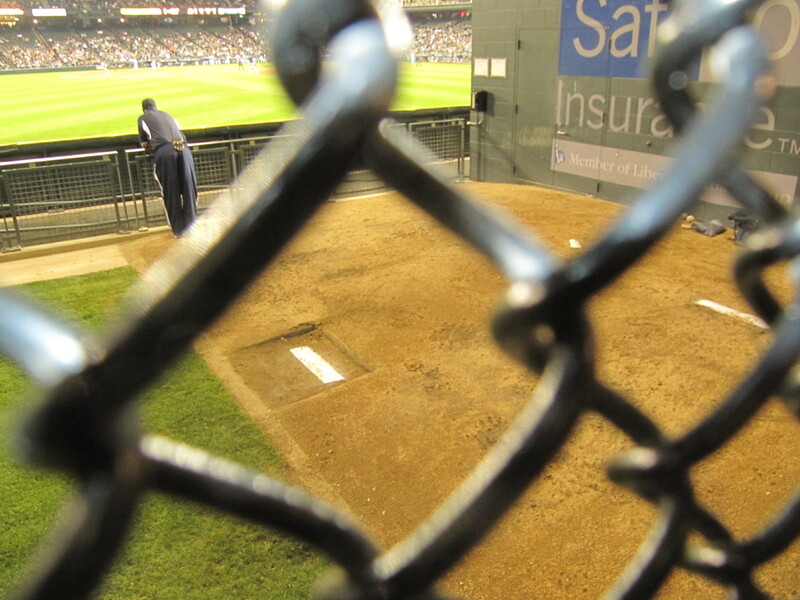 …and Tim sat on the bullpen bench. 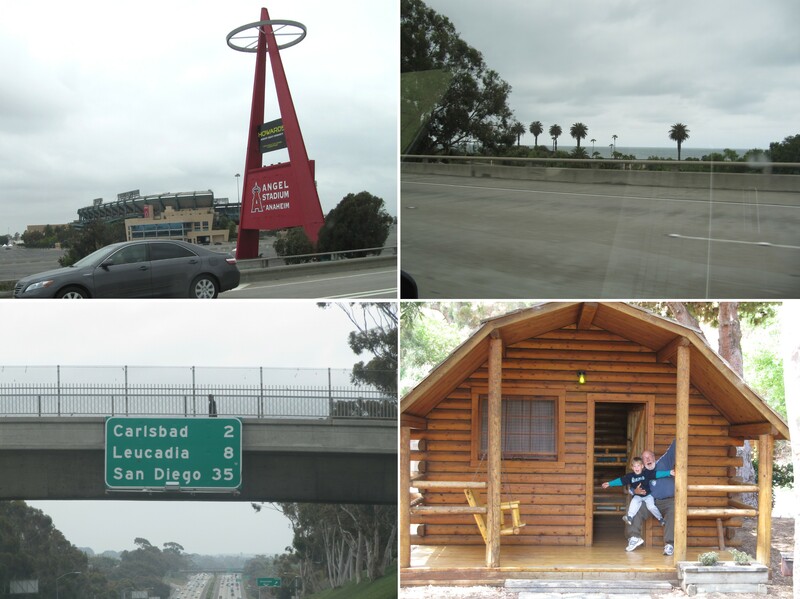 …along the way, Tim gave the Friar a high speed high five. By the way, see those two windows behind the LF fence? 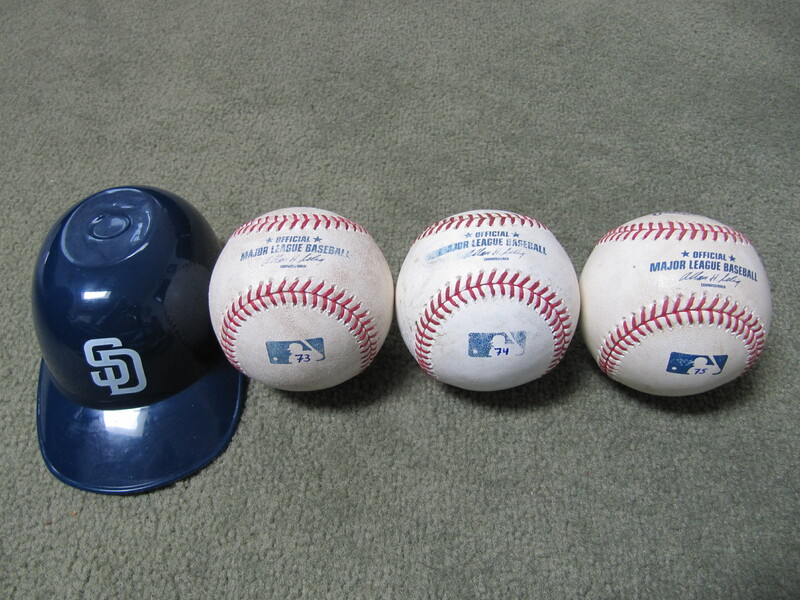 Those go into the Padres team store. 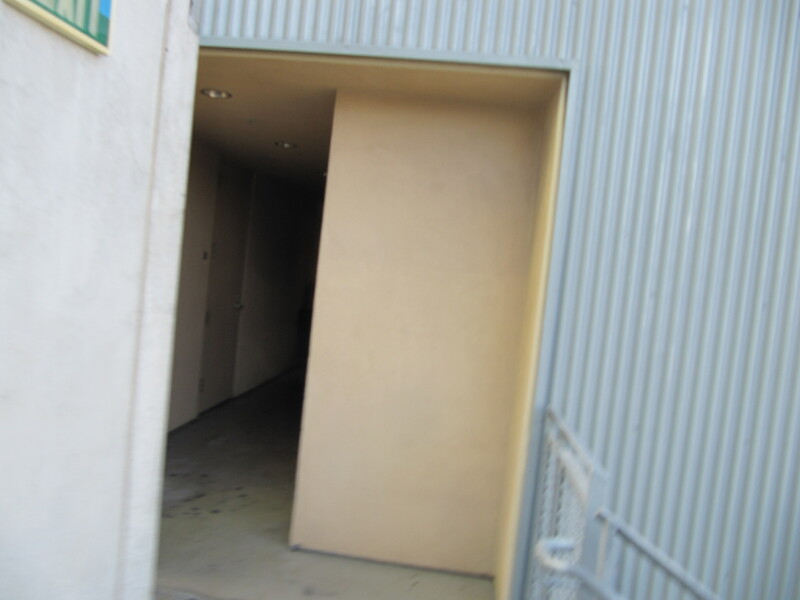 There is a door from the team store into a little triangle standing area just behind the fence where fans can watch the game from field level through the chain link OF fence. 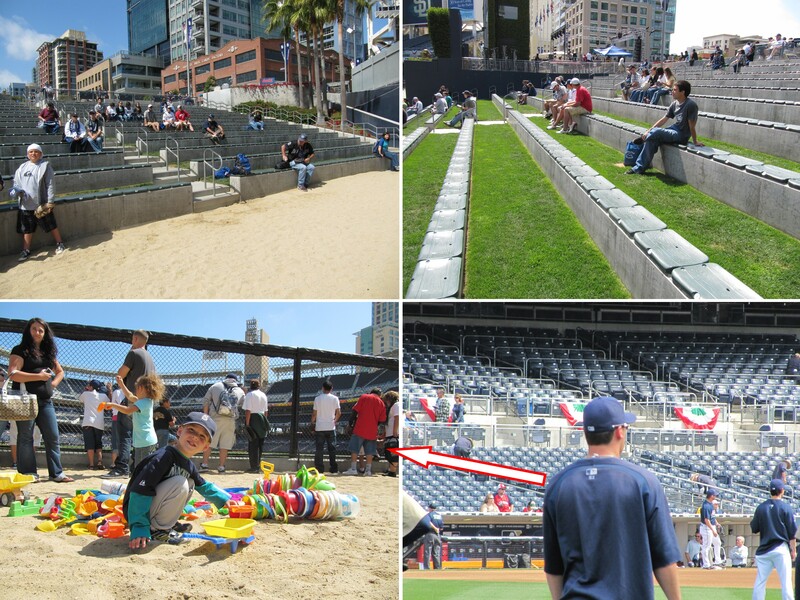 …and said our good-byes to Petco Park. 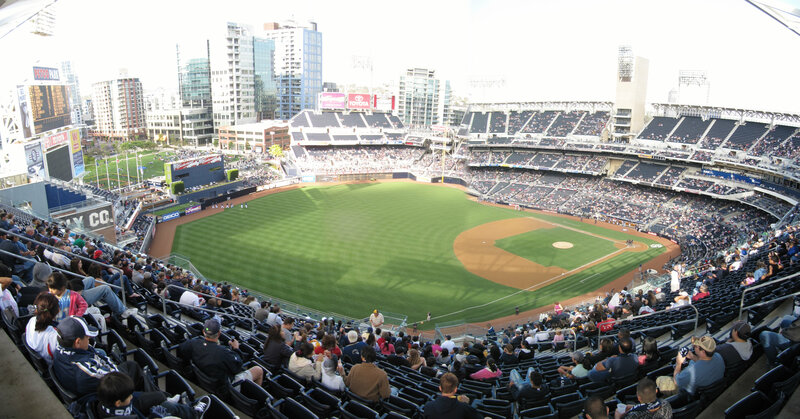 It was a great two game set in San Diego. 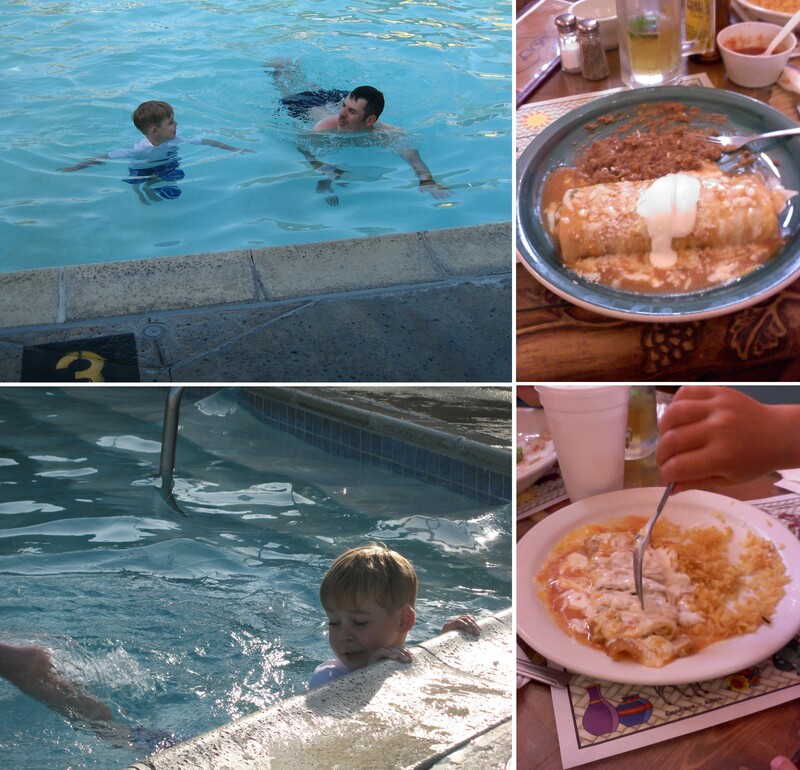 …and then went to dinner at an amazing Mexican restaurant in a little strip mall. It wasn’t an impressive place from the outside, but the food was delicious and the people were extremely nice. So, if you’re in Chula Vista, be sure to check out Casa Del Taco. 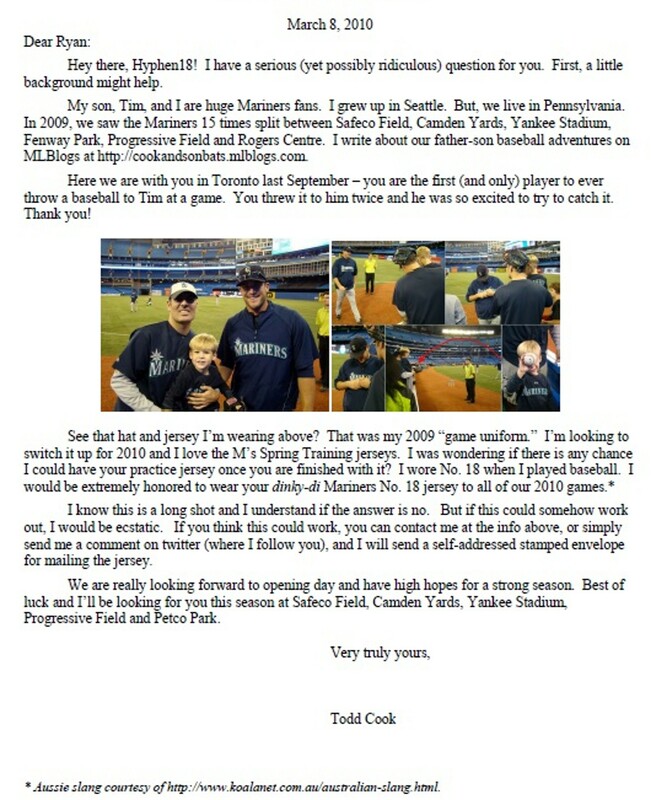 Written by Cook & Son Bats 6 Comments Posted in Dailies	Tagged with Angel Hernandez, Brandon League, David Aardsma, Felix Hernandez, Ichiro, Jason Phillips, Jason Vargas, Joe West, Kids Run The Bases, Luke French, mariners, Milton Bradley, padres, Roadtrip, Rob Johnson, RRS, Ryan Rowland-Smith, San Diego Padres, Seattle Mariners, Tony Gwynn Jr.
…to the city of San Diego, and then a little further south to our cabin waiting for us at the KOA in Chula Vista, California. 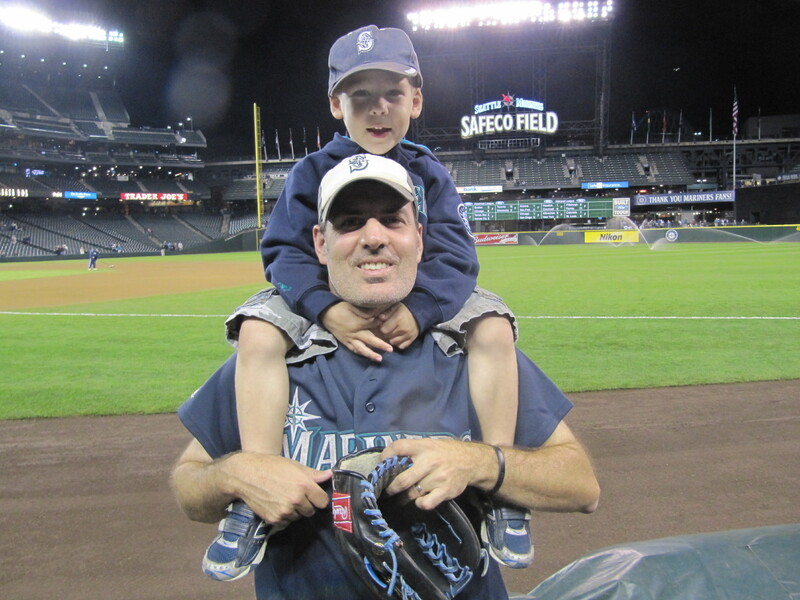 But more than anything, we were excited because over the next two days we’d be watching our Mariners try to battle out of a slump and win some ball games. Tim loves a good sand box, so he was in sand box heaven. 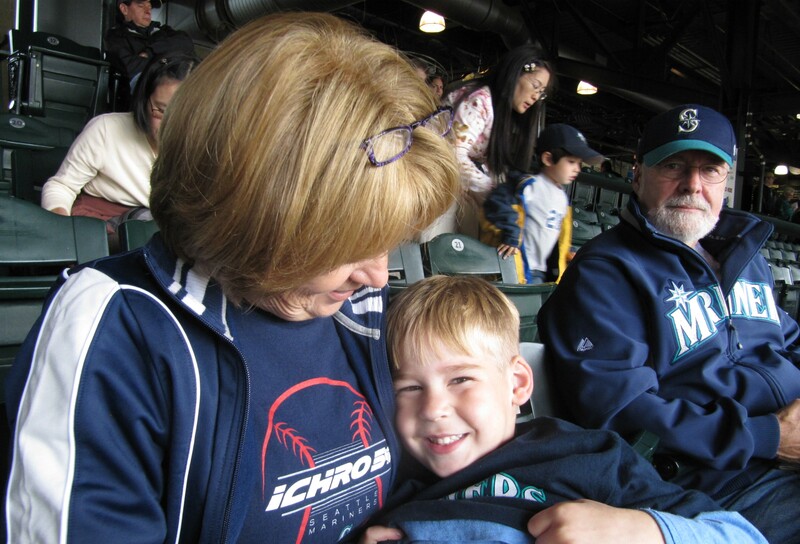 By the way, Tim was sporting a full Mariners uniform to this game — Ichiro jersey T-shirt, baseball pants, stirrup socks, and an M’s hat. 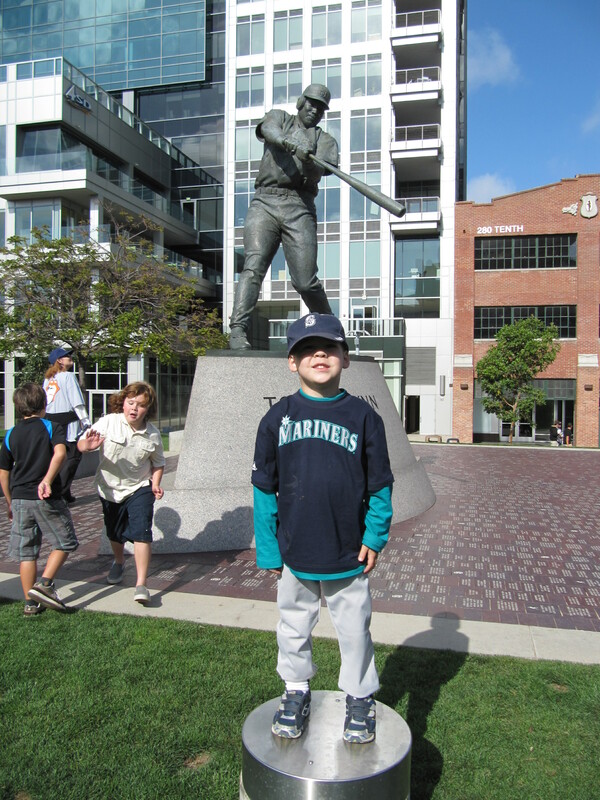 I told him that maybe Ichiro would ask him to play with the team. 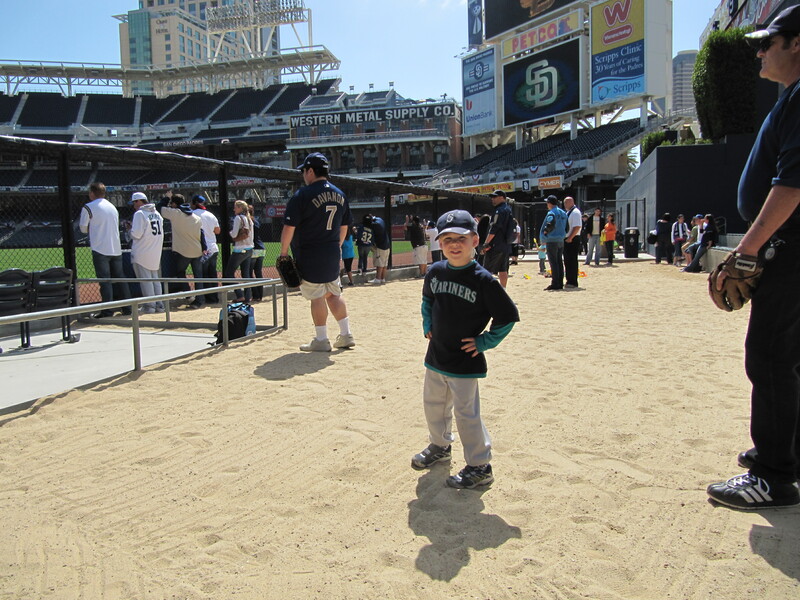 As Tim played with the dozens of buckets, shovels and other toys, the Padres were taking BP. 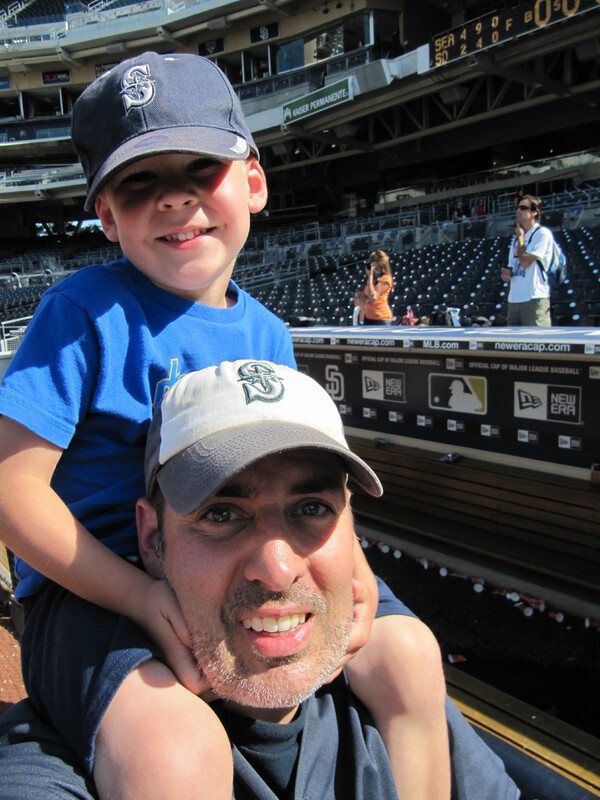 Eventually, a ball rolled to the wall in the deepest center part of the beach and Luke Gregerson moseyed on over to pick it up right in front of me and my Dad. 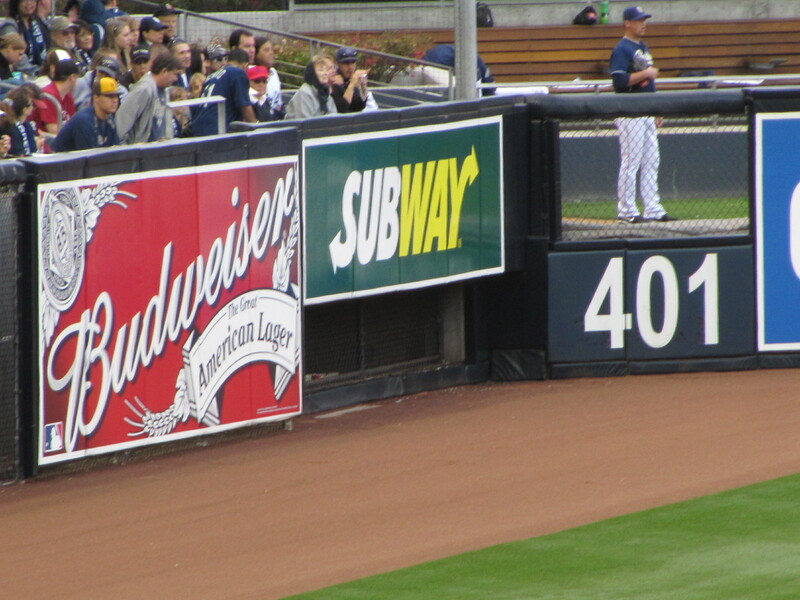 As you can see, the view of LF and CF is obstructed by the OF wall from the bleachers. Something funny happened when we were in the beach. 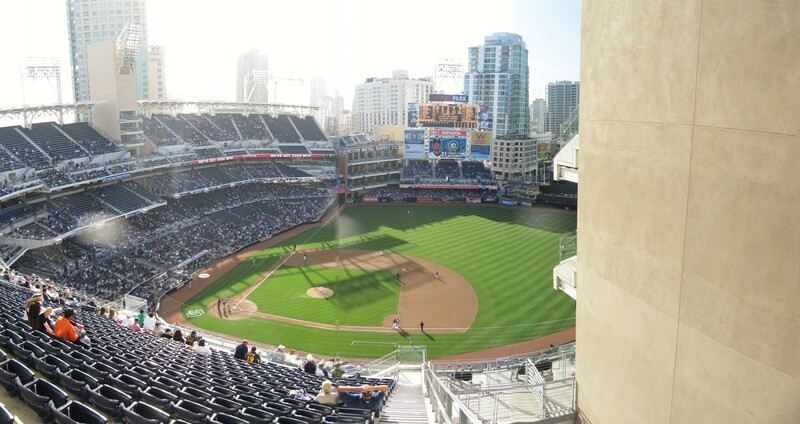 The Padres pitchers, including team jester Heath Bell, were running sprints in RF when a baseball rolled to the middle of the warning track toward the RF side of the beach. When Health Bell finished up his work and started walking over to LF, a girl called out to him and asked for the baseball. He walked over and with his foot pushed the ball up against the wall (which is simply a chain link fence in the beach) and said, “there you go!” and then he ran off. Then the girl, who was probably about 8-10 years old grabbed the ball through the fence and passed the ball back-and-forth from hand-to-hand as she went up the fence. When she got to head level, her dad picked her up so she could continue going up the fence passing the ball back-and-forth to herself. Finally, she was at the top of the fence and passed the baseball over the top to herself. I’ve never seen anything like that before at a game. Pretty cool. 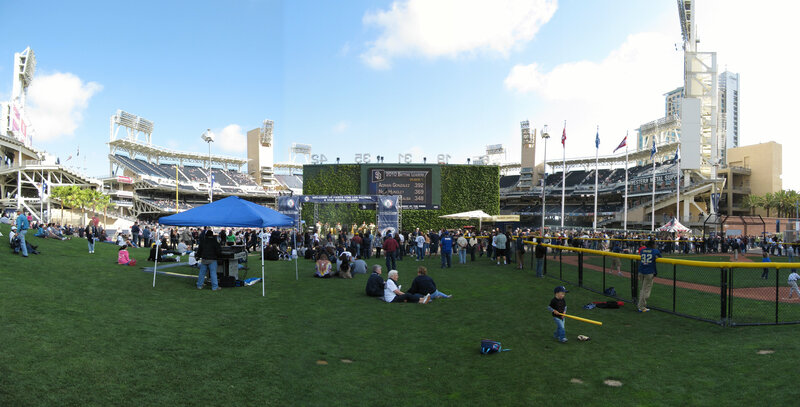 …all of that open space behind CF is where they store the batting cage during the game. While we were hanging out in the Beach, a guy named Scott (who just commented on our last game) — Hi, Scott! — came up and introduced himself to me and said he enjoys reading our blog and checking out our pictures. Its always cool to meet someone who enjoys following along with our adventures on MLBlogs. 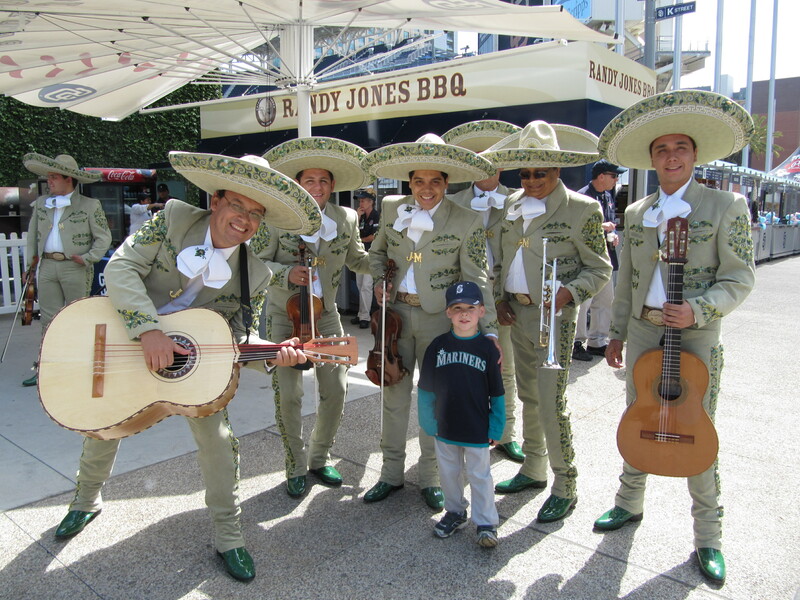 …I absolutely love Mariachi music so I couldn’t pass up the opportunity to get Tim’s picture with the band. Check out the one guy whose face is hidden behind two of his bandmates sombreros!. 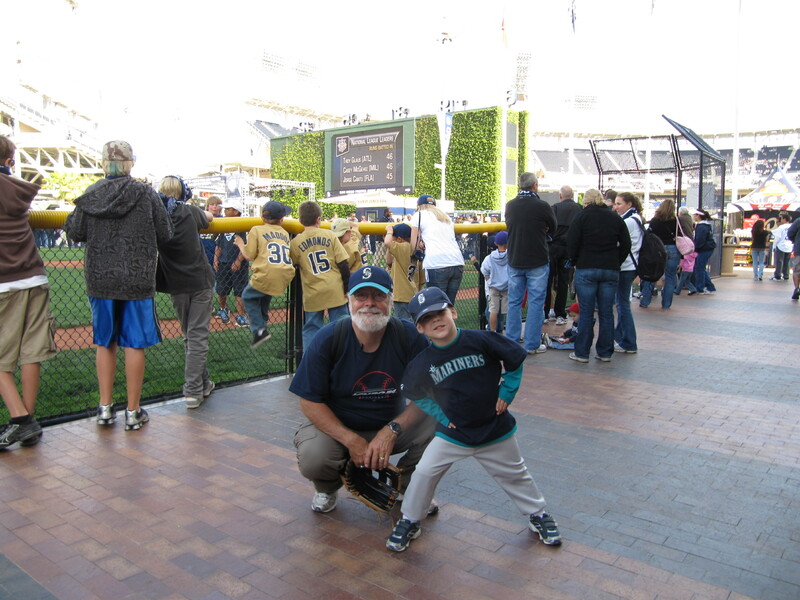 …in that last picture that is Heath Bell crouched down like a catcher and a Padres player and ball boy looking kid were taking turns pitching to him. Later, Heath was practically wrestling the kid in the OF. 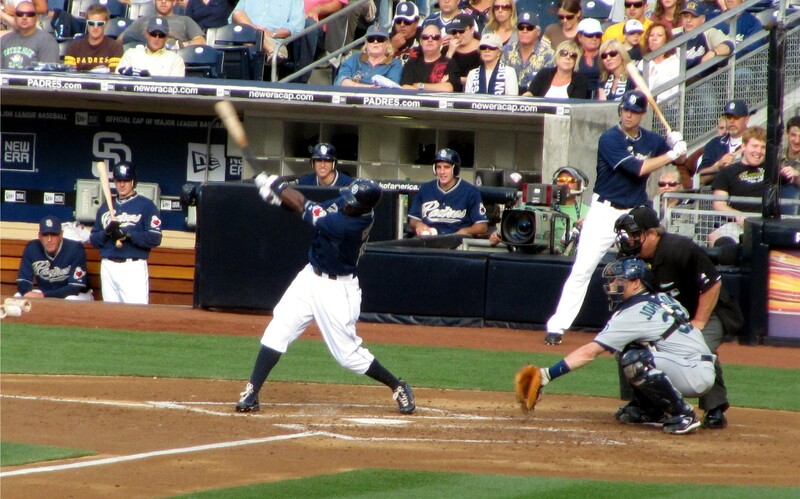 Bell was having himself a good old time during BP. To get from LF to the seats in foul territory down the 3B line, you have to go behind the Western Metal Supply Co. warehouse and up a couple flights of stairs. 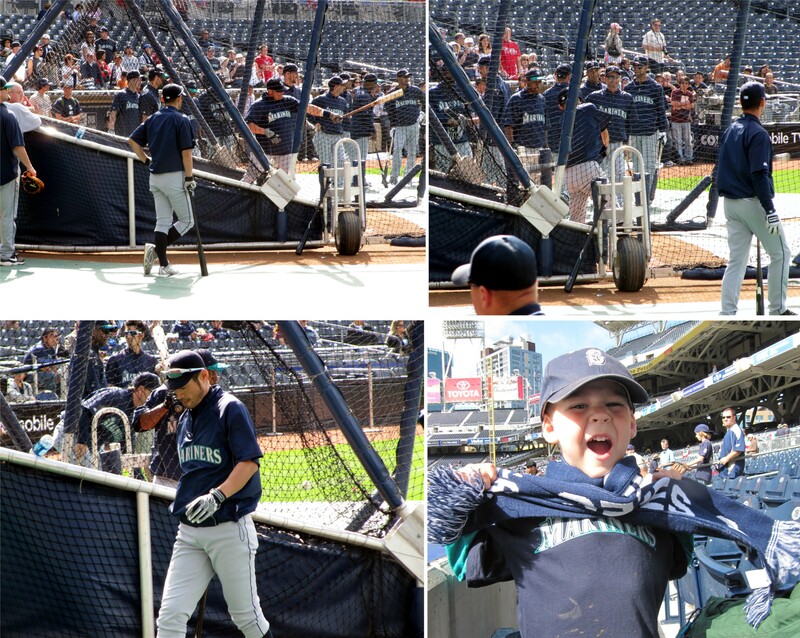 And that is what we did when we saw the Mariners come out and start stretching in front of their dugout. …as they ran back toward 3B for the final time, Cook & Son Hall of Famer Ryan Rowland-Smith was at the front of the pack and he immediately noticed us sitting in the front row a couple sections passed 3B. He gave me a nod and I have him a wave with my glove. 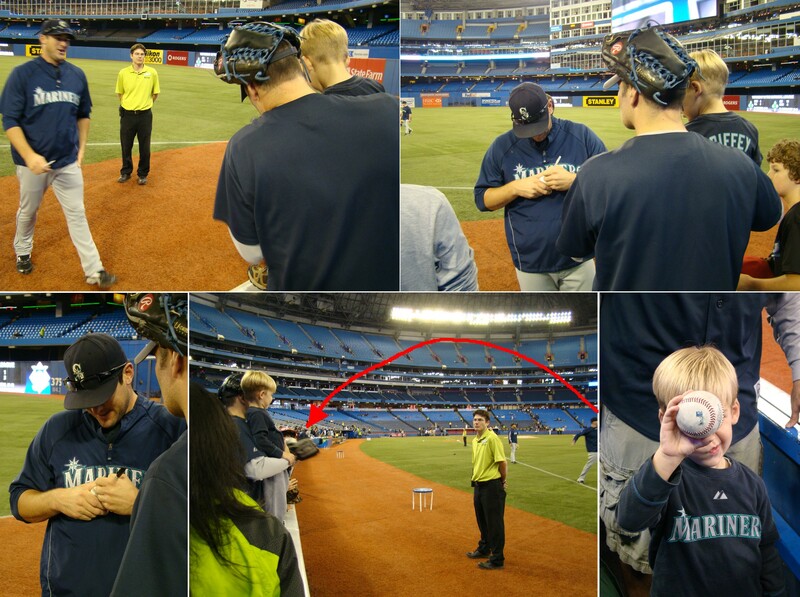 …and signing that ball the random fan had just given to Tim. We got RRS to sign baseball for us last season, so after he signed this ball, I gave it to my dad who has never got RRS’s signature. …for 15-20 minutes (note, that on the clock behind us you can see there is a 7 minute difference between those last two pictures). We talked about all sorts of cool stuff, but I am going to keep our conversation private becaues I didn’t ask RRS if he would mind if I shared our conversation on here. But I will note that one of the coolest parts was when RRS talked about the conversations he has on a daily basis with Cliff Lee as he tries to overcome his early season struggles. He got down in a catcher’s crouch and was showing us what locations he has been hitting and what locations he should be hitting. It was extremely cool to get a behind the scenes glimpse into the work that goes into being a professional pitcher. By the way, did you notice that they stationed a security guard to stand behind RRS as he chatted with us? Not only that, the ushers actually let us stand during BP so we could chat with RRS. I guess that is one of the perks you get when a player comes over to chat with you at Petco Park. Oh, yeah. I should also mention that I was wearing the jersey that RRS gave me! Eventually, we went our separate ways. 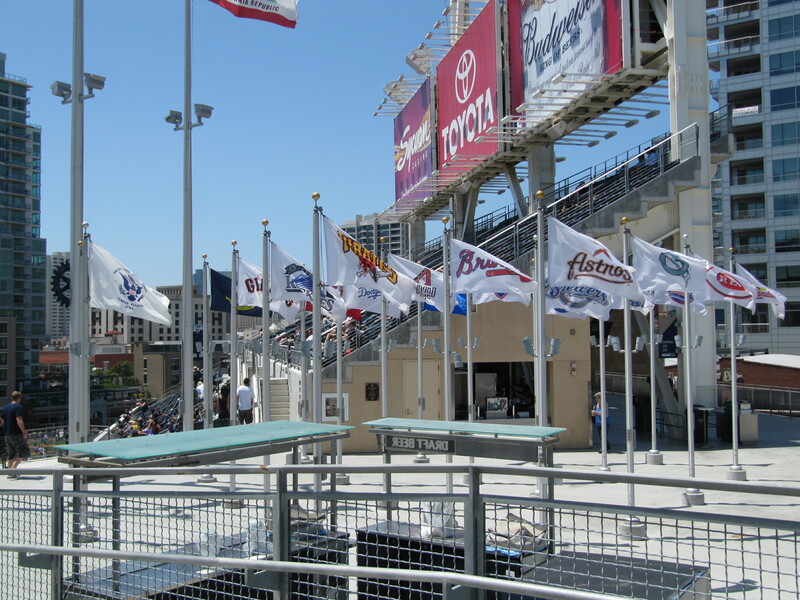 …Tim decided to tie himself in knots with the Padres scarf that they gave away to the fans at this game. 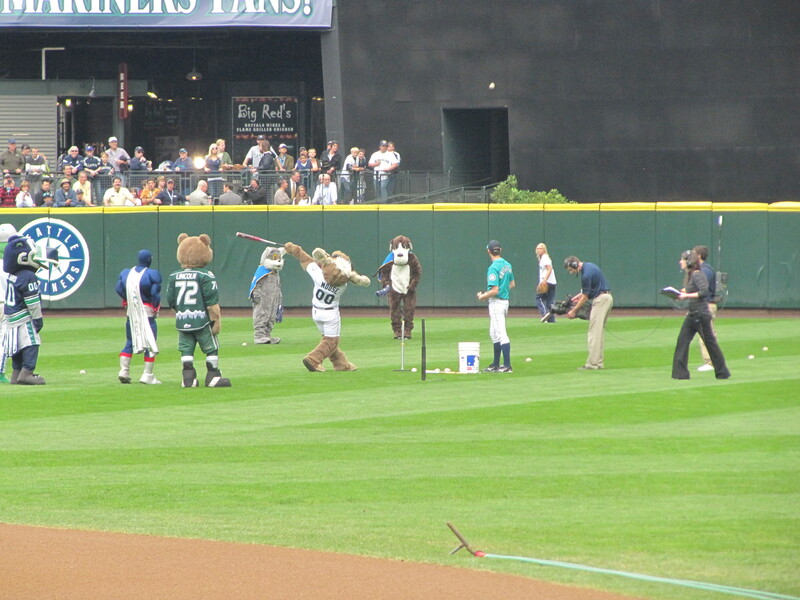 After the first group of Mariners finished hitting they all ran out into the infield to pick up stray baseballs and return them to the basket at the pitchers mound. 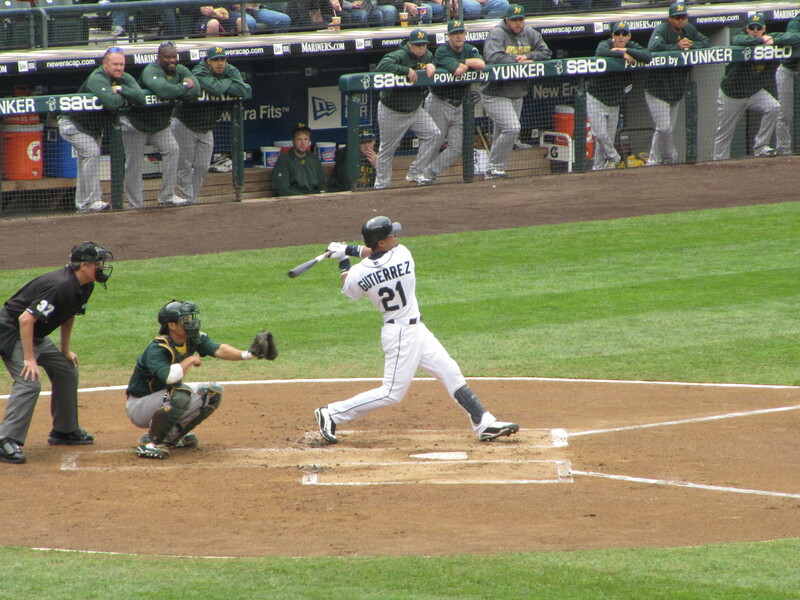 The pitcher was M’s batting coach Alonzo Powell. As he grabbed a ball just in front of the mound, I called out, “Hey, Alonzo!” He looked up and my Dad and I both flashed him some leather. 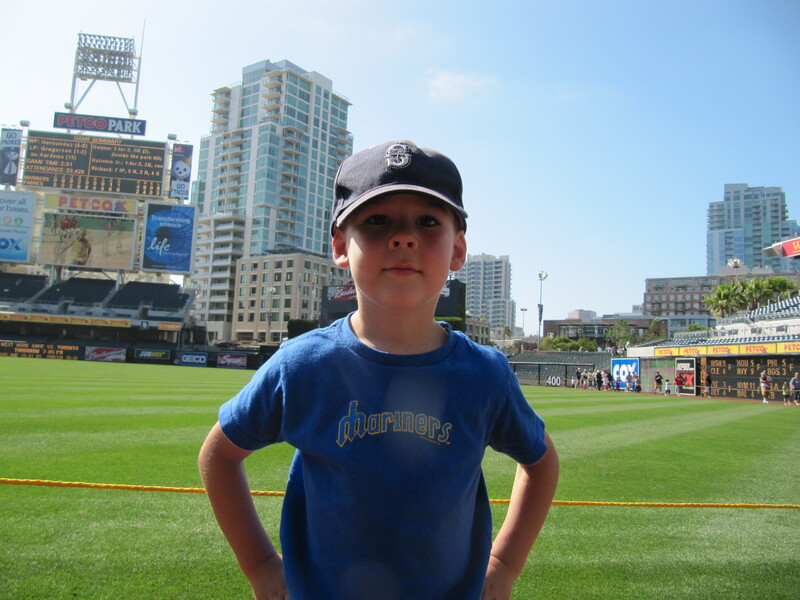 He tossed the ball over to my Dad for his first baseball at Petco Park. The front row was shoulder to shoulder. A couple Mariners pitchers were in LF including the D.A., David Aardsma. Soon, a ball got over his head and rolled the wall in front of us. I shouted, “Hey, D.A. 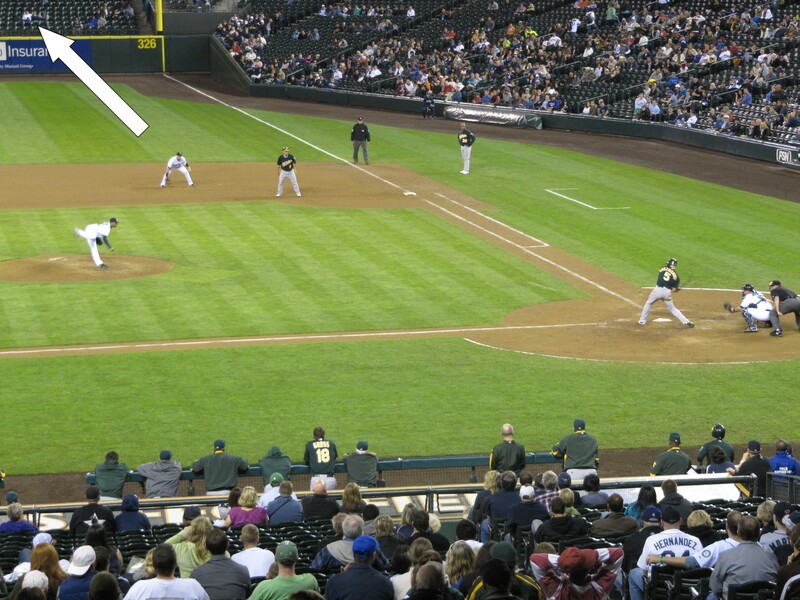 !” He looked up, made eye contact with me, and tossed me the ball on a weird angle as he walked back to his spot in LF. And this is what I don’t like about a getting a toss up in a crowded area. The ball was plainly, 100% without a shadow of a doubt intended for me and Tim, and I caught it without moving my feet whatsoever. However, with the weird angle on which Aardsma threw us the ball, I ended up catching the ball 6 inches in front of a young (22’ish year old), moderately good looking girl. I don’t think anyone would have thought anything about it if I just handed the ball over to Tim, but to me it felt a little funny. Actually, it didn’t feel funny, because I knew the ball was intended for us. But it felt like it probably looked funny (does that make sense?). So instead of handing the ball to Tim, I just opened my glove, held it out for the girl (who was there with her boyfriend), and let her grab the ball out of my glove. And she did just that, without a “thank you” or the slightest hint of acknowledgement that I’d just done something nice for her, which was not very cool in my book. The worst part is that the situation with the girl threw me off and I don’t think I even thanked the D.A. 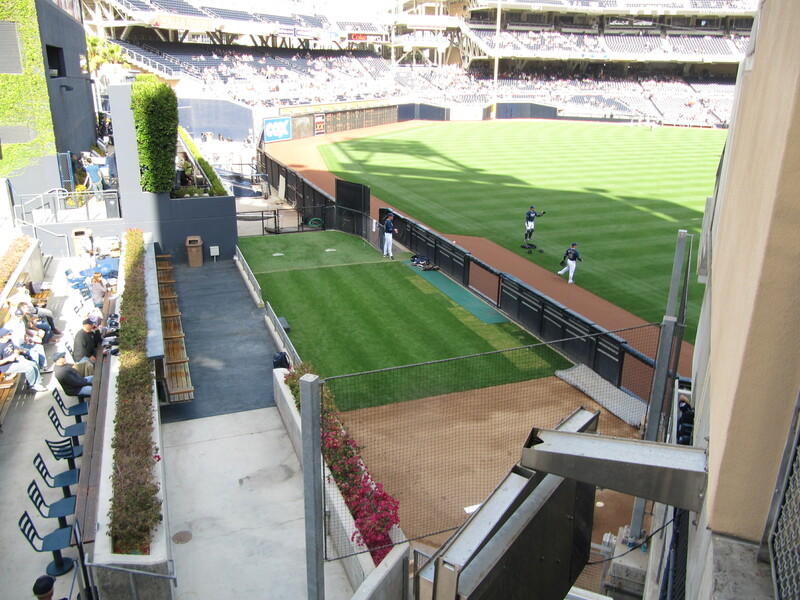 Remember this picture of the Padres bullpen, because in a bit, I will show you the Mariners/visitors bullpen. …click on the photo to see it much larger. Cool, huh? …a stadium worker had just walked into the hallway. There was no rope and no one to say I couldn’t go in there, so I did. As I walked down the hallway, there were a couple open doors with soda fountains and random food prep paraphenalia strewn all about. At the other end of the hallway, there were two food server type stadium workers and neither of them said anything to me. 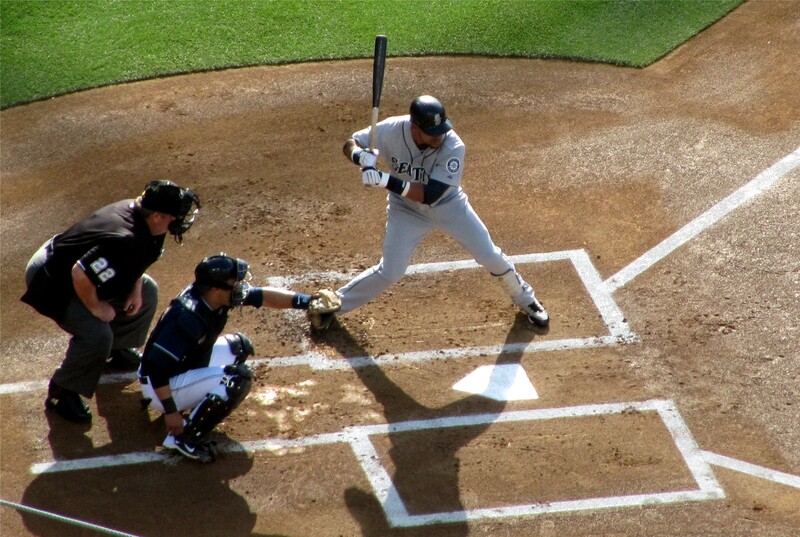 …as he started his swing that resulted in a leadoff single on the first pitch of the night. A good start to the game. …I liked this, we had a little something going here. 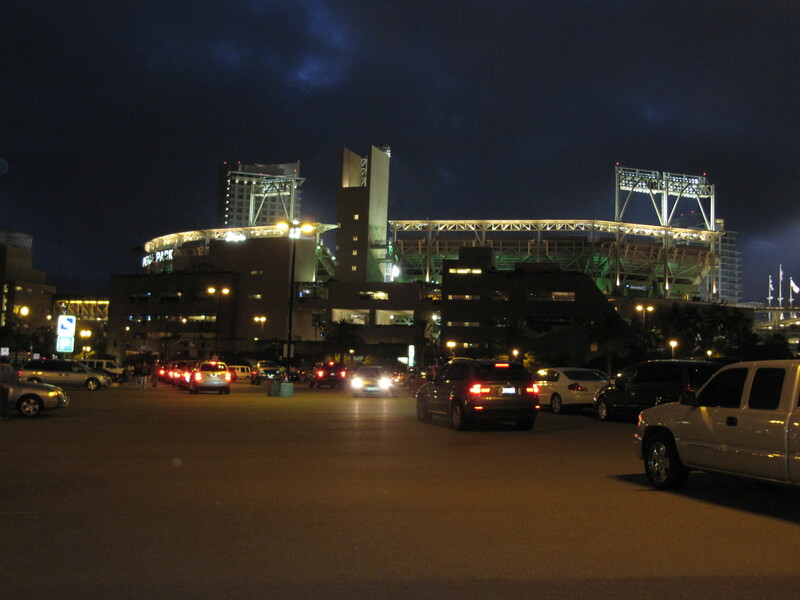 ….from right next to the light stand with the suites in it. 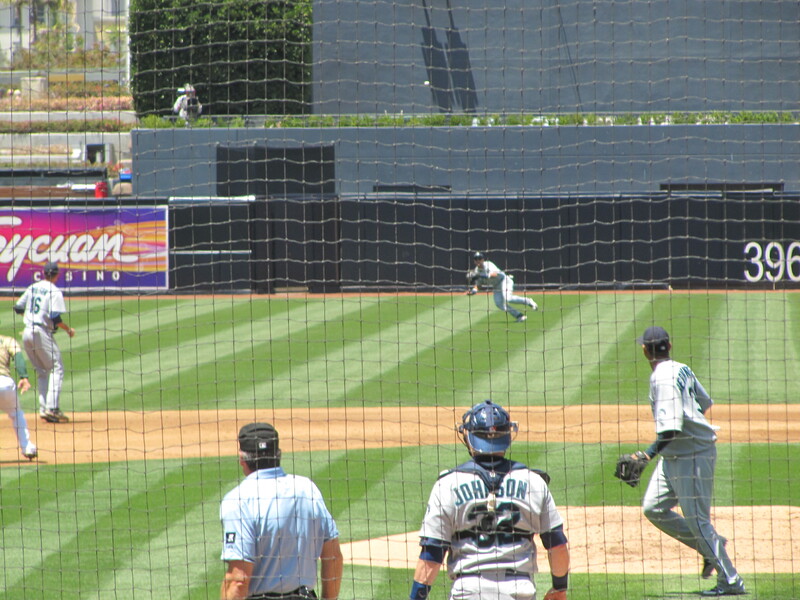 I then got this shot of Lopez…. 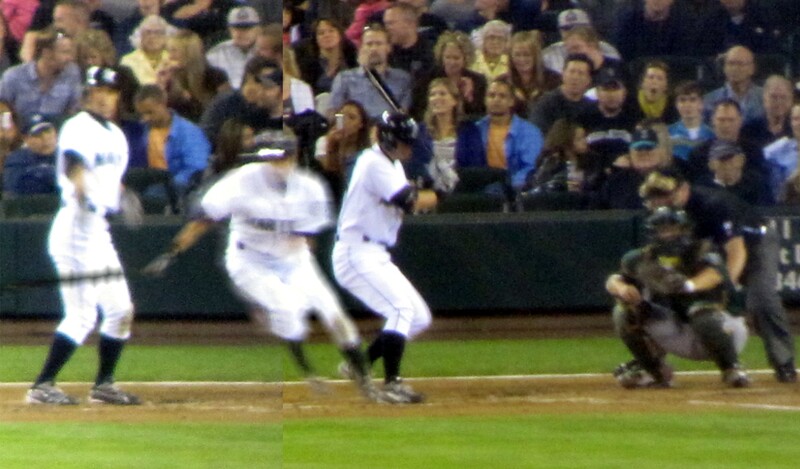 …right as he swung his way into a double play. 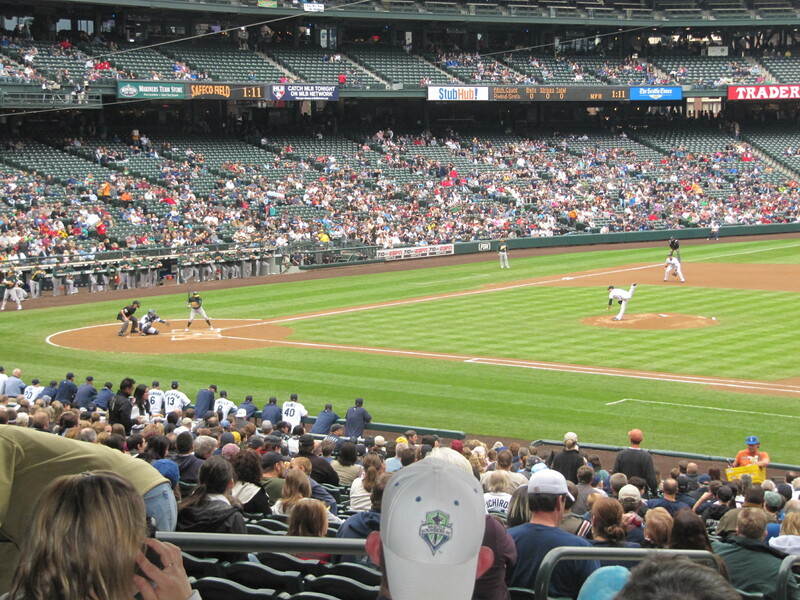 …so the M’s squandered a great opportunity to score some runs. 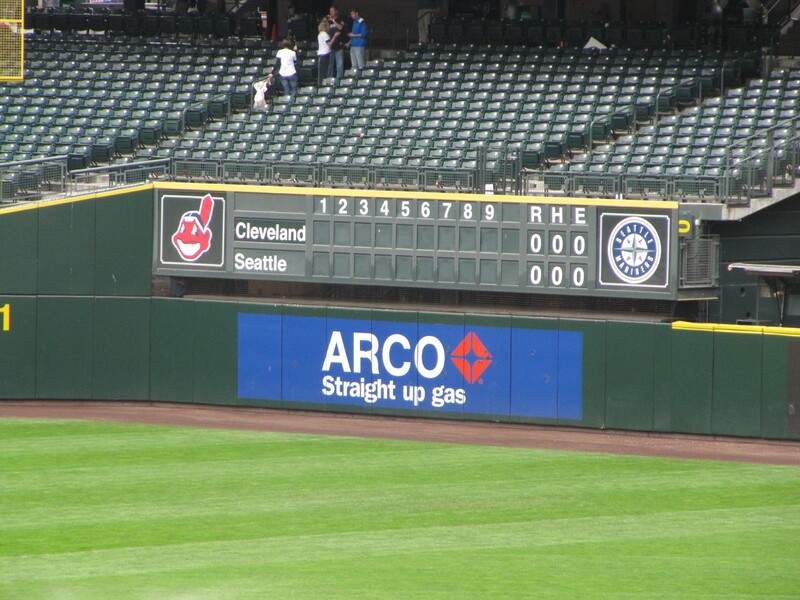 ….because I thought it was cool that it had a scoreboard for the fans standing in the concourse behind the seats. 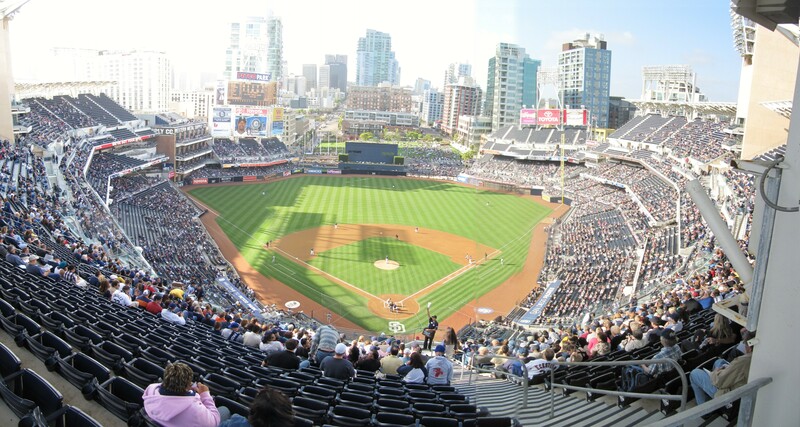 After the Mariners left three runners on base in the top of the first, the Padres showed them how to take advantage of scoring opportunties. 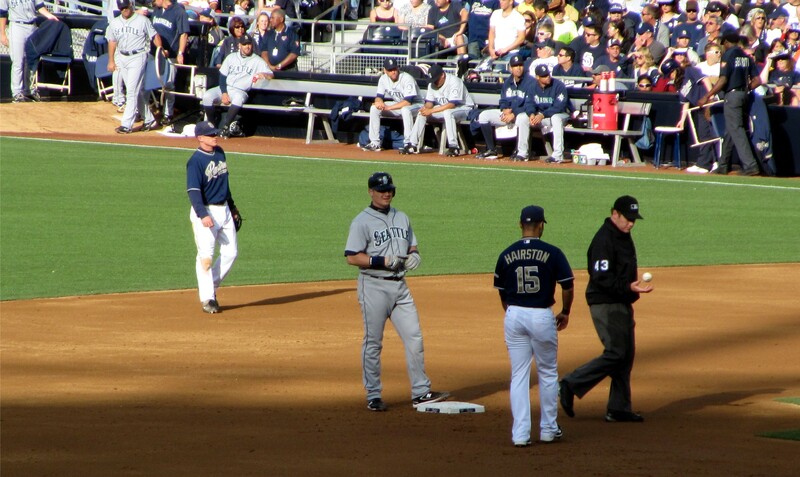 David Eckstein led off with a single and was replaced on first after Chase Headley hit into a fielder’s choice. 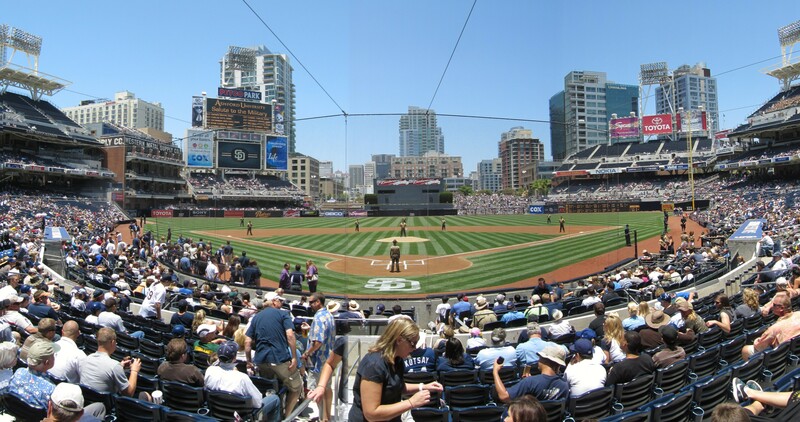 Adrian Gonzalez then blasted a two run bomb to put the Padres up 2-0. 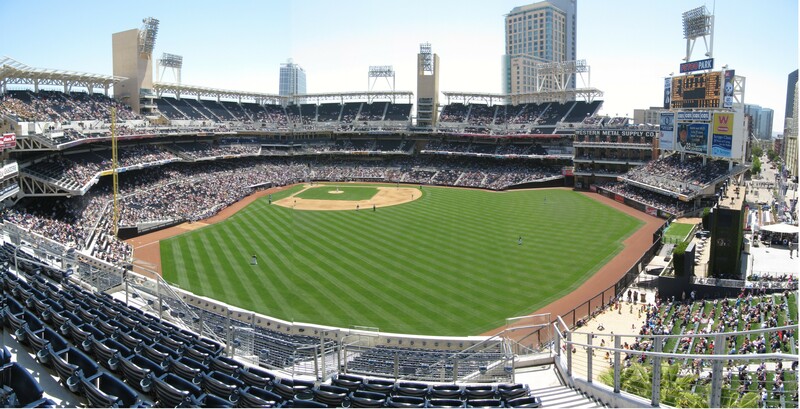 Unfortunately, that was all the offense the Padres would need. Still, it was a good game and the Mariners were in it until the end thanks to a solid outing (despite the loss) by Cliff Lee — somehow I failed to take a single picture of Lee at this game. …that landed behind third base just in fair territory and Johnson scored from second. I am not positive about this, but I think Gwynn (who I have probably seen play before) completes the third father-son set that I have seen play in the majors. 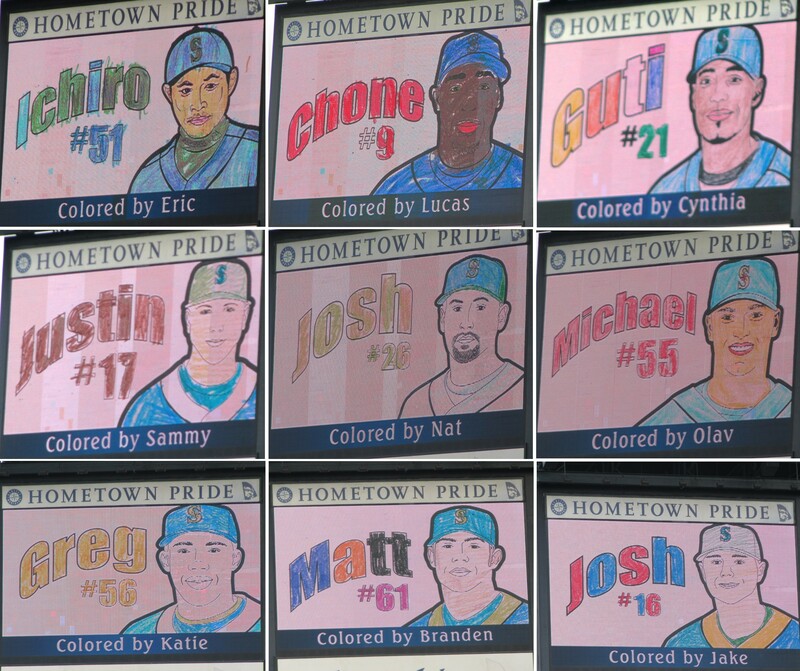 Others include Ken Griffey-Ken Griffey, Jr. and Cecil Fielder-Prince Fielder. Maybe there have been others, but not that I can recall. …pretty impressive, eh? 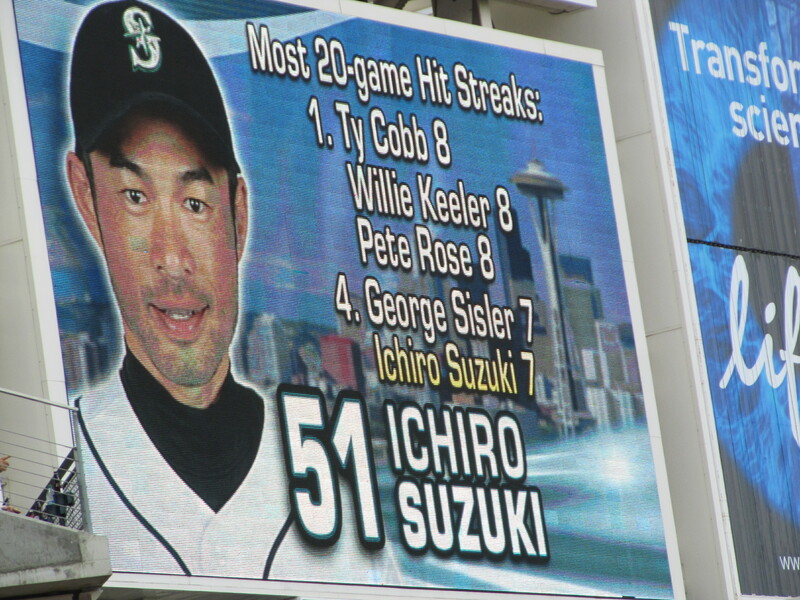 I’m guessing that Ichiro will finish his career in sole possession of the lead on this list. 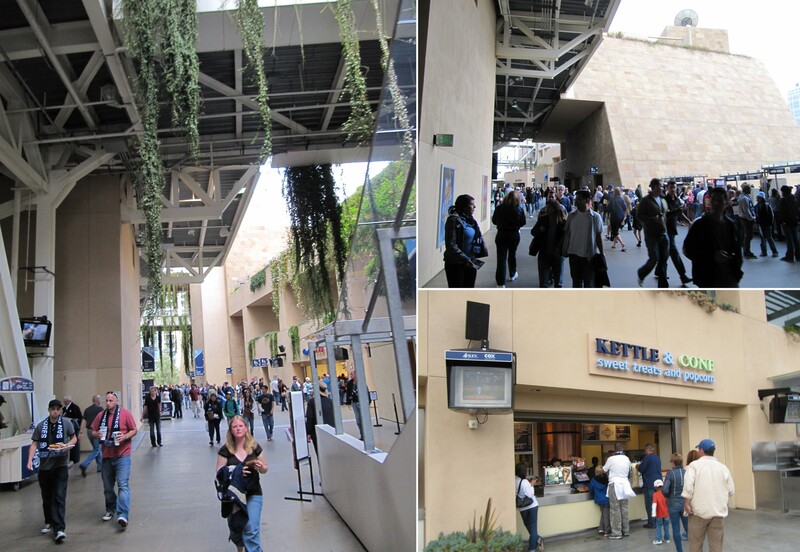 In that upper right picture, that big wall to the right is a slanted wall that runs from the upper deck all the way down to the ground outside the stadium. I finally found the “Kettle & Cone” stand where they have ice cream helmets. 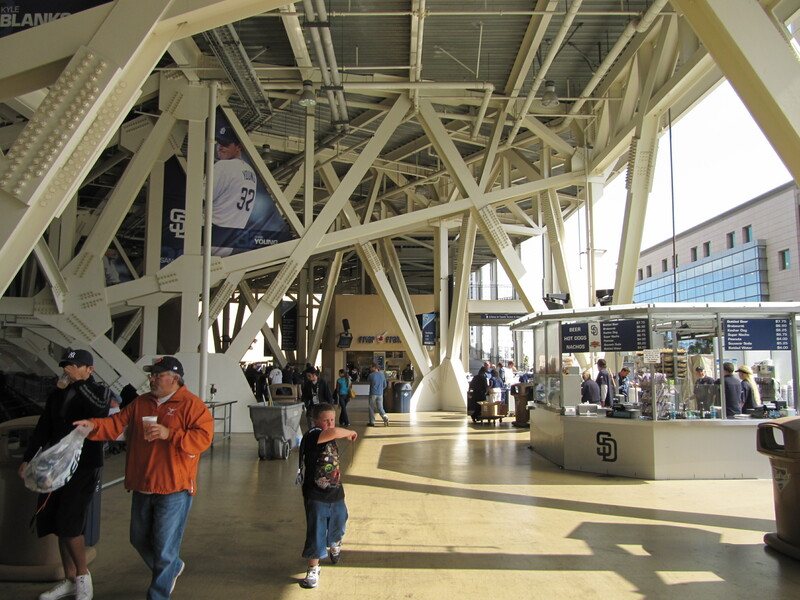 The tricky thing about finding it is that it is not on the main concourse. 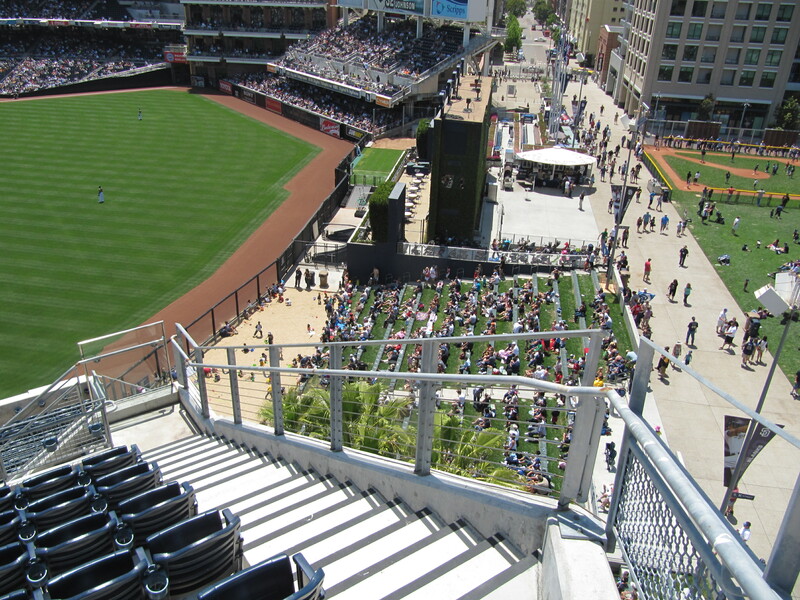 Rather, it is behind the concourse (if that makes sense) on the 3B side near home plate. Actually, in that upper right picture (with the slanted wall) if you click on it to view it full sized, you’ll see part of a red sign over a opening in the wall to the right. The red sign says “MERCADO” and the opening in the wall is a hall way that leads back behind the concourse to a big bar and a couple different food stands. That’s where the ice cream helmets can be found. …it is like there is a little cubby hole below the subway sign. I have no clue what that is all about. How’s that for treating your guests poorly? 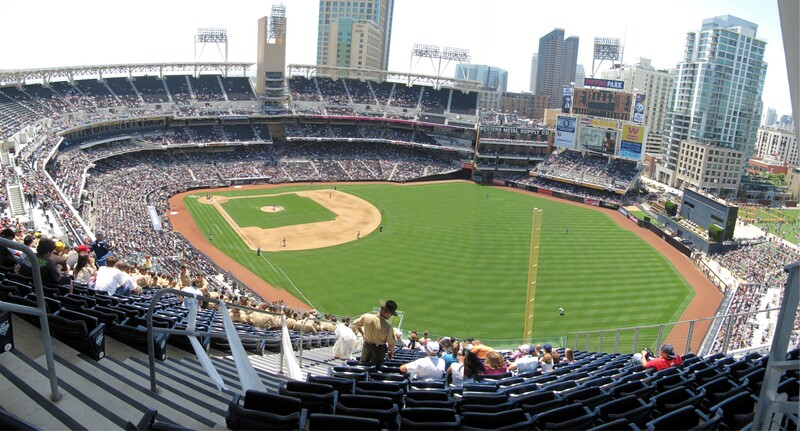 The Padres get your standard modern bullpen and the visitors get to sit in foul territory like its still the 1980s or something. …punching out holes on the ballot. Together, they voted for the entire National League on this ballot. Tim was very proud of his completed ballot. …stranded on base longing to touch the plate. 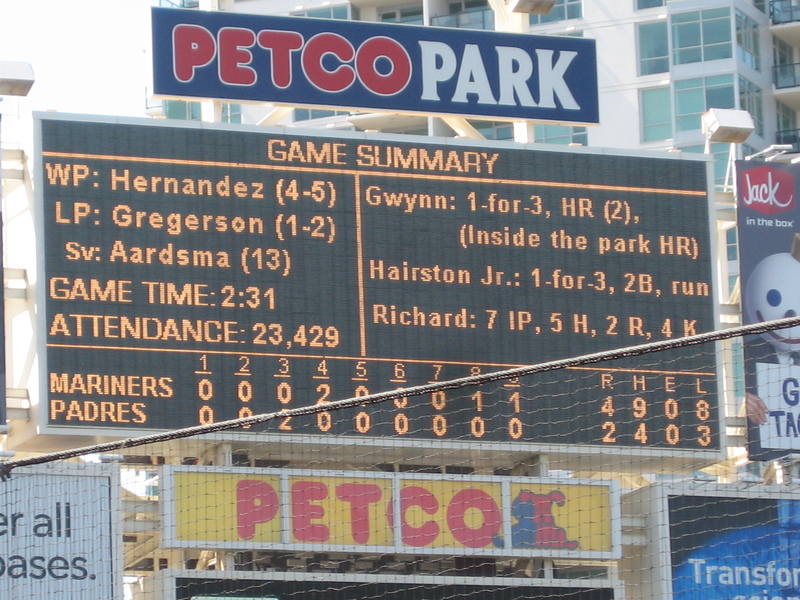 Over the course the game, the Mariners had 12 runners left on base and the Padres had a mere 2 LOB. …by the way, I bought some wet wipe before this game because I had forgot to bring any on the trip. I usually use them to wash down Tim’s chocolate covered face after he devours an ice cream helmet. Unfortunately, after buying the wipes, I misplaced them under the car seat and never took them to a single game on this trip. Therefore, like in this picture, Tim’s face was a bit chocolatey a lot during this trip. 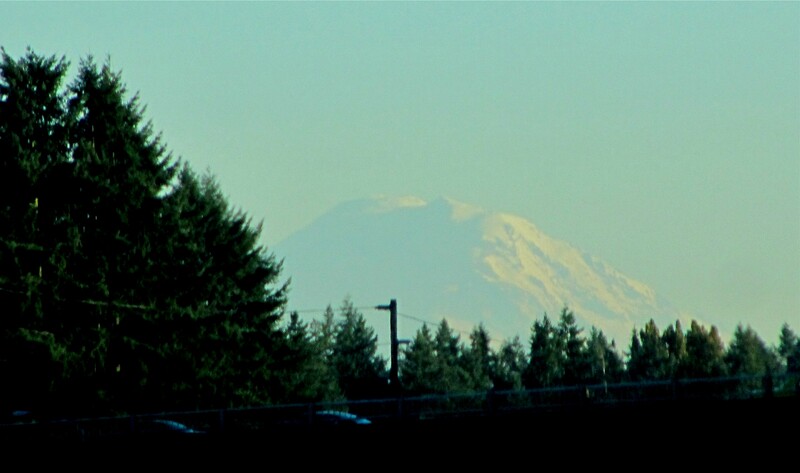 …and that was our view of the last inning or two. I guess in that picture you can tell better than before that he is wearing a full baseball uniform. 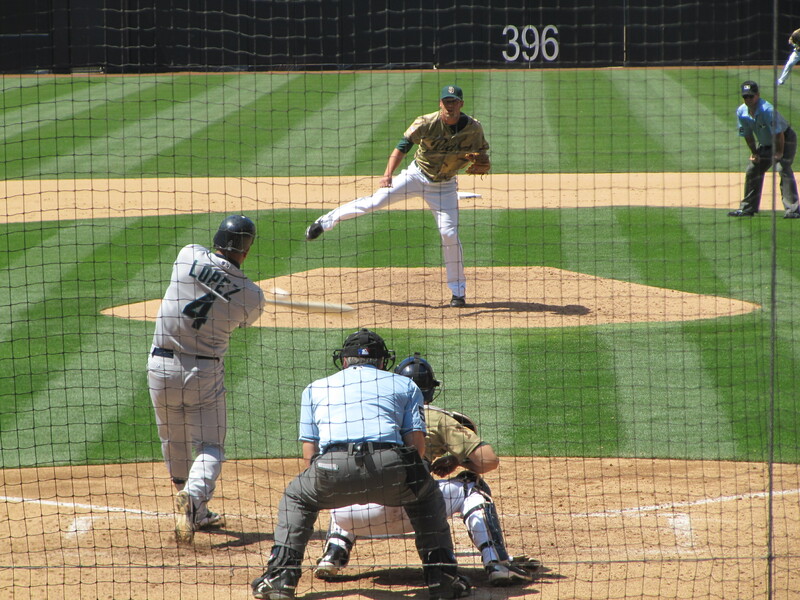 Although it was only a two run game when Lee handed the ball off to the M’s bullpen in the 8th inning, the M’s relieves quickly put the game out of reach. Sean White got only one out in the 8th inning, but gave up 3 runs. Brandon League got the final two outs in the 8th and gave up one more run. Actually, to be more precise, I should mention that two of Sean White’s runs actually scored on a 3-run homerun that League gave up to pinch hittig Oscar Salazar. After it was a close game for most of the night, the final score was an ugly 7-1 loss. 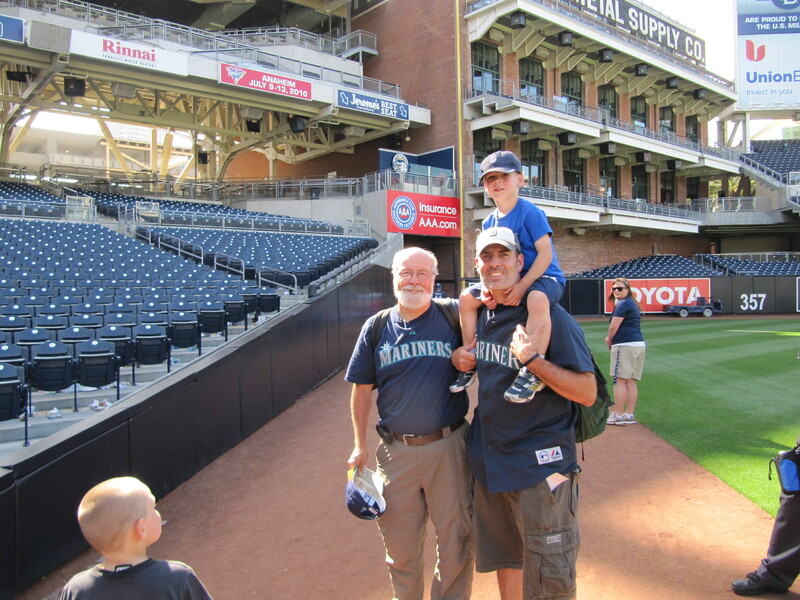 But it was a fun night at the park and it was great to see the Mariners and get to know Petco Park. 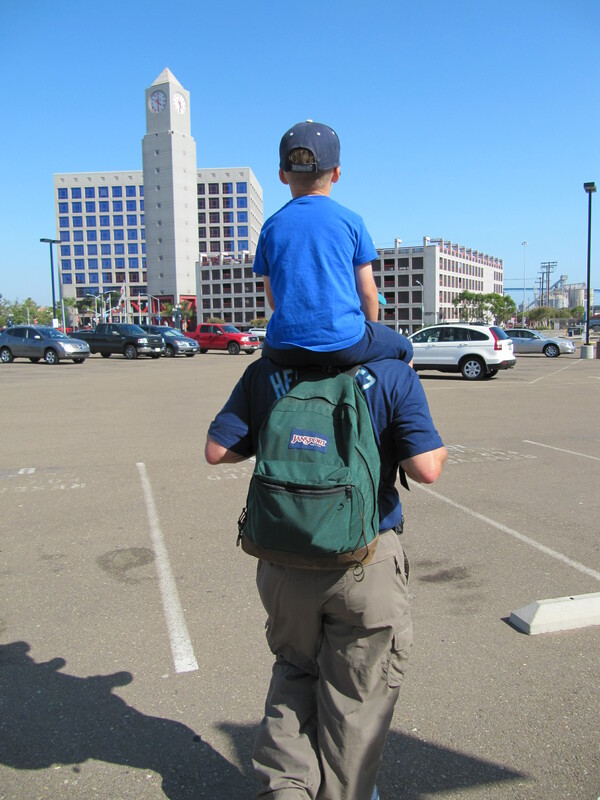 …and then we headed to our car. 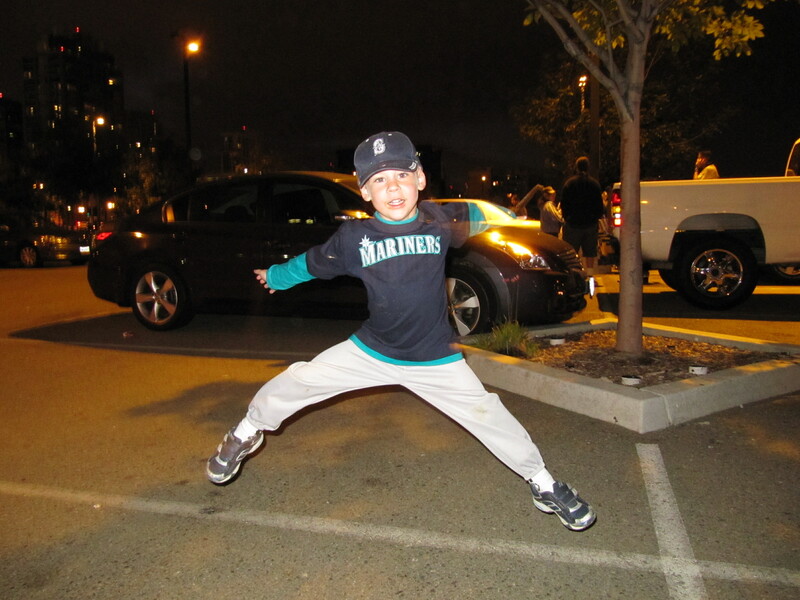 …when I showed him this one, I told him he jumped so fast that his arm disappeared. He was pretty proud of that. He crashed out soon after hopping in the car. 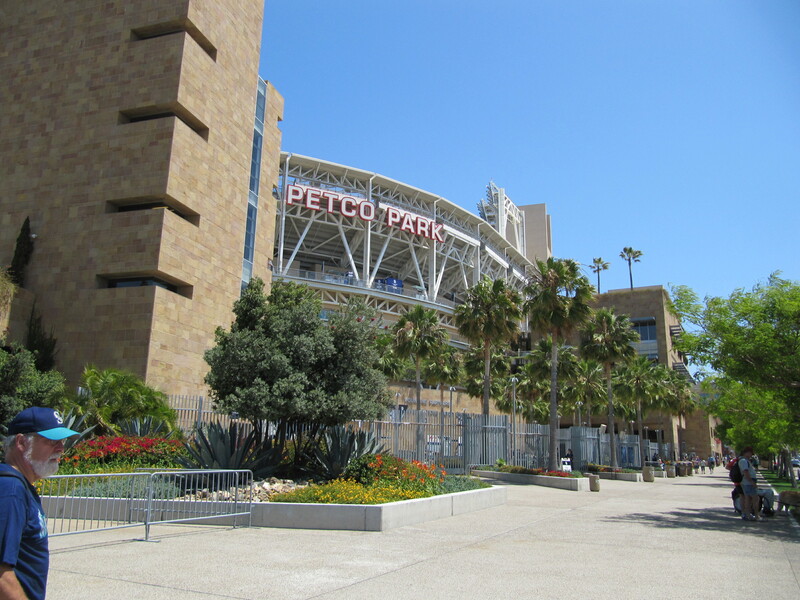 In just about 12 hours, we would be back at Petco Park for a day game and hoping to see our second Mariners win of 2010. 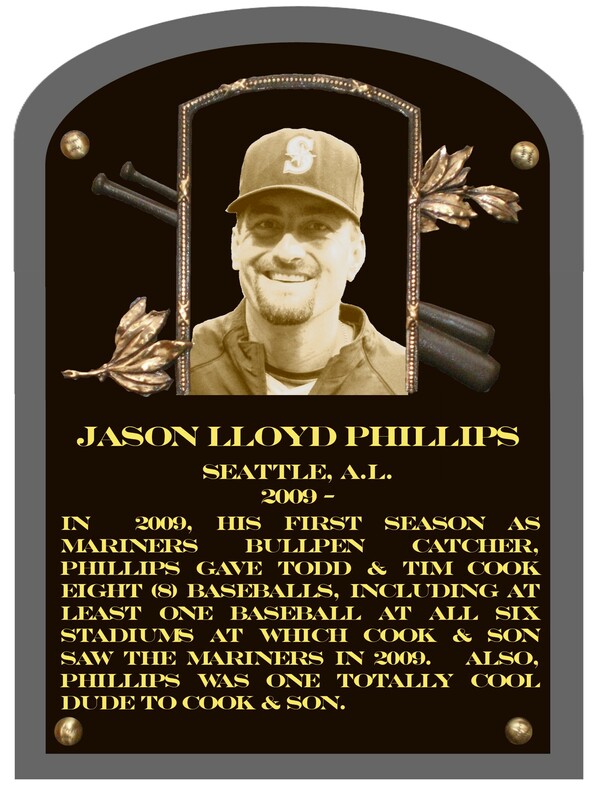 Last season, I created the Cook & Son Hall of Fame and inducted Mariners bullpen catcher and former big leaguer Jason Phillips as the first member as a way to honor and say thank you to Phillips for being so incredibly nice to me and Tim and making the 2009 season extra special. 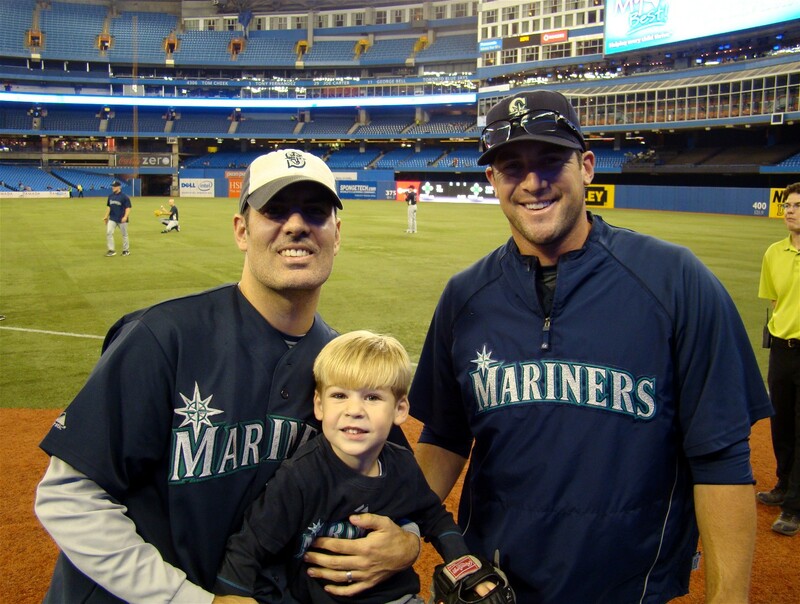 In May, I mentioned in a entry about our first Mariners game of the season (and our last game ever seeing Griffey play) that I we had an amazing interaction with Mariners pitcher Ryan Rowland-Smith, which followed an amazing interaction that we had with him last September in Toronto. 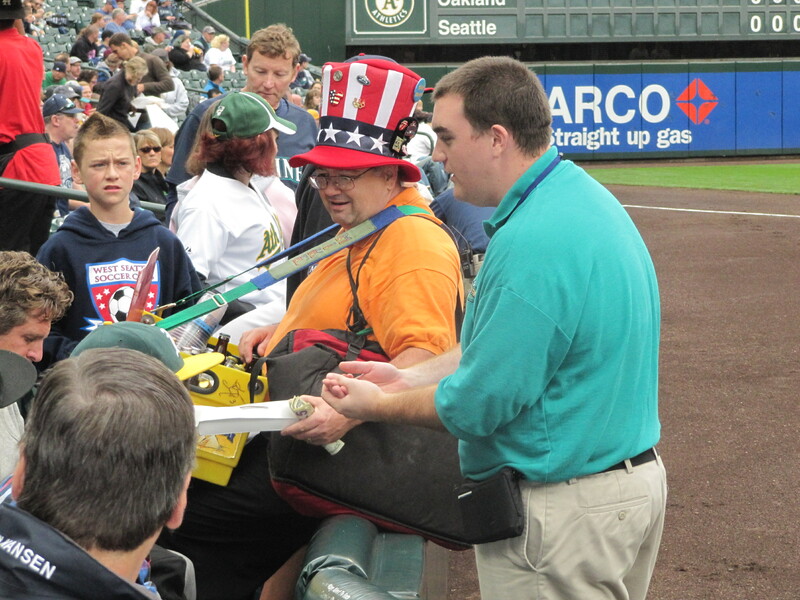 Since that game in Baltimore, I have had plans to induct RRS as the second member of the C&S Hall of Fame, like Phillips based on his going above-and-beyond the call of duty in terms of fan friendliness. But, in the meantime, my favorite player of all-time (and Tim’s second favorite behind Ichiro), Ken Griffey, Jr. retired. 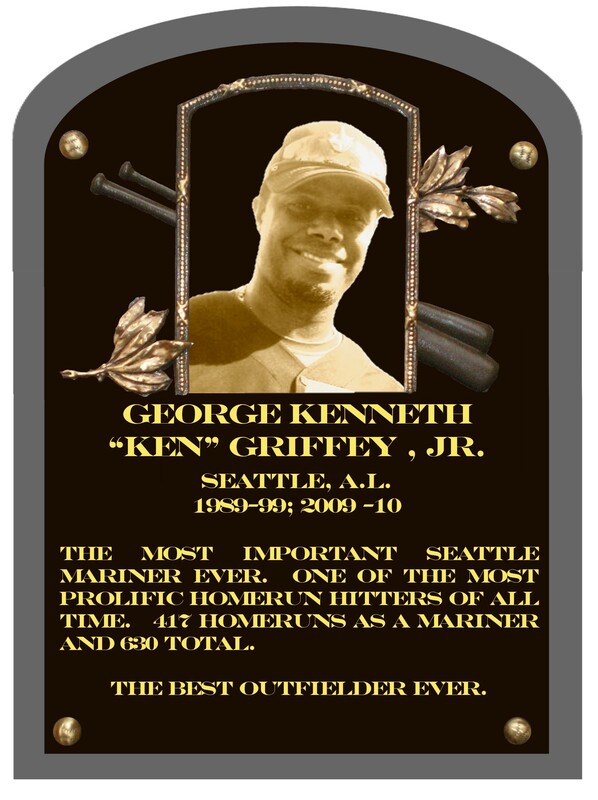 I have known all along that I would induct Griffey into our little Hall of Fame as soon as he retired, as the first player to go into the C&S HOF based on his on-field achievements. So, with his sudden (and personally sad) retirement, Griff jumped RRS in order of induction. But now it is RRS’s turn. Let’s recount the extreme coolness of Mr. Ryan Rowland-Smith. 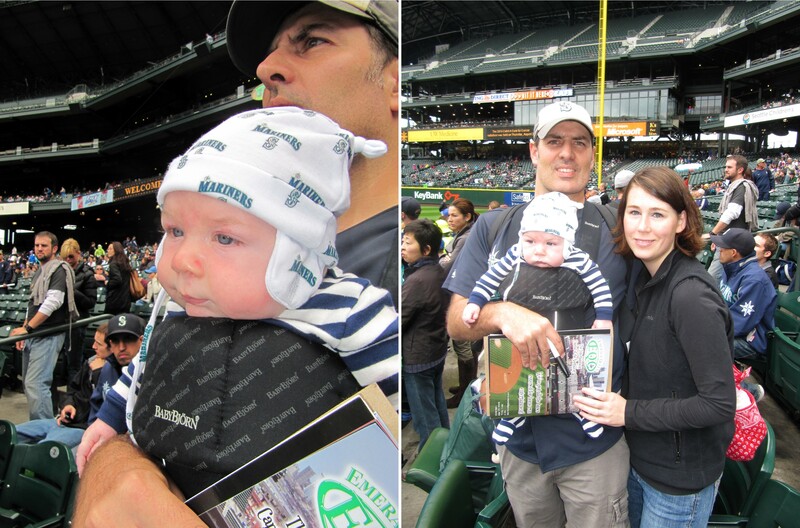 Our first encounter with RRS came in August 2007 at Tim’s second career Mariners game and first career road game. It took place at Baltimore’s Camden Yards (at a time when they had no ice cream helmets!) and it was very brief. 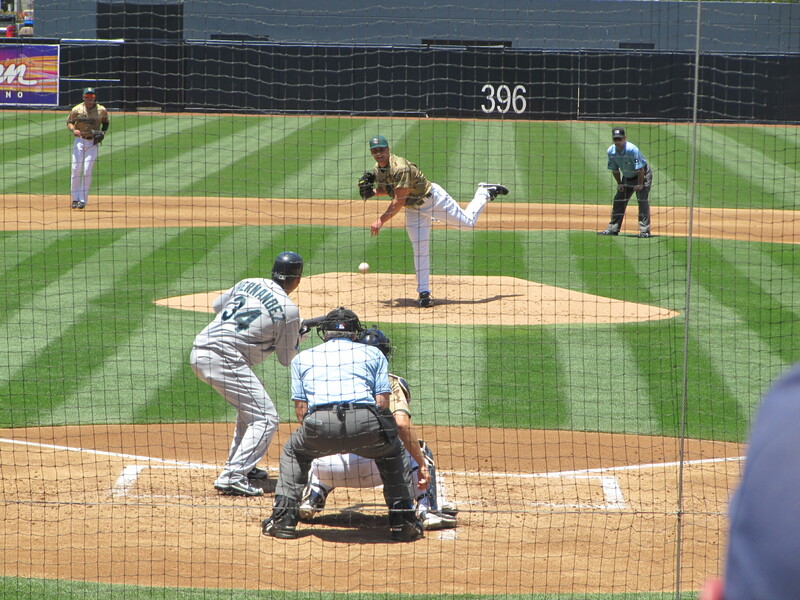 RRS pitched 1 innng in relief as the Mariners extended their record to 2-0 in Tim’s two Mariners games. 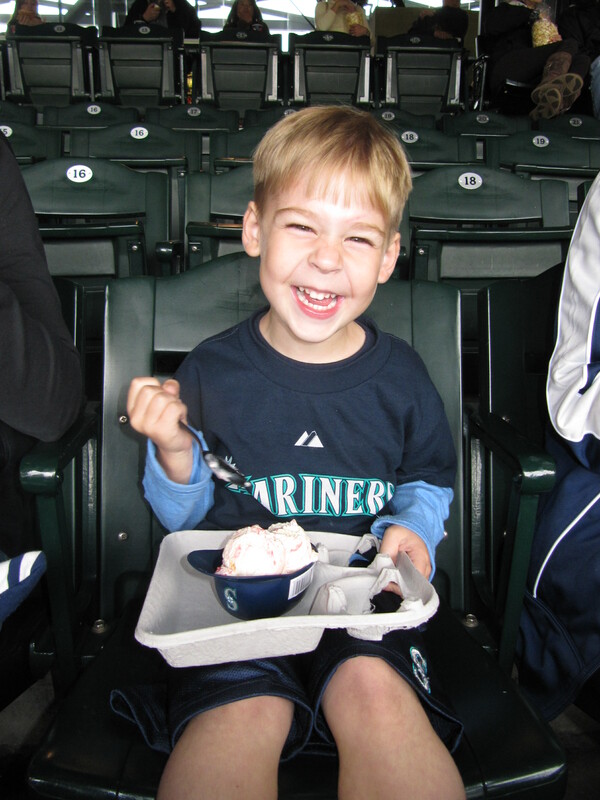 In 2009, Tim hit his stride as a baseball fan. 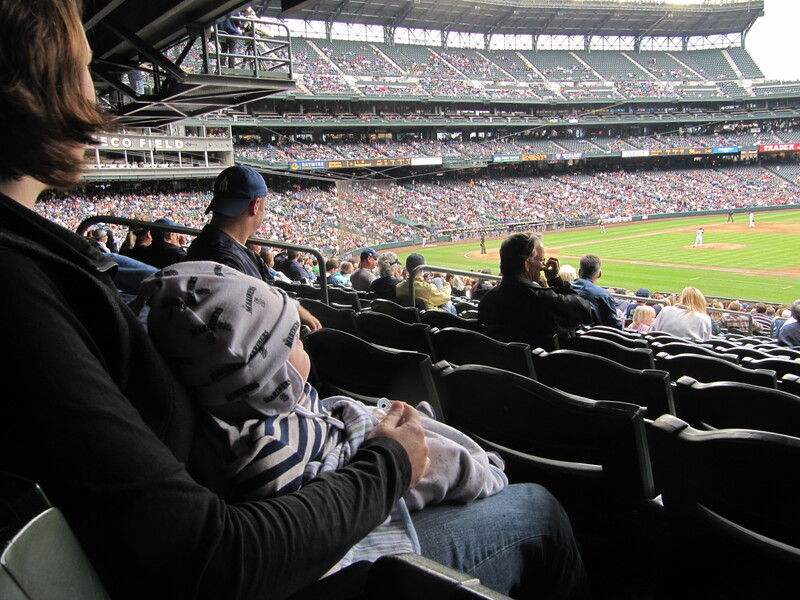 He was finally old enough and had enough energy to go to batting practice and still stay awake for an entire MLB game. 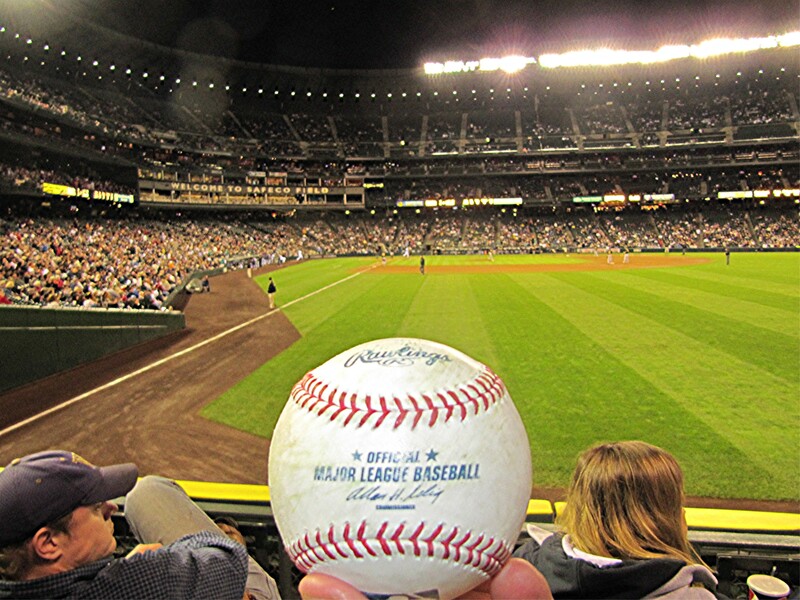 By September, we had collected a bunch of baseballs from BP, many tossed up to us by our beloved Mariners. But there was one problem. All of the baseballs had either been tossed to me or handed to Tim. This made Tim feel downright childish (of course, he was only 3 years old). 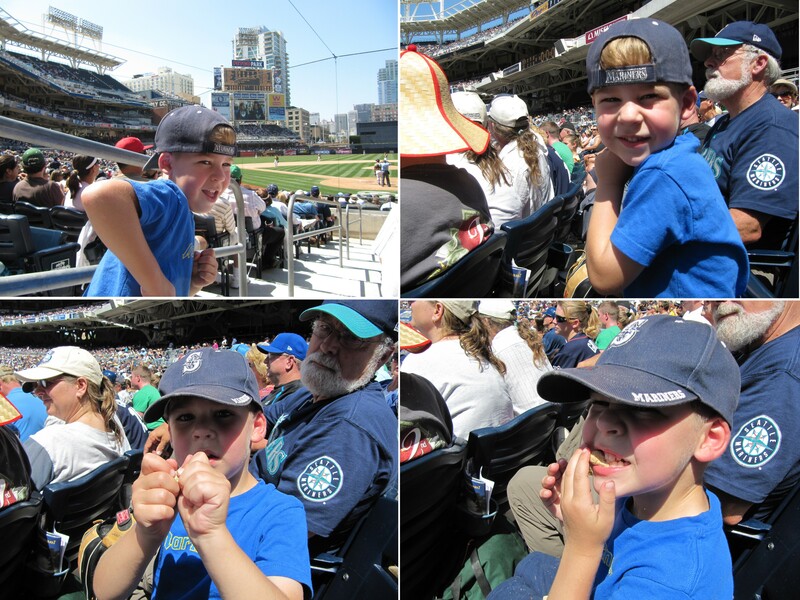 Late in the season, he started telling me that HE wanted to catch a baseball at game. My thought was that I could get Jason Phillips help us with Tim’s request. So we headed to Toronoto in late September 2009 with a goal of having Tim catch a baseball in his own glove, most likely thrown by Jason Phillips. But there was no BP! So when I ran into and chatted with Phillips before the game, Tim was off in the kids play area with his mom. 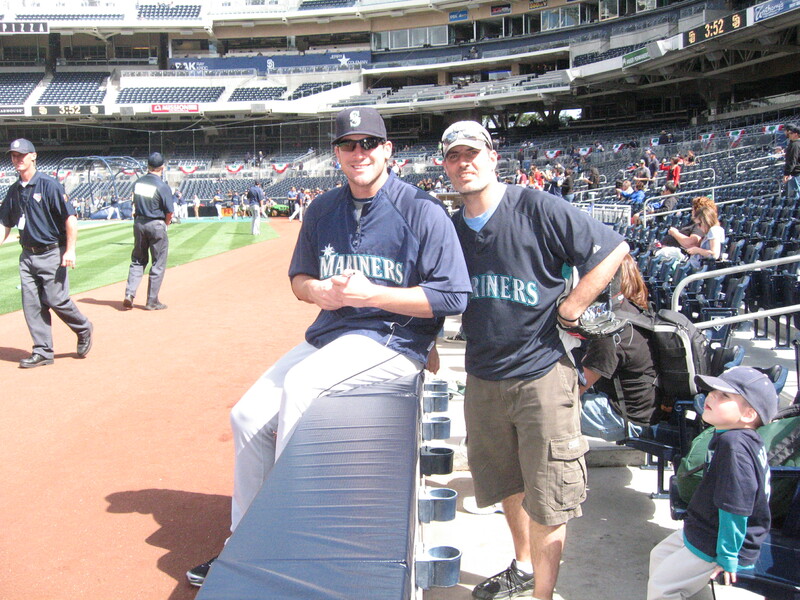 Tim and my wife joined me in the field level seats shortly thereafter and we hung out and watched a bunch of the Mariners pitchers warm up. Enter Mr. Ryan Rowland-Smith. 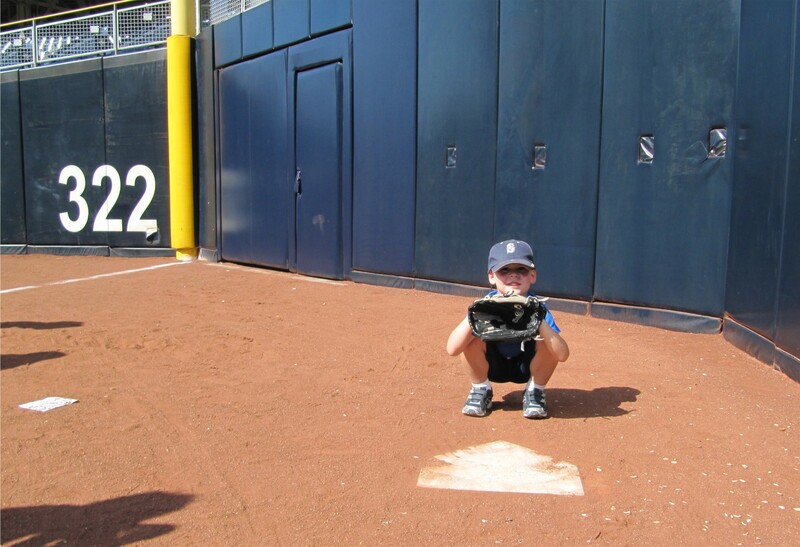 While setting up that picture, I asked RRS if he would throw the ball in his glove to Tim. He agreed. Now, this next sentence I have re-written about 10 times and just can’t properly convey the feel. But I was struck by RRS’s tone and demeanor during this exchange. 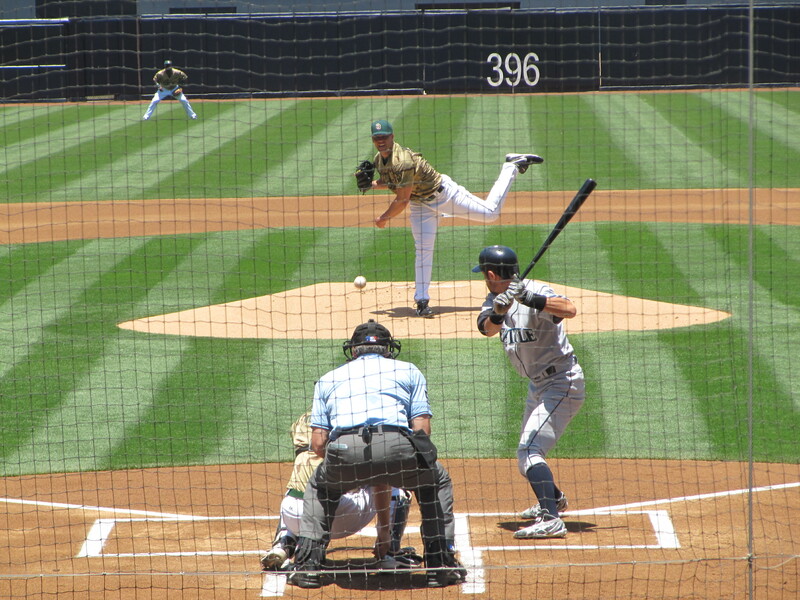 He conveyed the feeling that there never could be any doubt about my request, of course Tim had to have that baseball. RRS then went on signing. He was still standing right next to us when someone didn’t have a pen. He asked if anyone had a sharpie. At the same time, Tim told me he was sad because he didn’t catch the ball. I handed a pen to RRS and asked him if he would re-throw the ball to Tim so he could try to catch it again. Of course, he would. He signed the girl’s baseball and then grabbed Tim’s baseball, walked all the way across the warning track, and tossed it to him again. And Tim caught it! It was a great moment made possible by one incredibly nice Aussie. I should mention that at some point during these exchanges with RRS, I told him that it was excellent that he was No. 18 and I mentioned that I was No. 18 when I played baseball. In fact, I am still to this day No. 18 in my softball league. He asked me why I liked 18. I didn’t have a good answer. I just do. I think the genesis of it was that I just thought it was a cool looking number on the back of Darryl Strawberry’s jersey back in the day. He didn’t mention why he picked 18, but I later read on his (now inactive) blog that the M’s just gave him the number and he thought it was cool because the best pitcher on a team in Japan is usually No. 18. I have no clue if that is true, but I do note that Diasuke Matsuzaka wears No. 18. (I just found this blog entry on this topic). Anyway, lets fast forward to March 2010. Spring Training was in full swing. I was busy planning out our 2010 baseball season. One of the topics on my list was to figure out my 2010 game uniform. 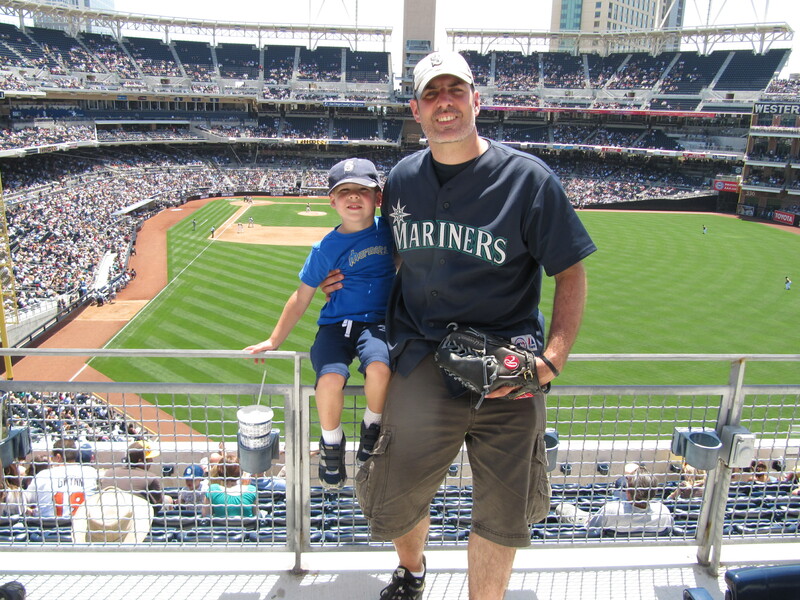 If you haven’t noticed, I wore essentially the exact same thing to every game in 2009: green cargo shorts, button up M’s jersey, M’s official 2009 game undershirt, and white/blue M’s hat). I was wondering if I should switch it up for 2010. I think I must have been watching an M’s spring training game on MLBNetwork at the time with RRS pitching or maybe I was watching an internet video clip interview of RRS. Whatever I was watching, I got a flat out ridiculous idea. 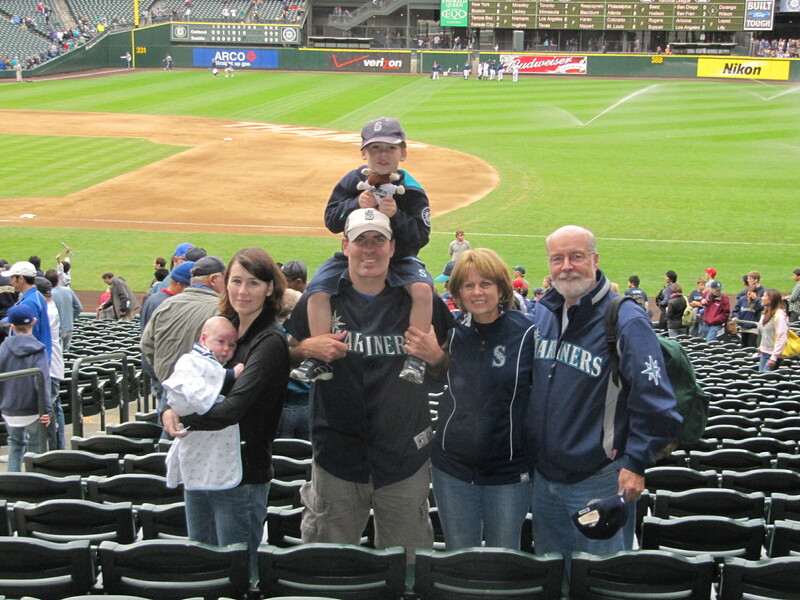 The next day, I went to package up the letter in an envelope and send it off to the Mariners spring training facility in Peoria, Arizona. A little embarrassed, I showed it to my wife and we agreed there was a essentially a 100% chance that I would never hear anything from RRS in response to the letter. I mailed it off, didn’t tell anyone else about it, and went on living life. 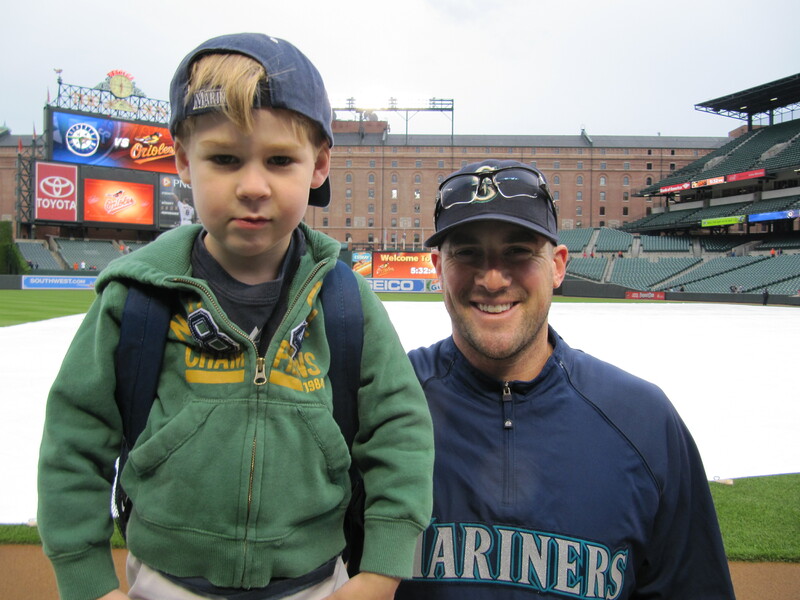 Eventually, we met up with the Mariners in Baltimore for the first time of the 2010 season. It was a damp May day with no BP. So we had a lot of time to kill before the game started. 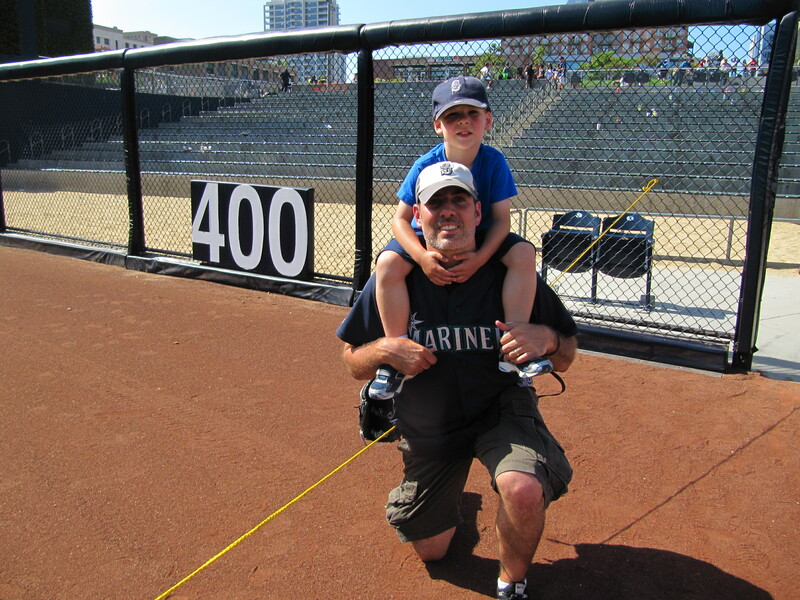 Tim was sitting on my shoulders as we stood in the CF seats just watching the activity around the ballpark. I’d basically forgotten about the letter. Not really forgotten that I sent it, but figured it was a moot point and a done deal. I’d already noticed on TV that the Spring Training jerseys were also being used as the M’s BP jerseys. So weeks earlier when I noticed that fact, I officially gave up any hope (not that I ever actually had any) of my letter bearing fruit. RRS: You wrote me that letter (sizing up a sheet of paper with his fingers), right? RRS: Sorry, I didn’t get back to you. I didn’t know how to get a hold of you. RRS: So, whats the deal? I mean, do you still want it? TODD: ARE YOU SERIOUS!!!? Of course, I do! Oh, my gosh. Are you serious!? I sent the letter but never thought there was any chance you would actually say yes! I mean the letter was ridiculous! RRS: Oh, no. No problem, man. [NOTE: This conversation had a very similar vibe to the “could you throw Tim that baseball” discussion. The vibe was almost like, “Hey, you asked for my jersey, of course I’m gonna give it to you. Why would you ever doubt it?”]. RRS: Okay. Well, where are you going to be? TODD: (not really understanding the question) I don’t know, here? Wherever you need me to be? RRS: Will you be in Seattle at all? TODD: Yeah, but not until the very end of the season. We’re coming in for the last series of the season to be there in case Griff retires. 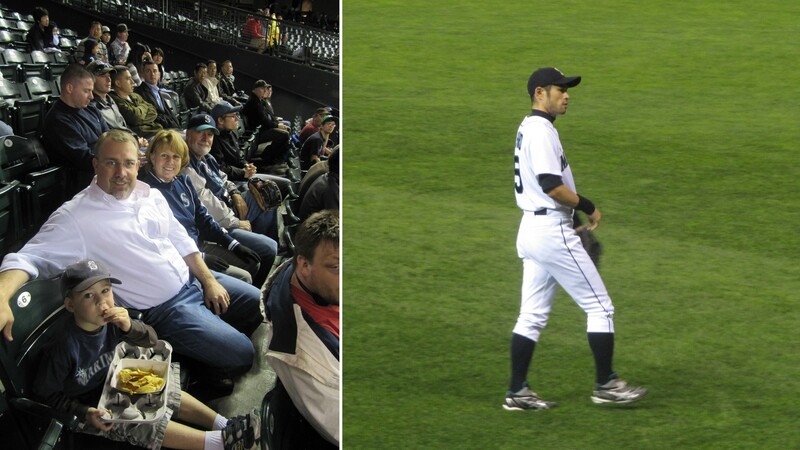 [NOTE: I really wanted to be at his final game, and this actually ended up being the last time we saw Griff play]. RRS: Why don’t we meet up there? I only have one of them. So I can’t give it to you or I won’t have one. But if we’re in Seattle I can just get a new one. TODD: Oh, yeah. I noticed they are your BP jerseys. RRS: Yeah. So I need it for BP. But I can just get a new one if we’re in Seattle. We chatted a little more, but I can’t really remember what exactly we said. …we ran into each other in the infield and RRS posed for another picture with Tim and we chatted again briefly. After this game, I was estatic. WOW! Ryan Rowland-Smith said he would give me his jersey! I mean, that’s ridiculous. I couldn’t wait! Ah, I wasn’t going to be in Seattle until the end of the season! I decided I should make this as easy as possible for RRS. 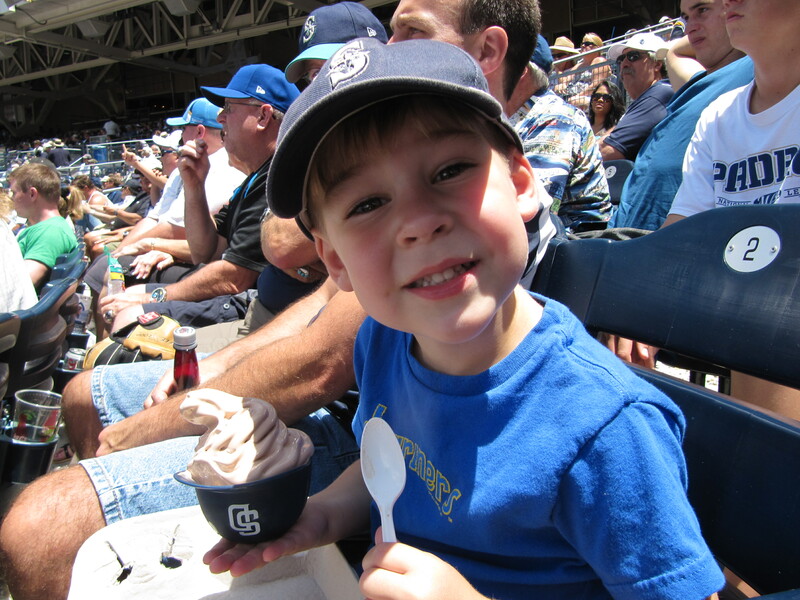 Ideally, I wanted to get it straight from him at the ballpark. But that could be complicated. So I sent him another letter thanking him for being so incredibly nice and generous and awesome. I included a stamped return envelope (a big one) in case he just wanted to mail the jersey. 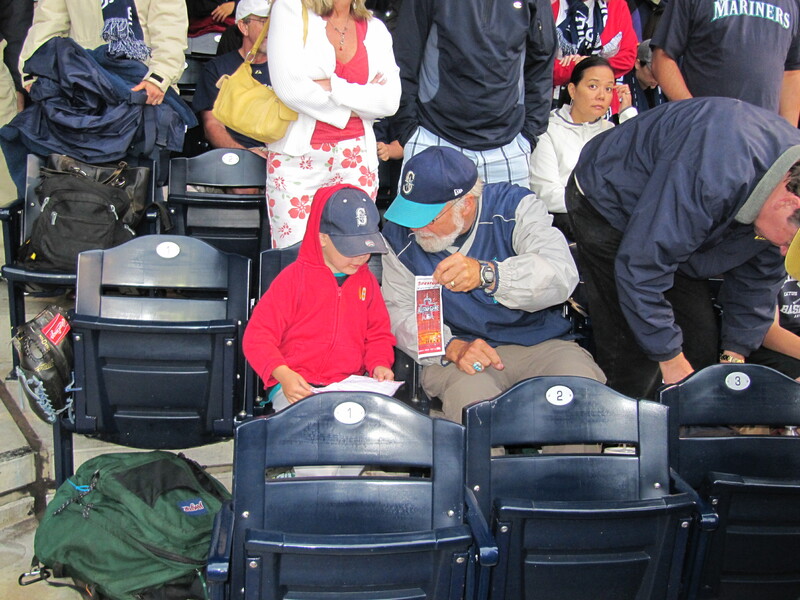 I also gave him a list of all of the Mariners games we would be in attendance for over the rest of the season. Within one week from mailing that letter, my wife called me at work to let me know that I got a big envelope with my own writing on it. I couldn’t wait to get home that night! The jersey, by the way, is HUGE! Size 52! RRS is 6’3″ and I am a mere 5’11”. He needs a lot more fabric to cover his frame! If untucked, the jersey is like a dress on me. I’ve had the jersey about a week and a half now and I still cannot believe it. 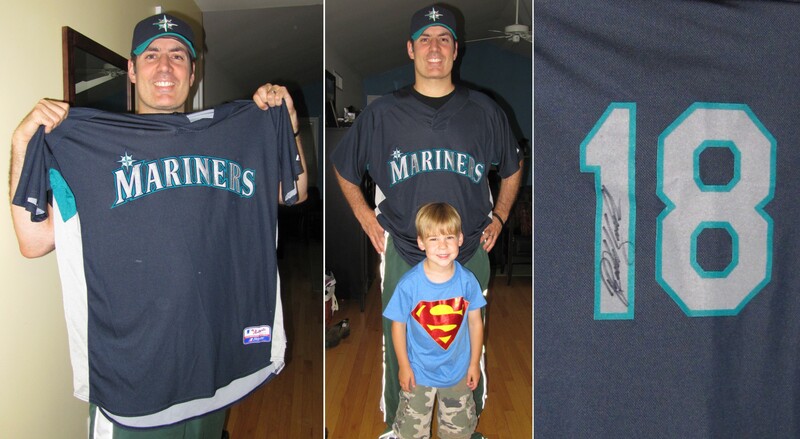 Who has ever thought of writing to a professional baseball player and asking for his jersey? And who has ever heard of it ACTUALLY WORKING!? By the way, the jersey has a few small scuffs on the bottom on one side. I think its cool that it shows some actual “wear-and-tear.” When I opened it, my wife asked, “Is it all sweaty and dirty smelling?” The Answer: No. It was washed and (as my wife and I have referred to it) “Mariner fresh” smelling! 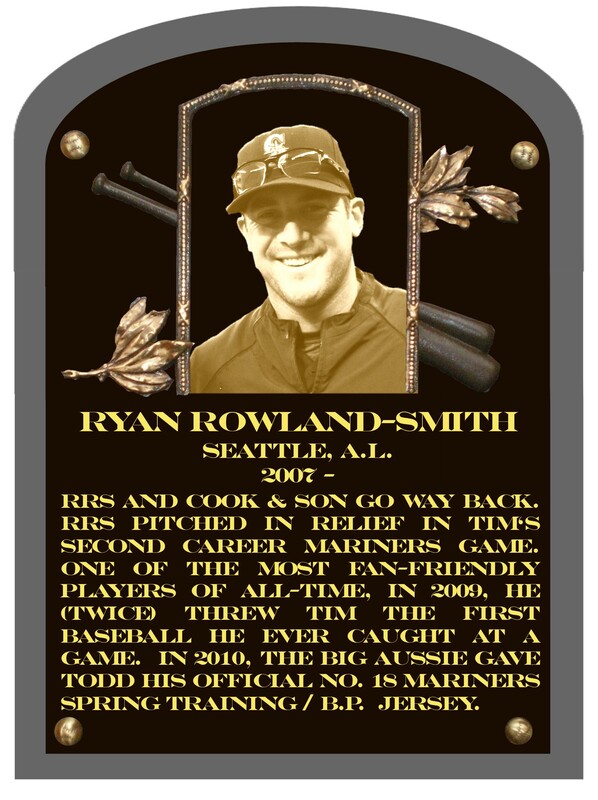 THANK YOU, RYAN ROWLAND-SMITH! (And not just for the jersey, but for being such a down-to-earth, genuine, nice guy). Best of luck to you for a long and successful career, hopefully all with the Mariners! A very kind gesture, but all the thanks go to RRS. And a big congratulations for a strong outing yesterday — see the box score here. Hopefully this outing (five innings, 4 hits and 1 earned run) proves to be the first building block to a successful final four months of the season.